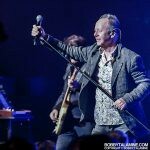 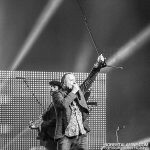 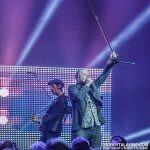 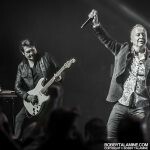 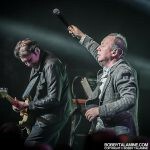 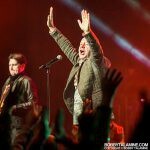 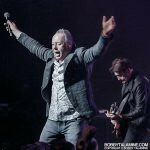 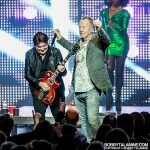 Jim Kerr and Charlie Burchill leading the band through the epic “The Signal and the Noise” from last year’s release “Walk Between Worlds” , before bringing down the hammer with the glorious and still so fresh and iconic “Waterfront”, and cruising into “Love Song”. 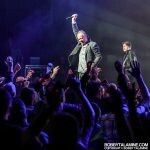 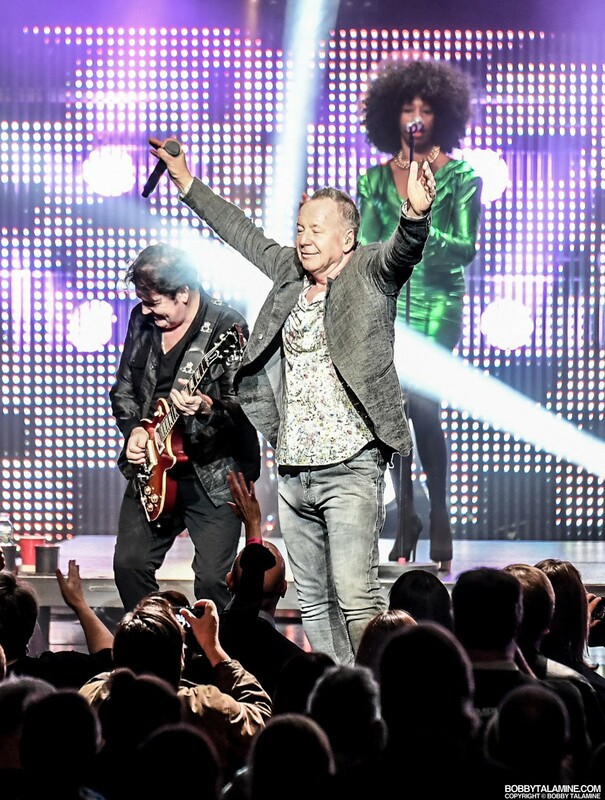 A one – two – three punch of Simple Minds, letting their fans know that they are back – and intact. 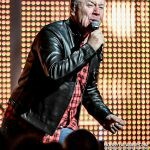 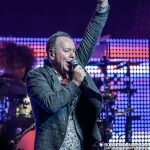 It doesn’t let up from there: what follows are anthems after anthems, old and new, supported by a band that brings the punch and swagger from Simple Minds days of old. 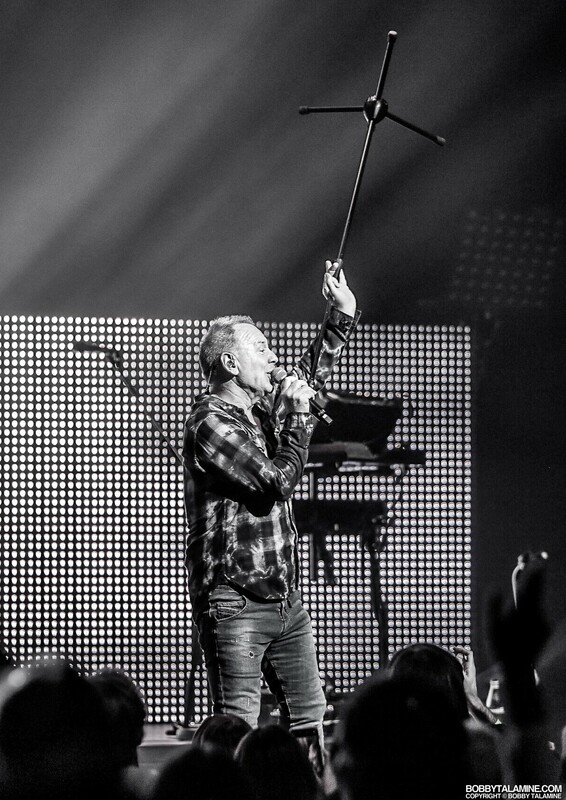 “Up on the Catwalk”? 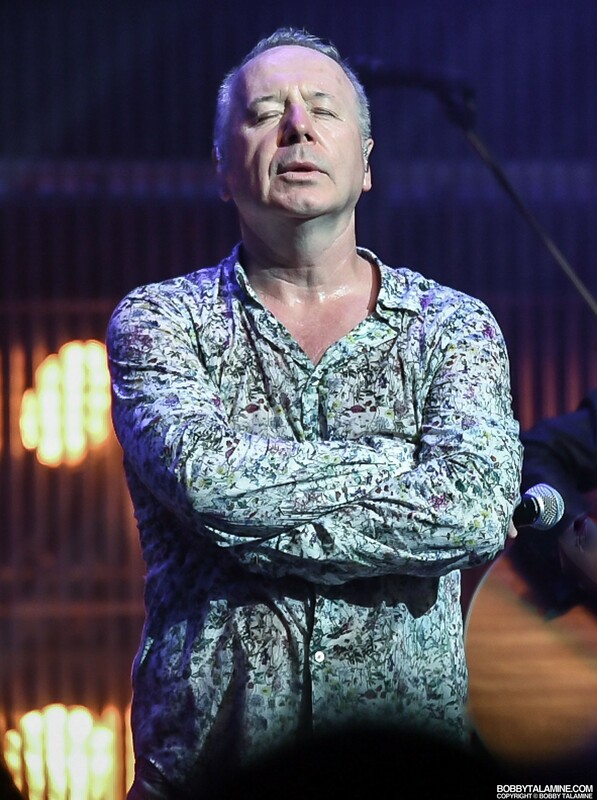 Still sounds fresh like it was written week’s ago. 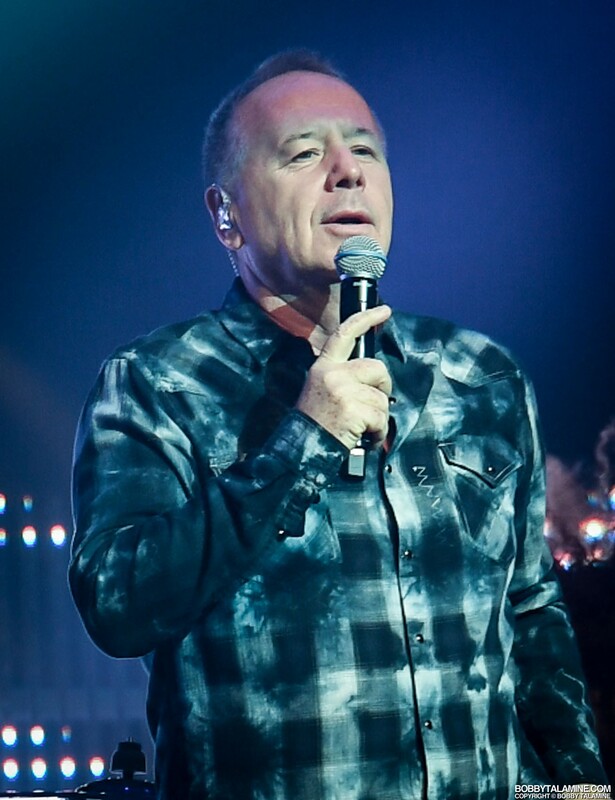 “Promised You a Miracle”? 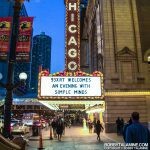 Damn right. 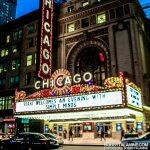 As relevant as ever. 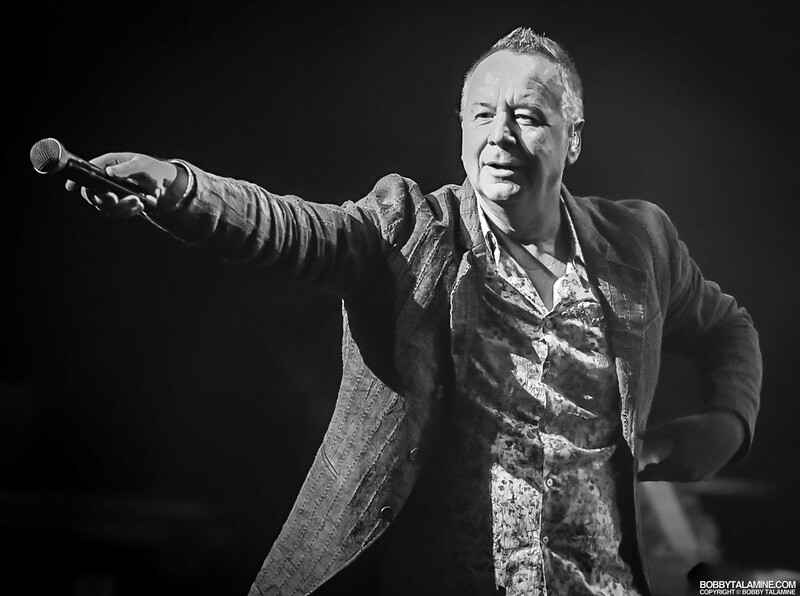 And on and on they come, with Jim Kerr in full voice, and Charlie Burchill pushing forth with galvanizing guitar and synths. 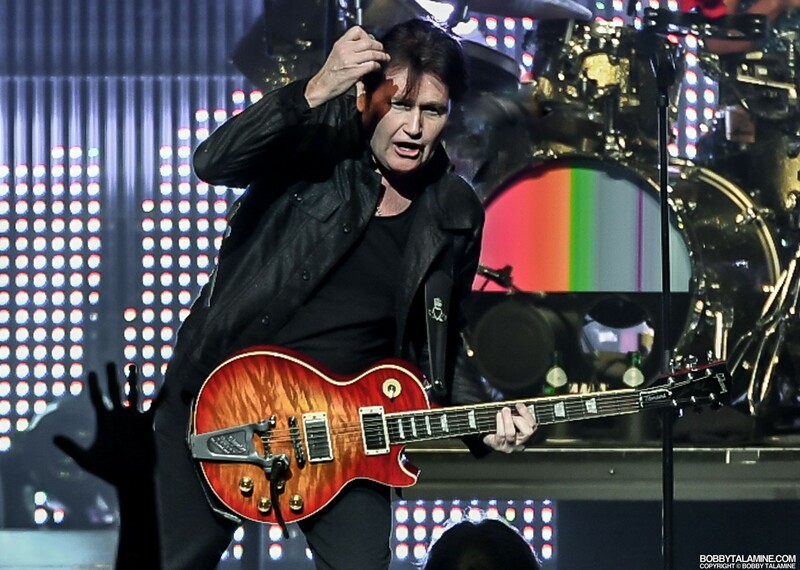 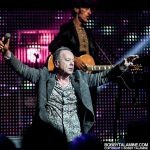 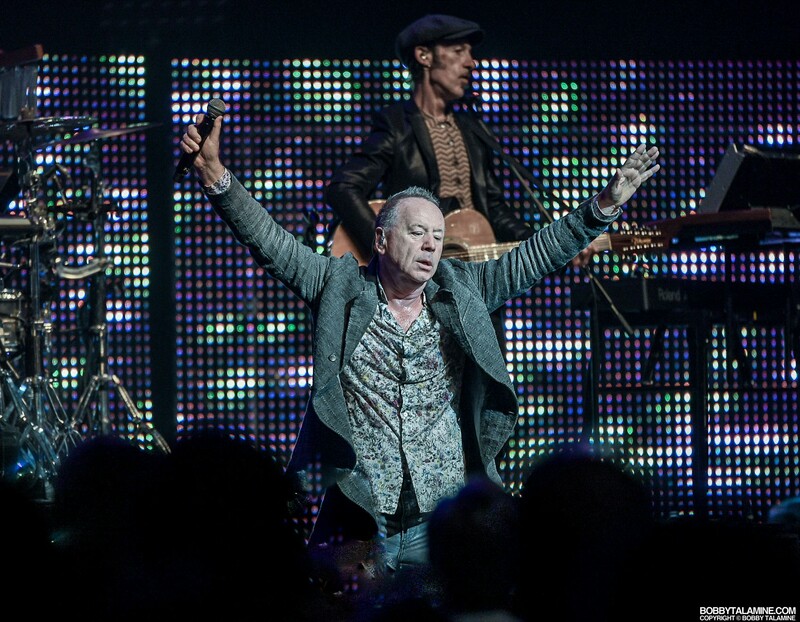 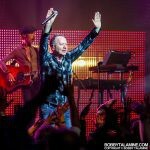 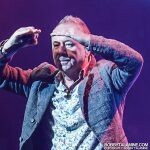 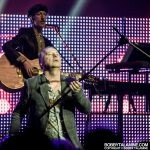 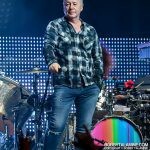 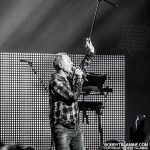 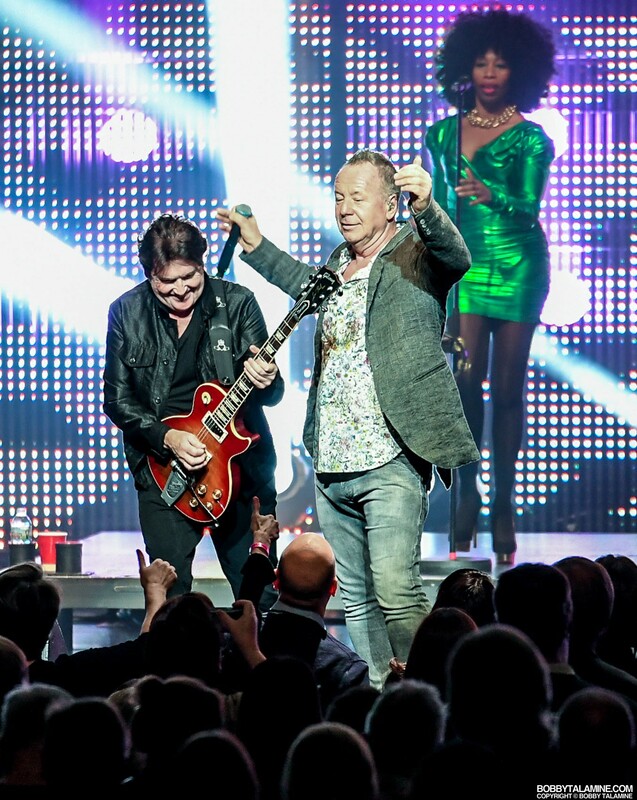 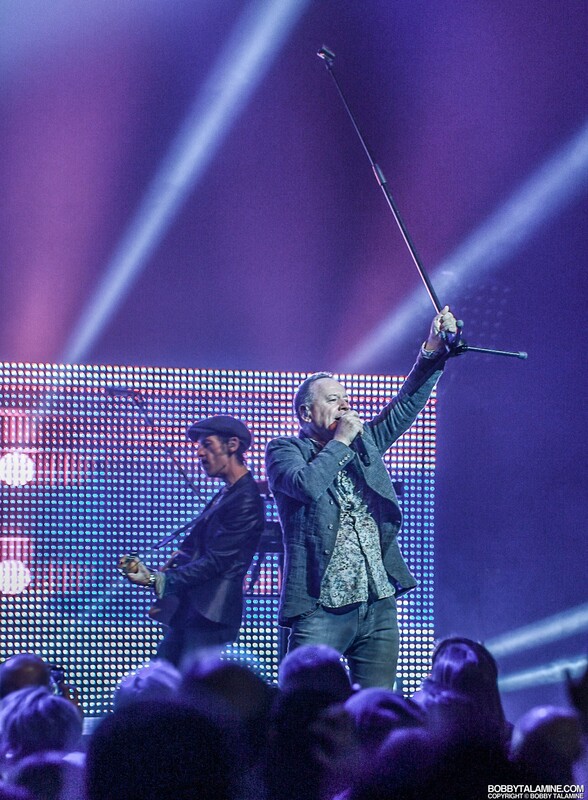 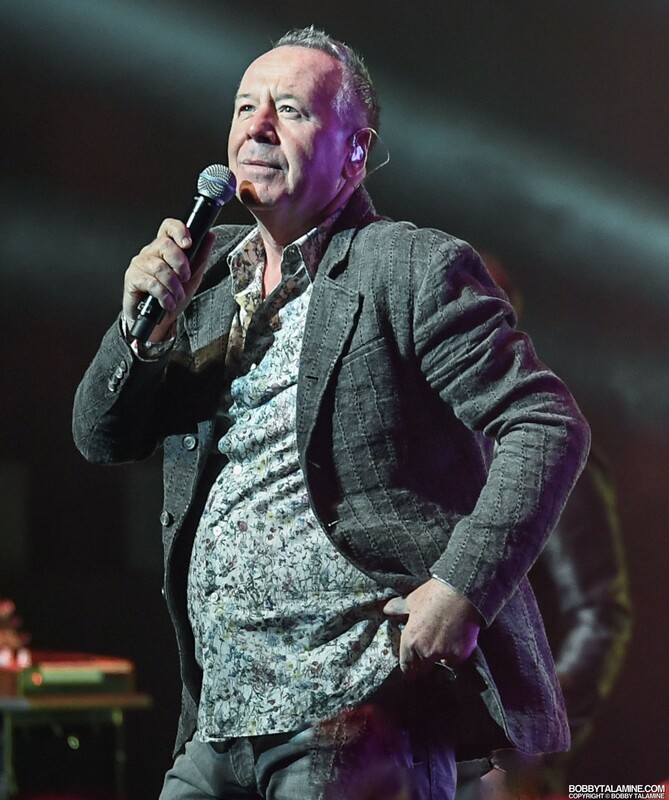 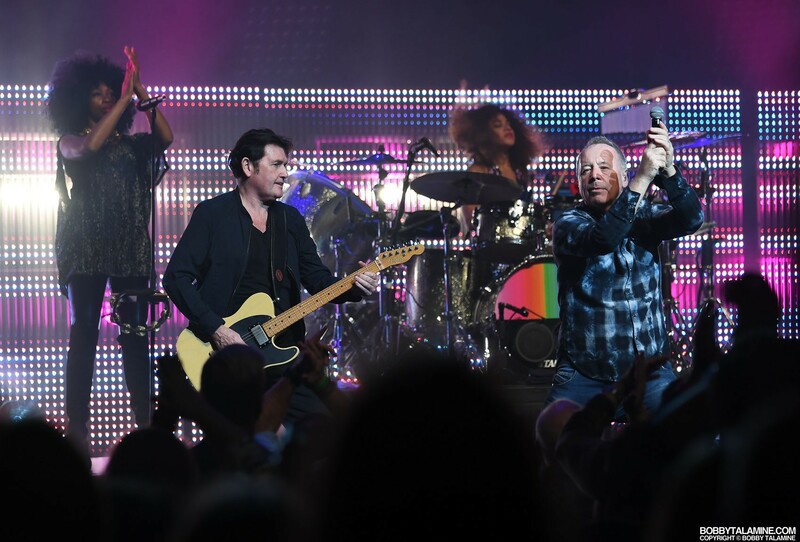 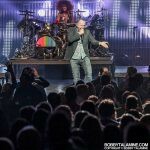 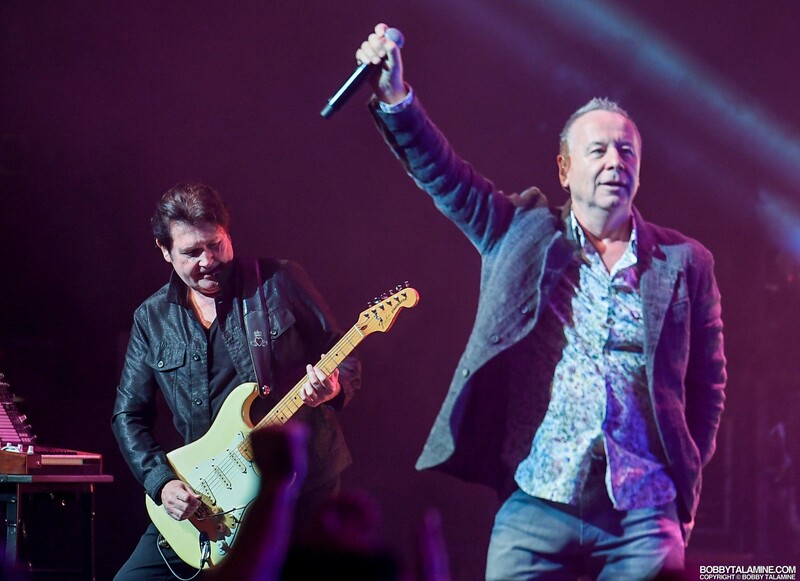 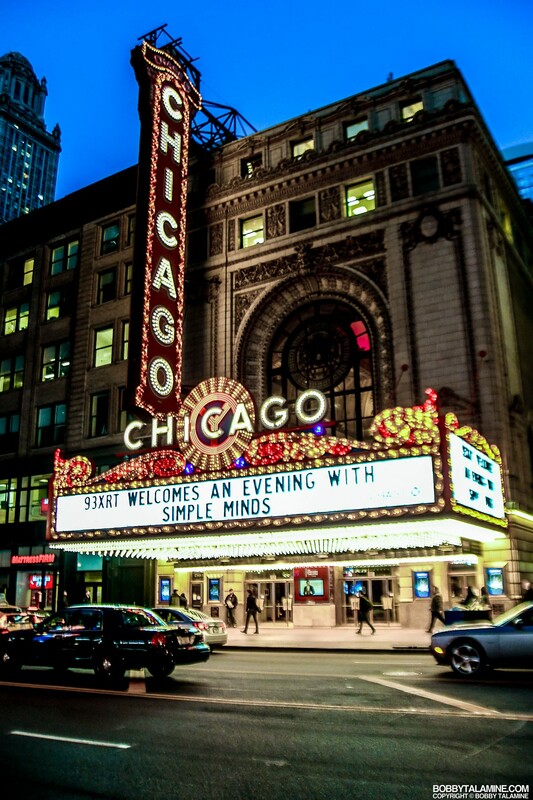 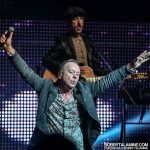 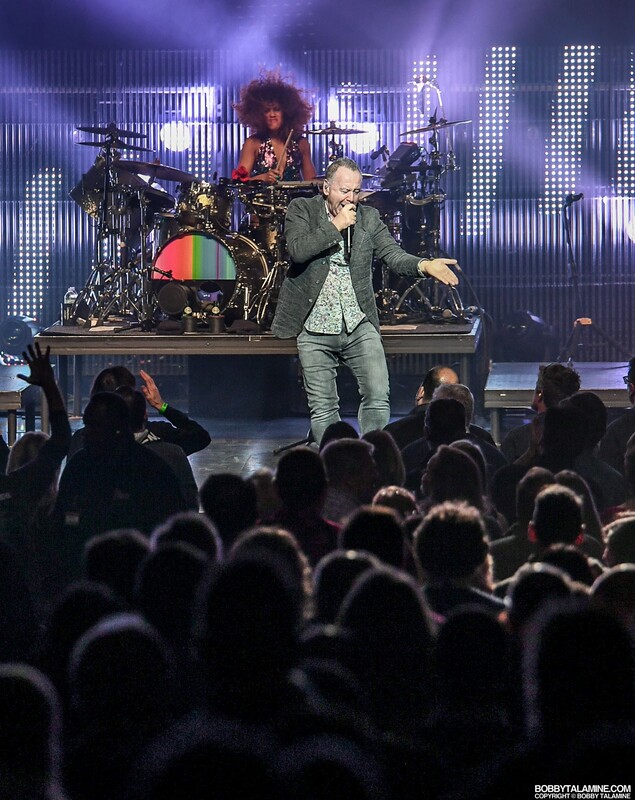 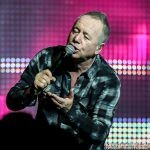 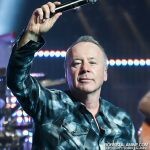 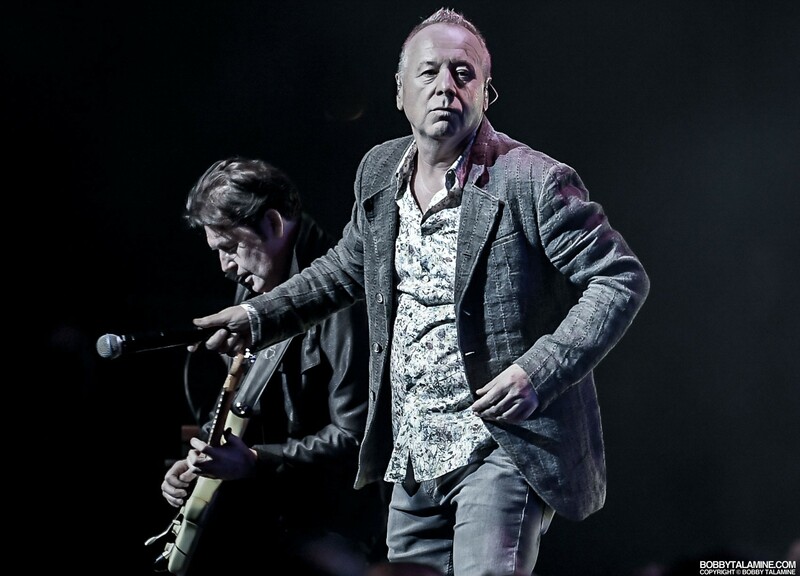 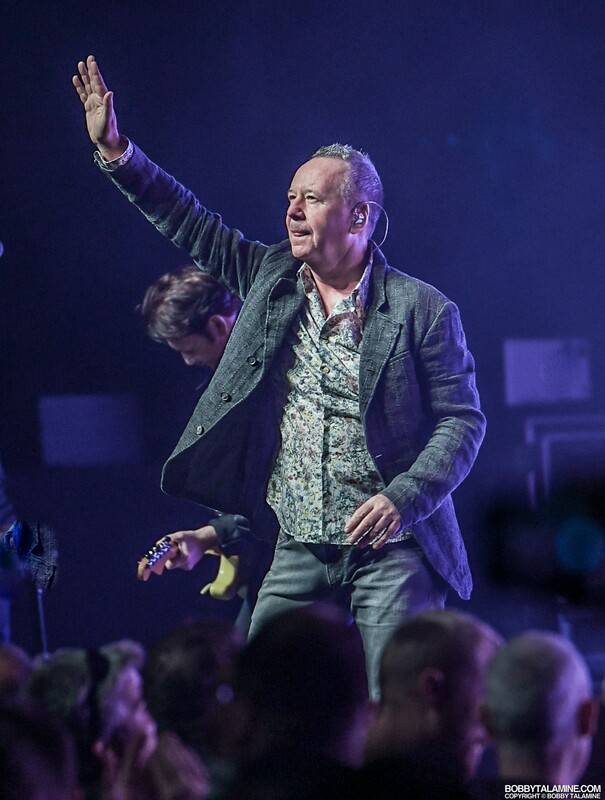 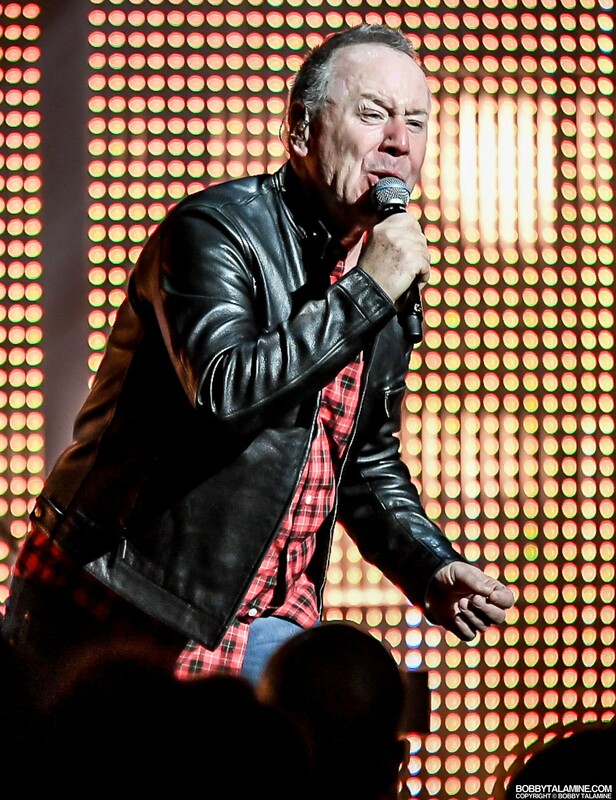 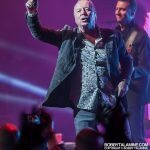 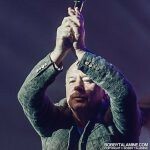 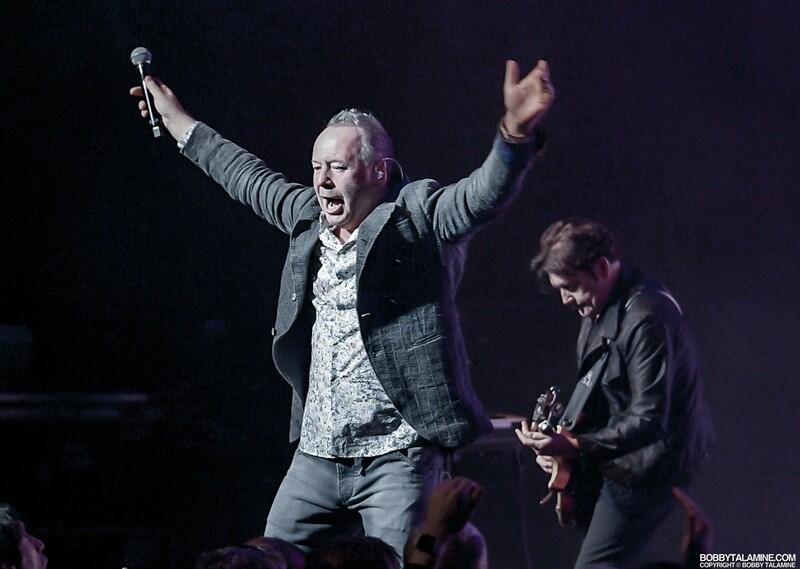 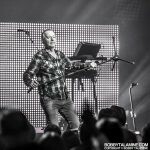 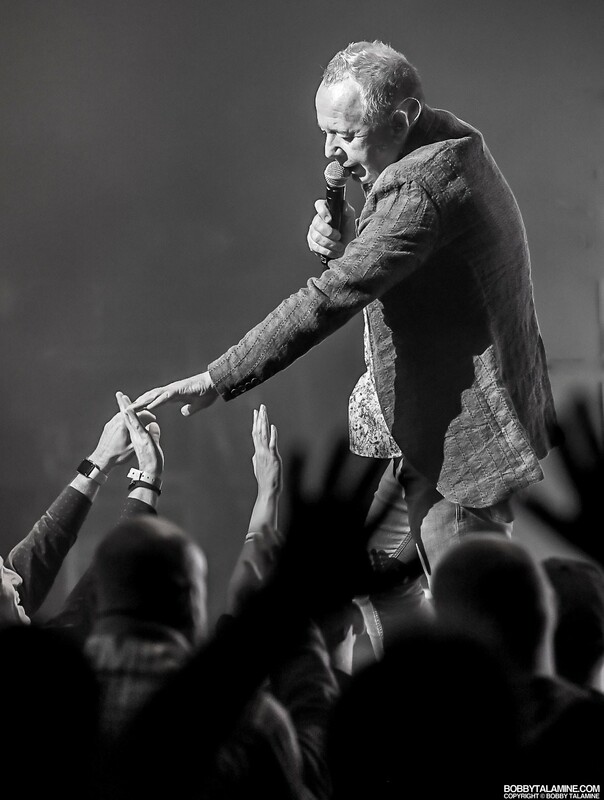 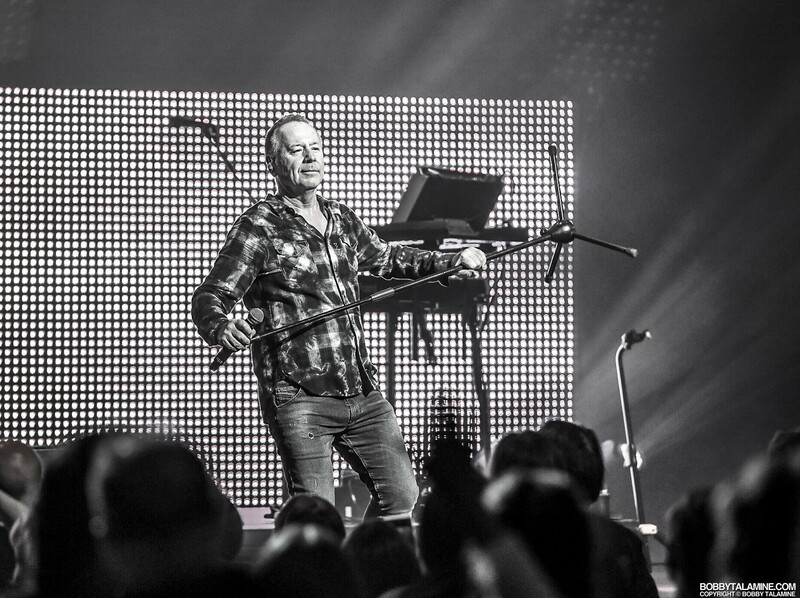 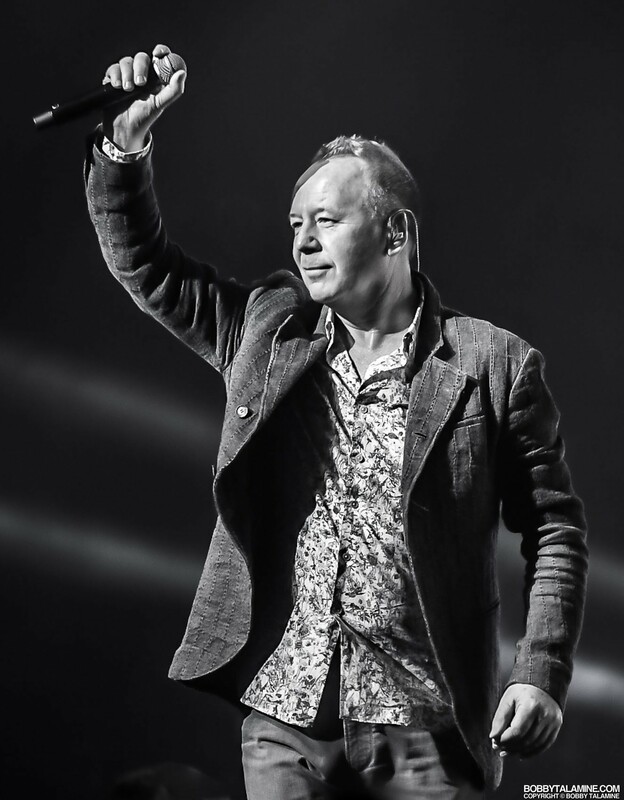 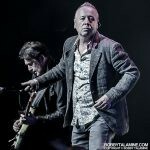 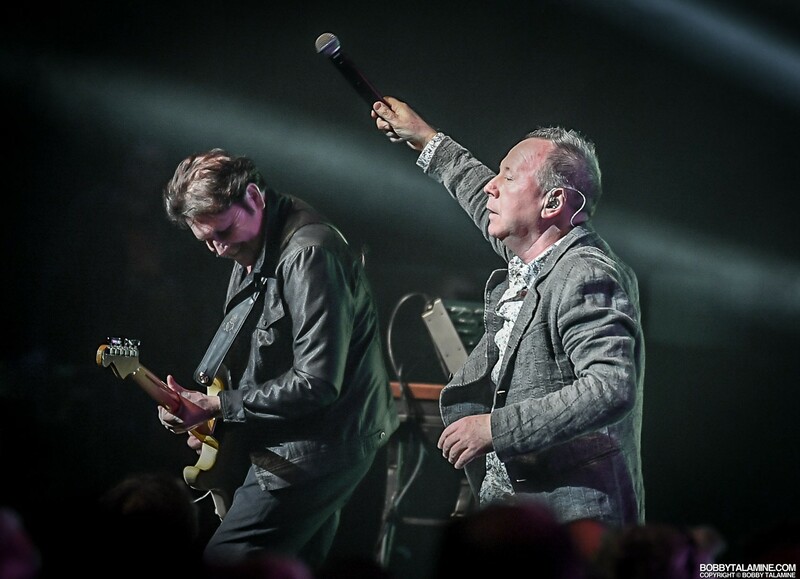 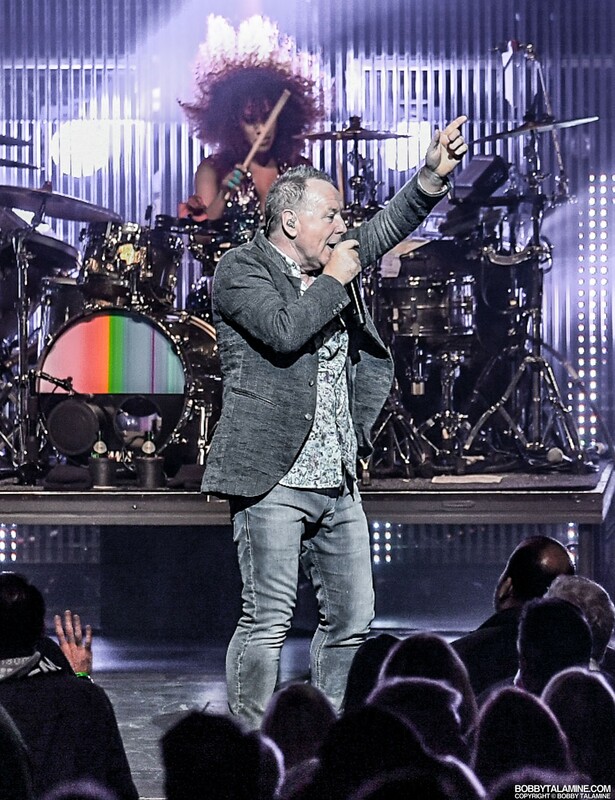 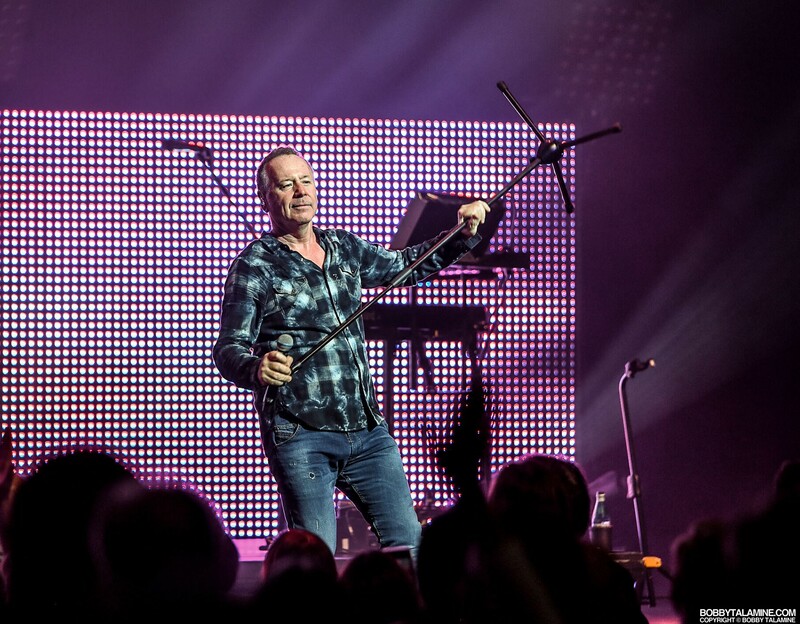 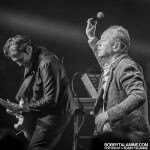 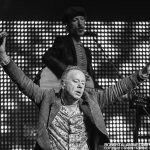 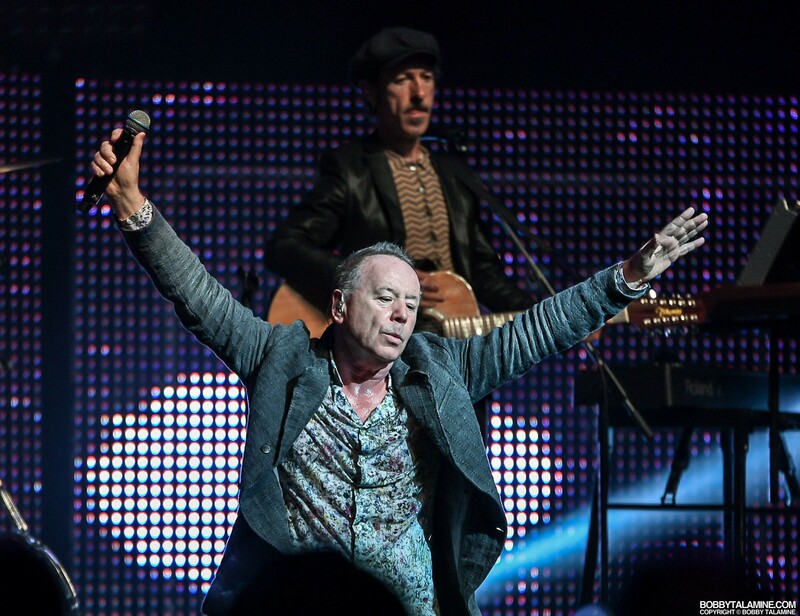 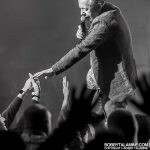 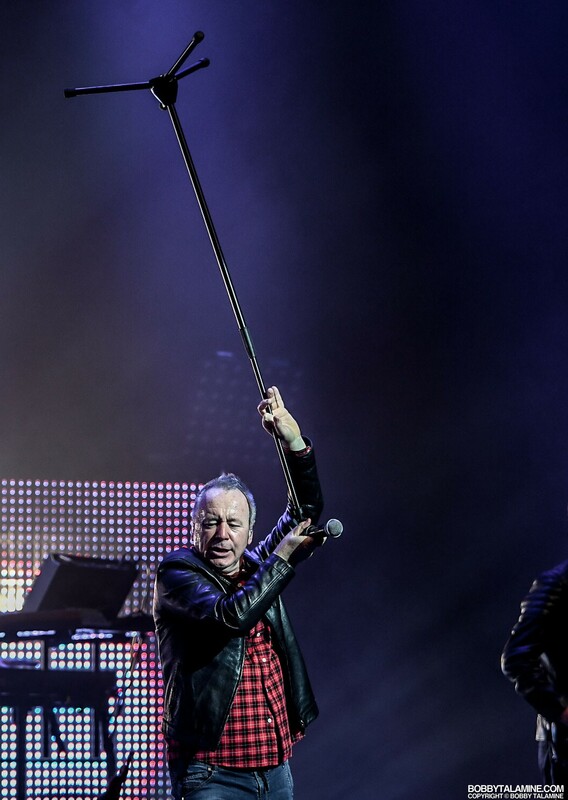 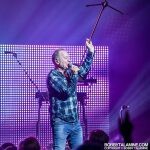 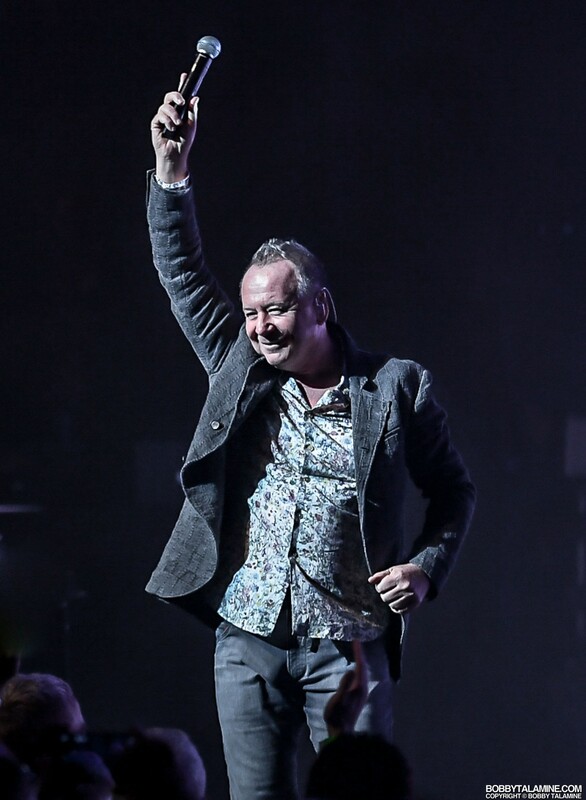 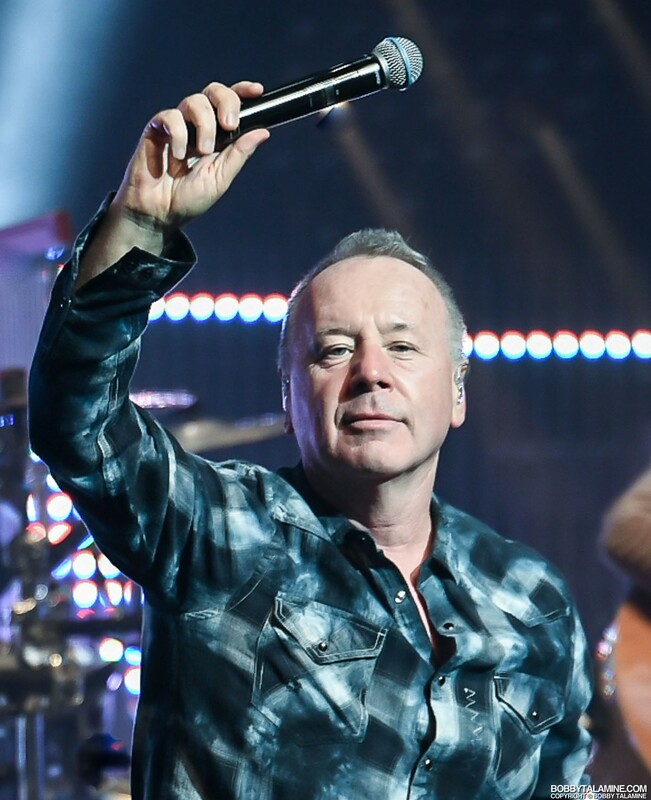 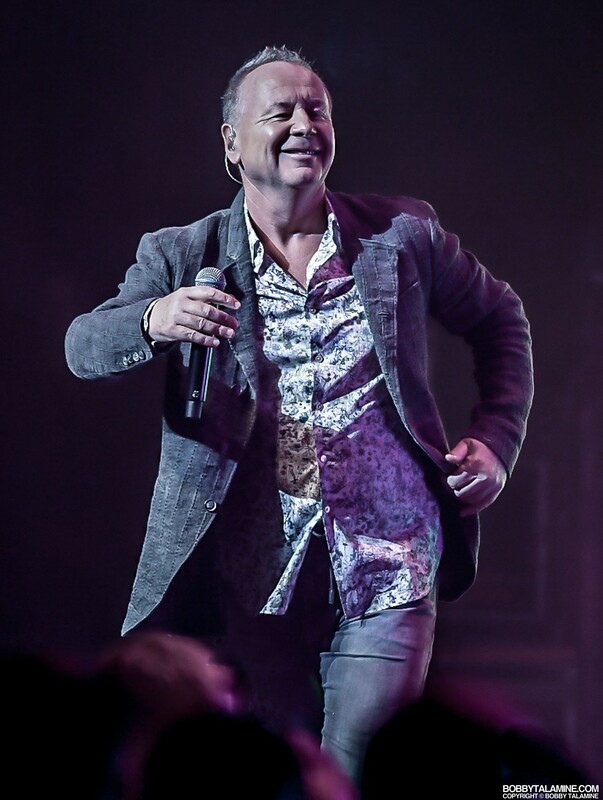 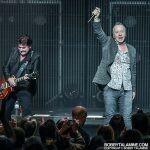 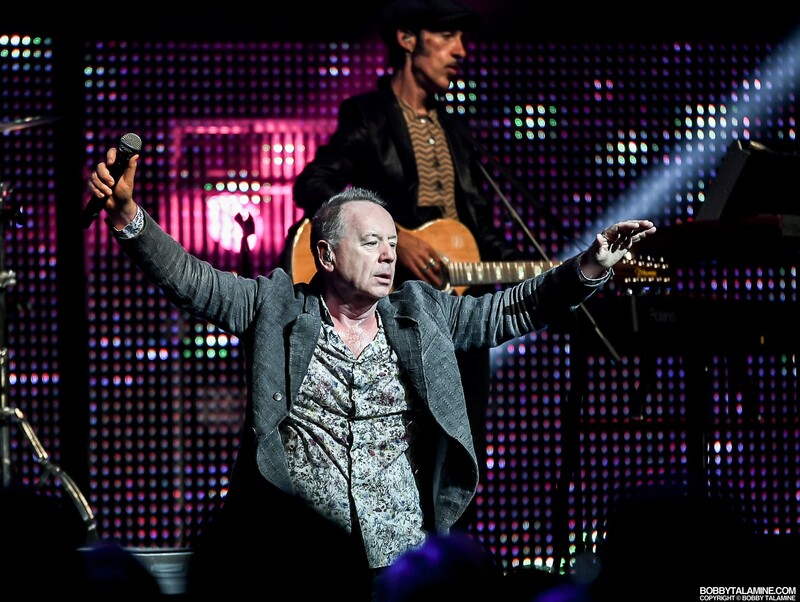 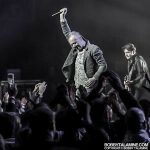 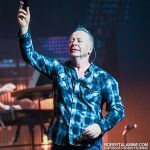 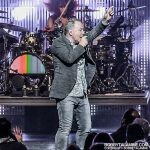 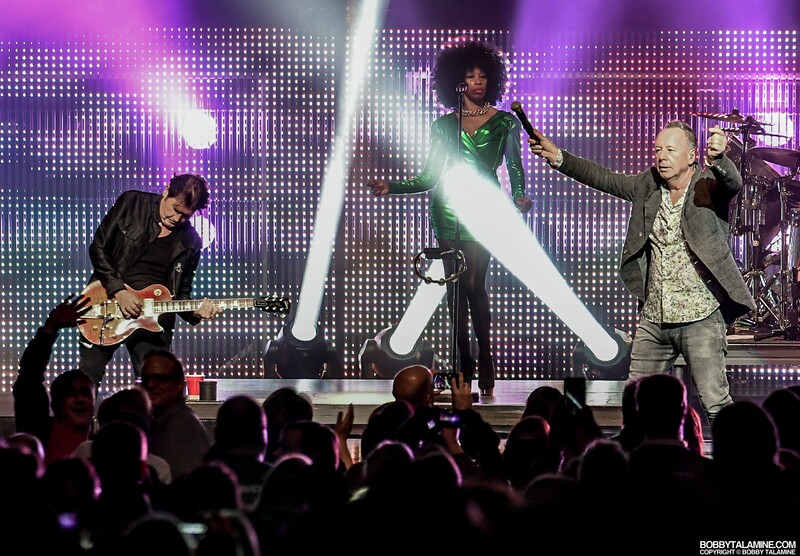 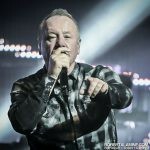 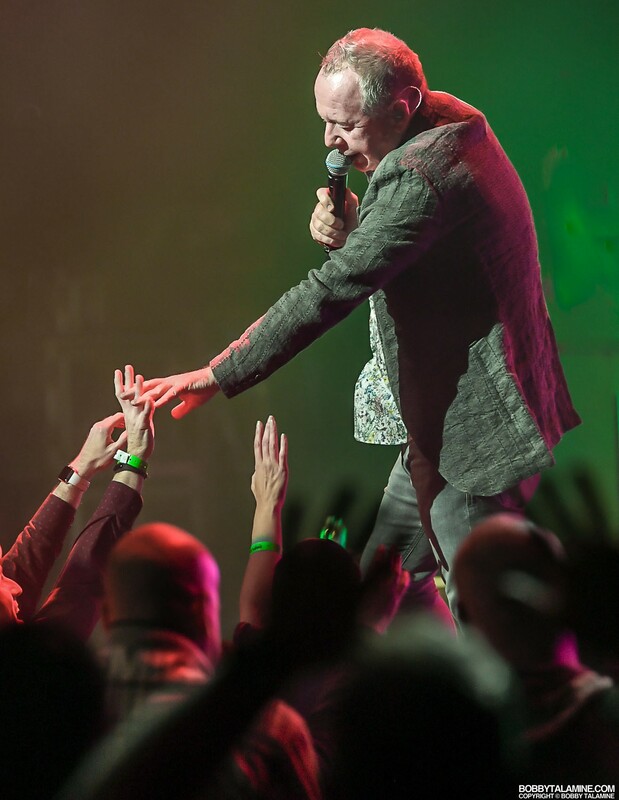 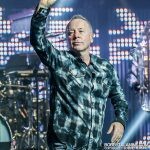 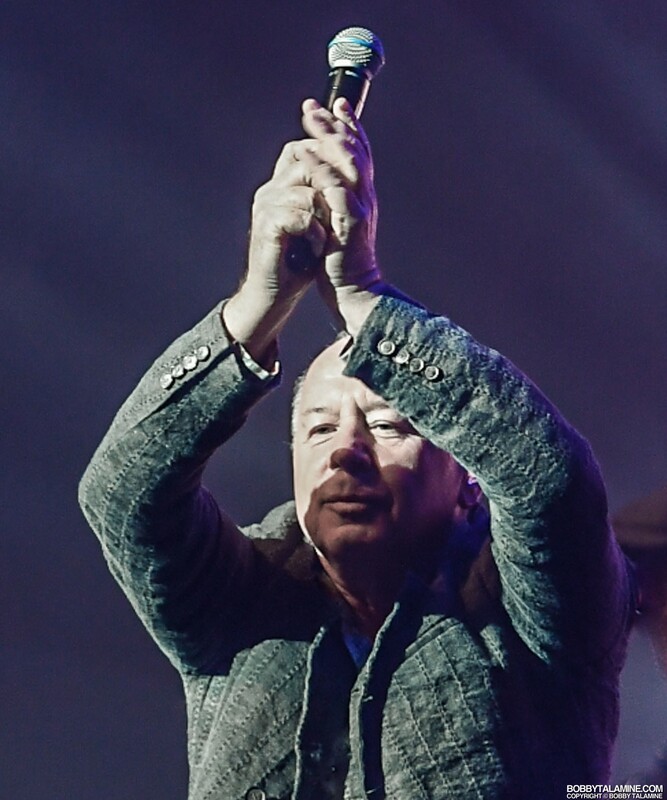 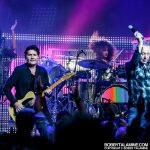 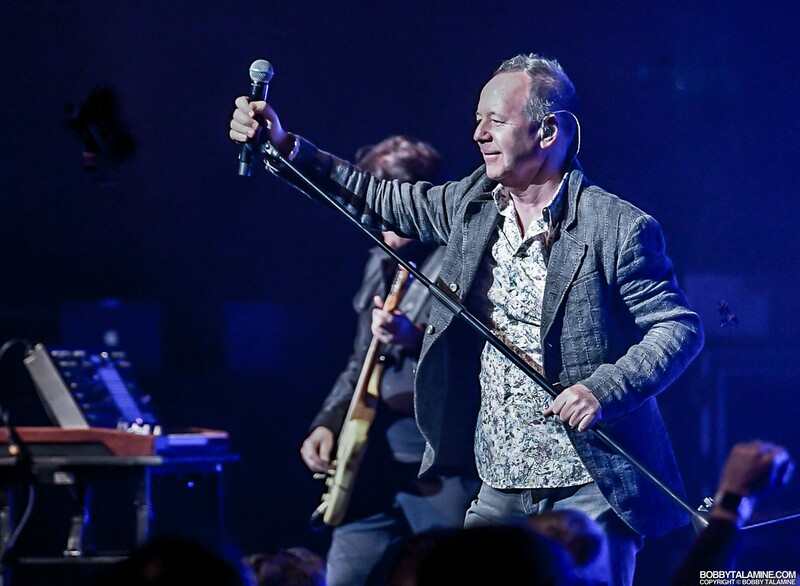 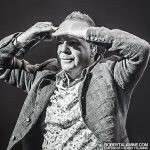 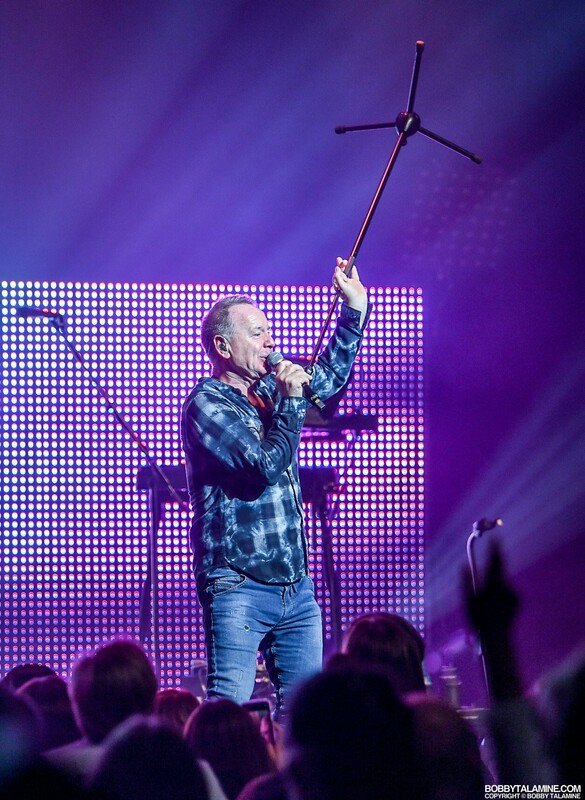 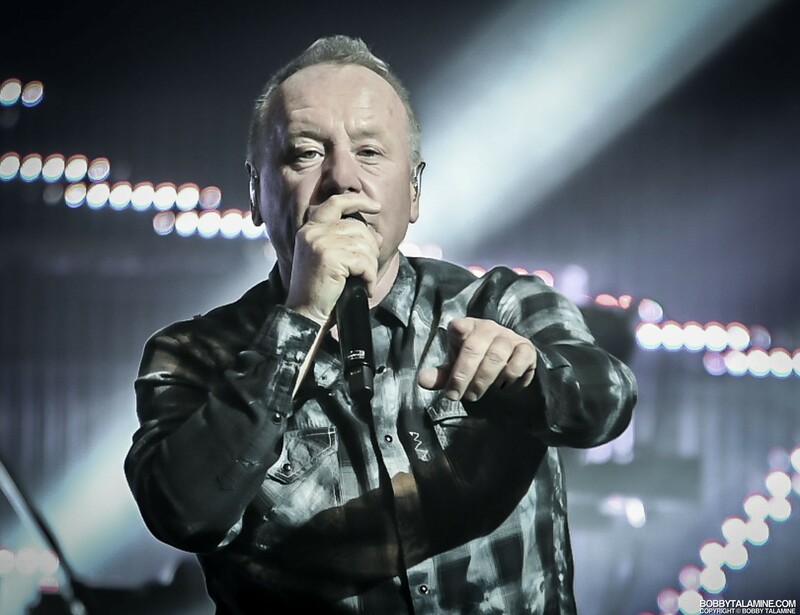 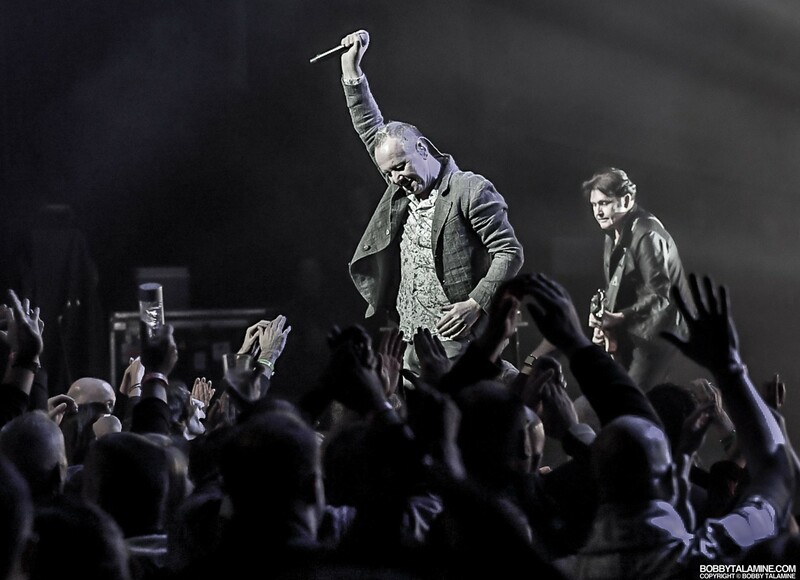 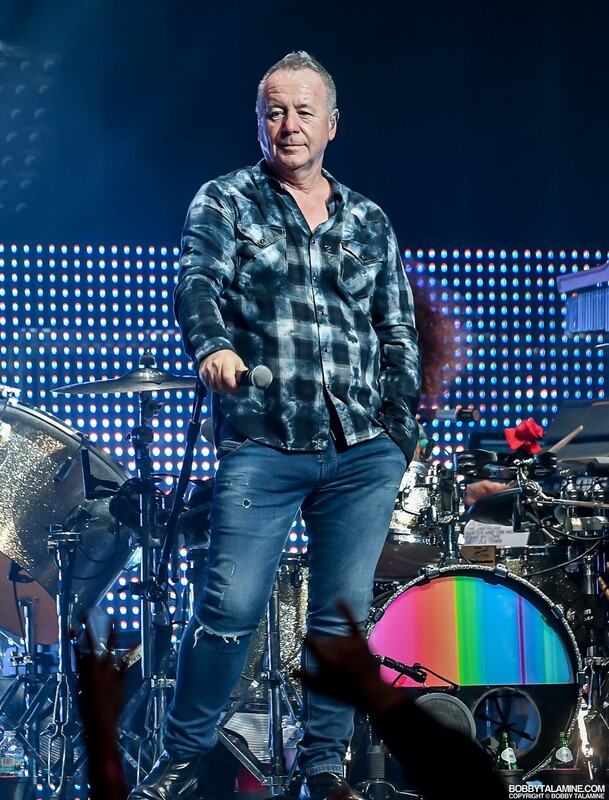 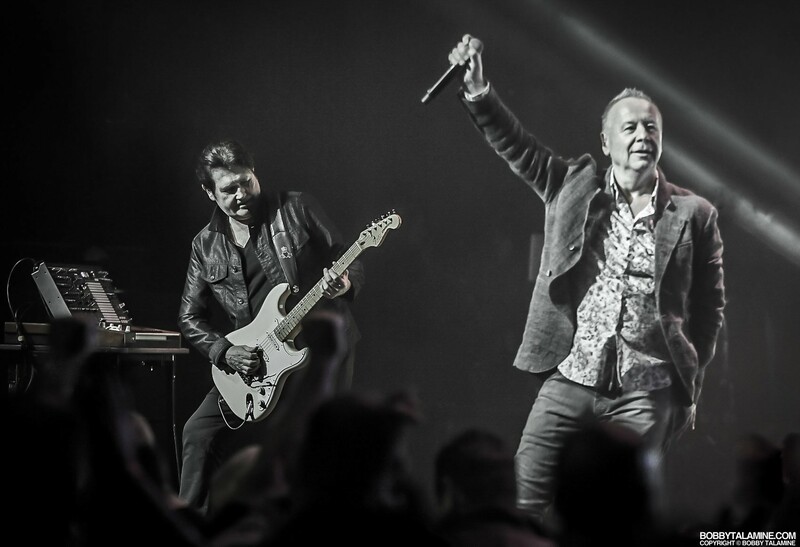 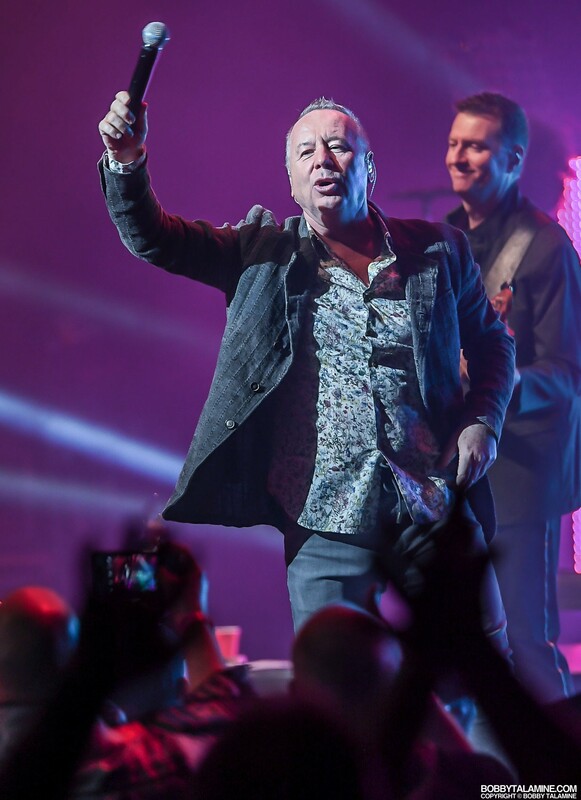 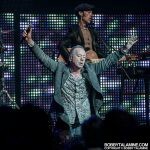 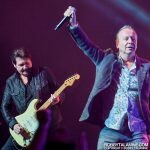 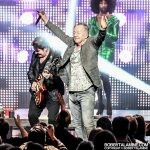 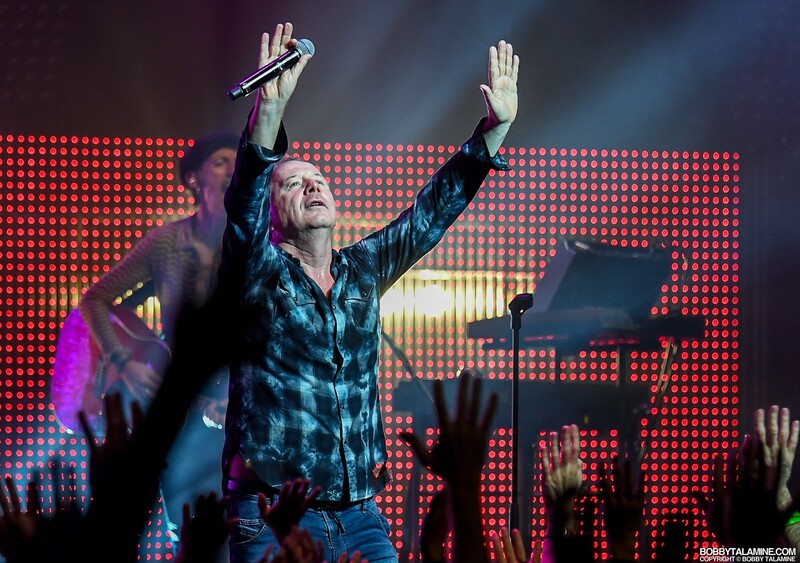 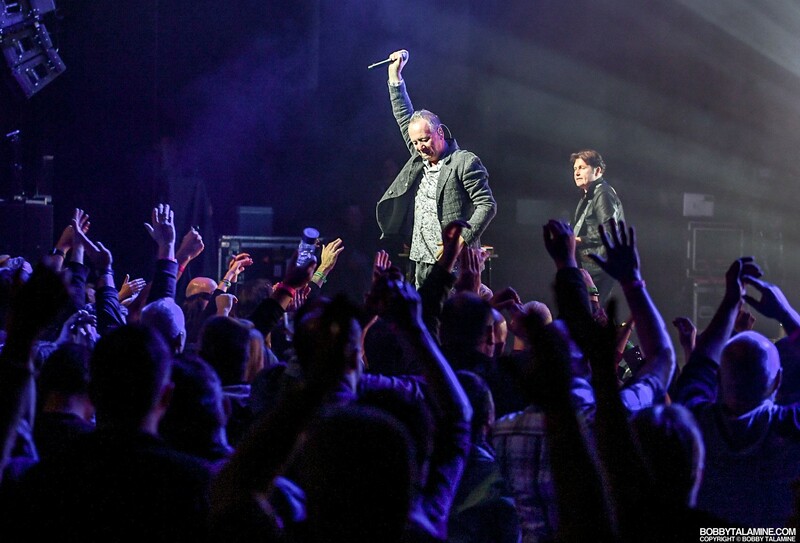 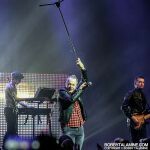 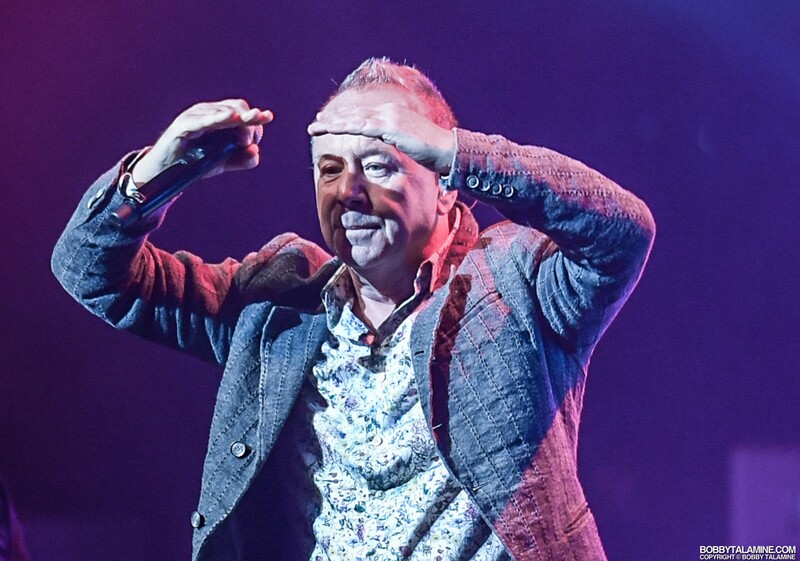 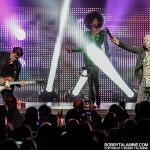 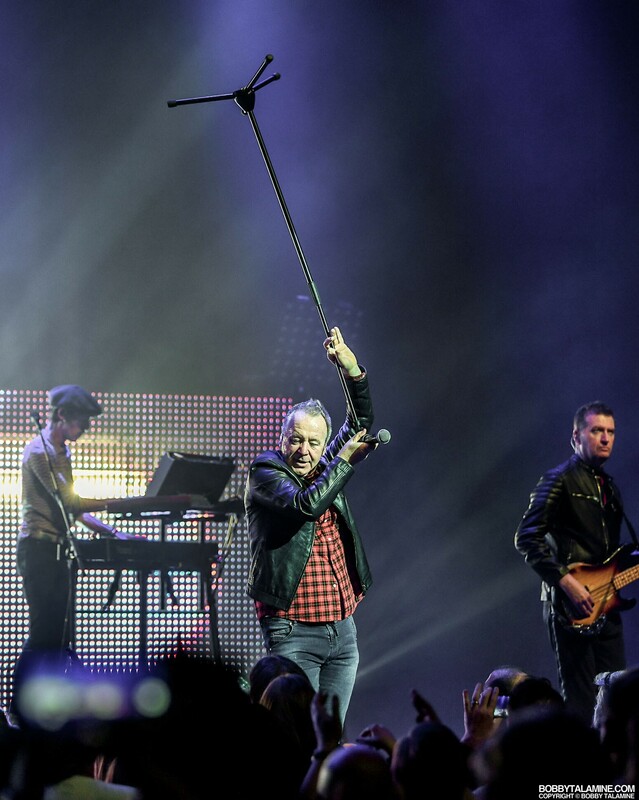 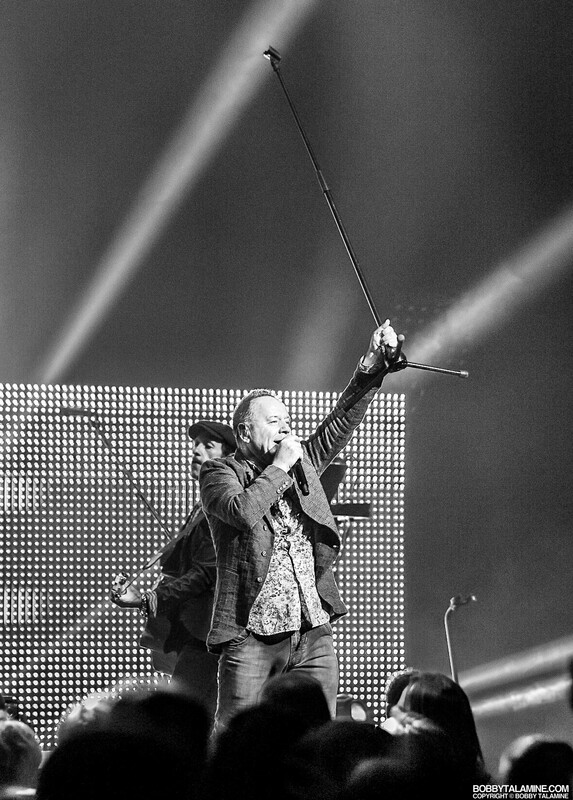 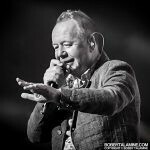 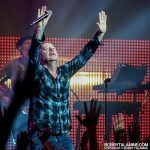 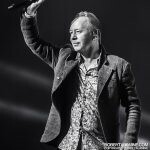 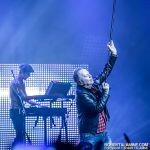 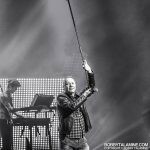 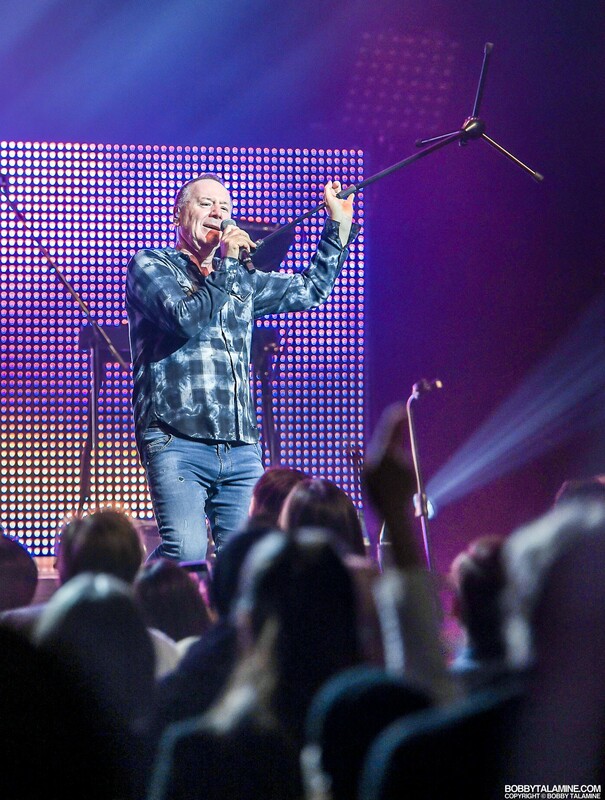 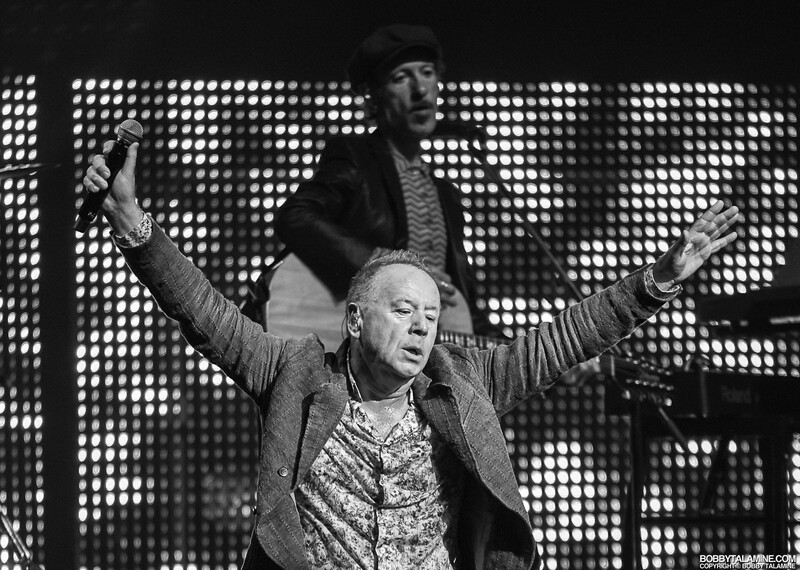 Simple Minds are proving once again on this current tour in support of their latest release “Walk Between Worlds”, that they are arguably one of the best and sincere rock bands in the world, with a catalog of enduring and innovative anthems- one after another after another. 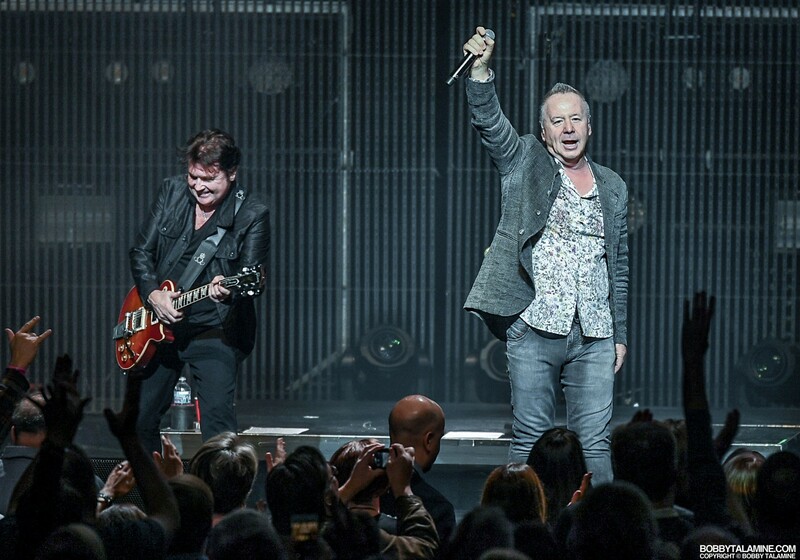 The show at the Chicago Theatre shows once again the power and might of Simple Minds performing live, winning over the crowd with a terrific performance that honestly didn’t let up all the way through the last encore, consisting of “Stand By Love” into “Alive and Kicking” and ending with “Sanctify Yourself”. 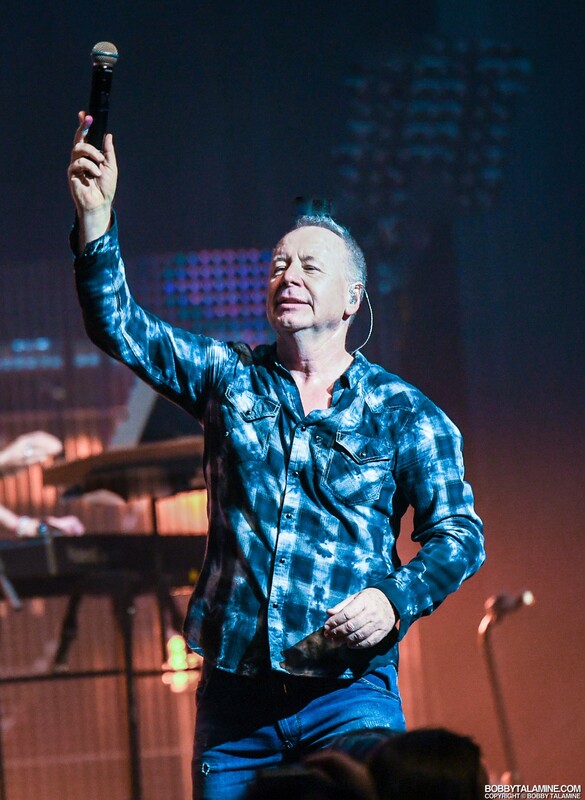 There’s a luster and shine to all things Simple Minds, from the songwriting that stands out from the pack, and an identity that is honest and pure- no other way to put it. 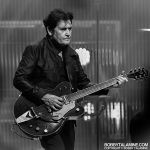 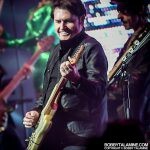 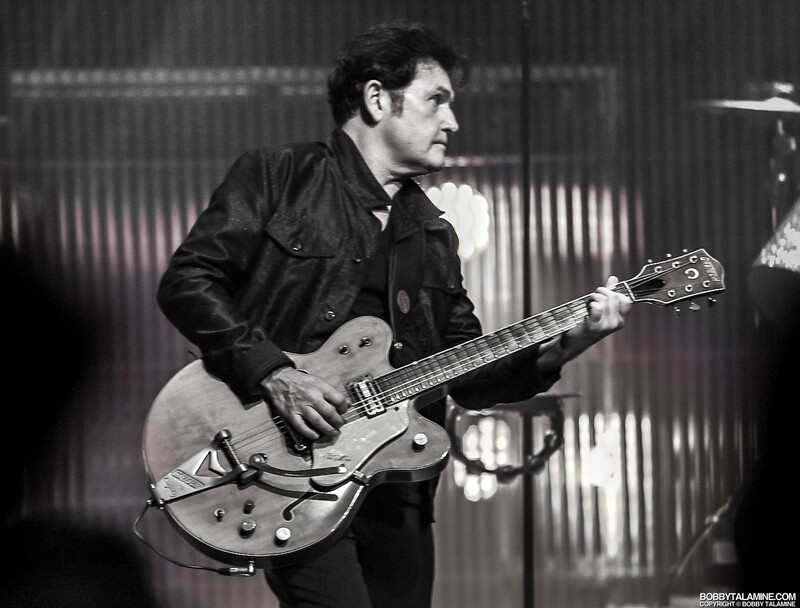 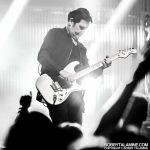 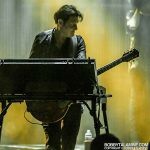 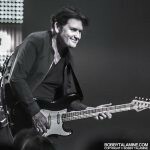 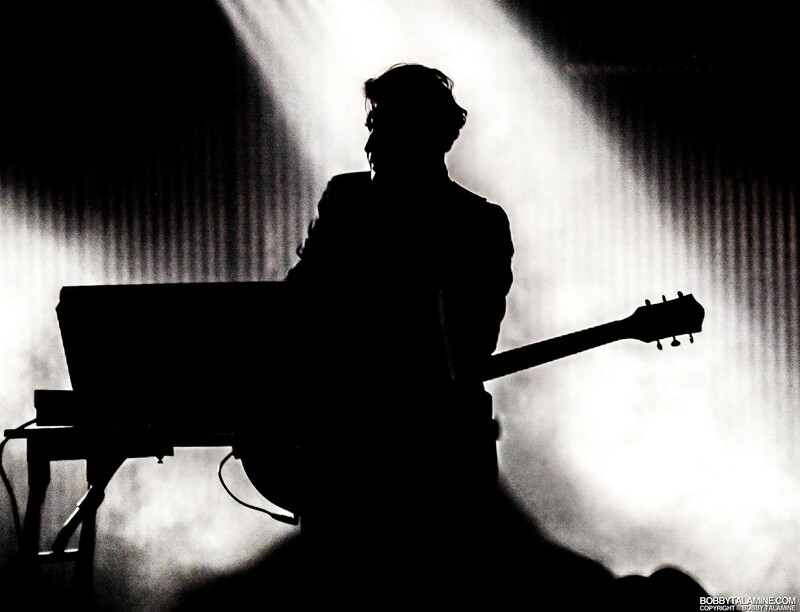 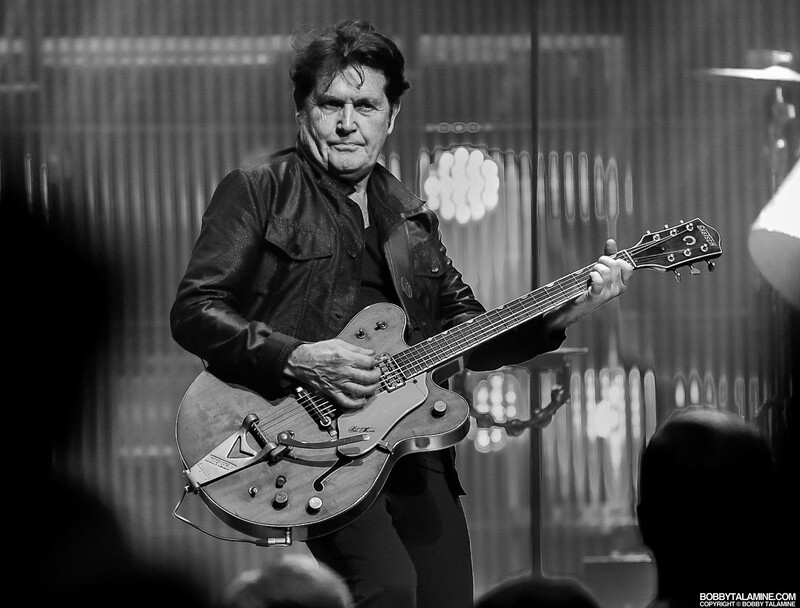 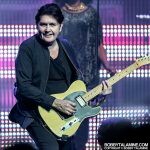 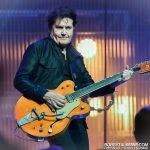 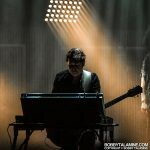 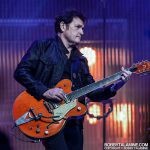 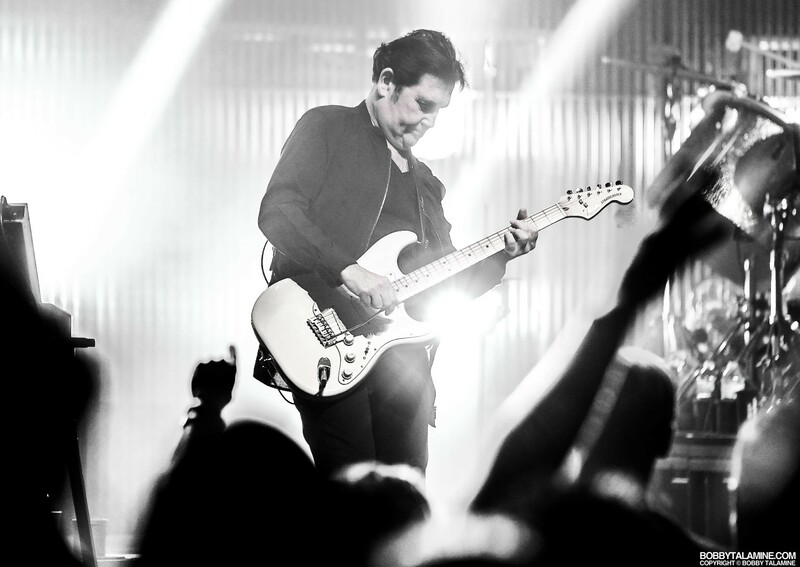 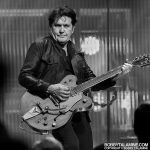 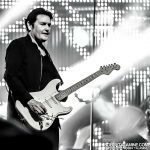 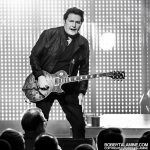 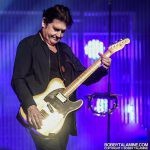 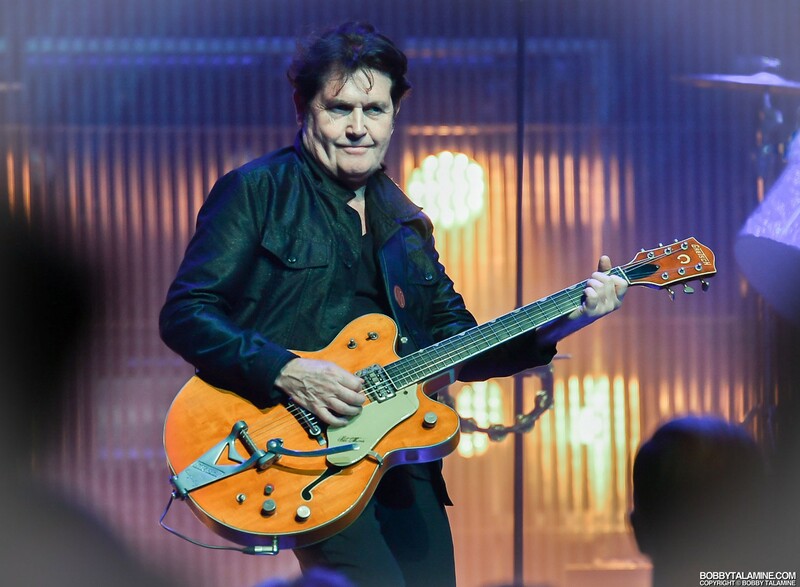 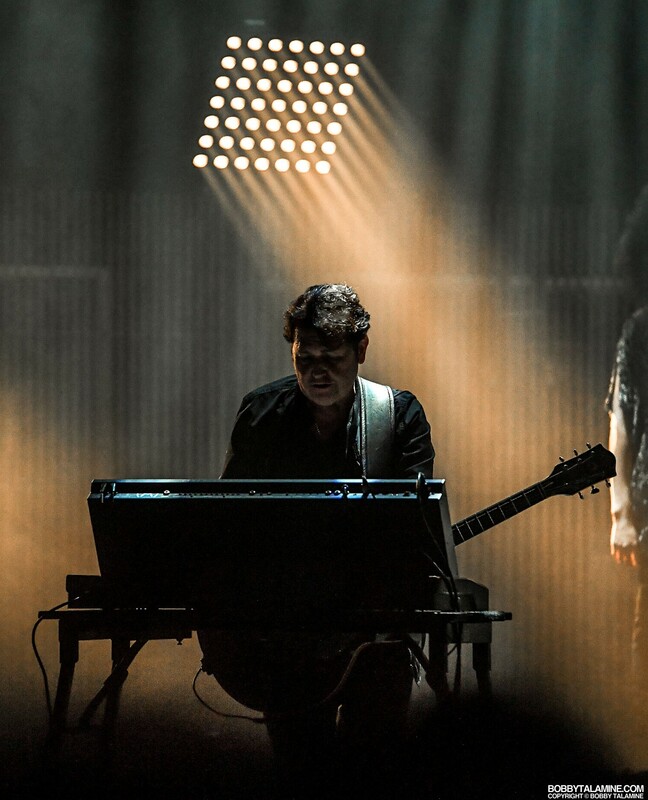 The show itself, limited in scope for this current tour in intimate theatres, still shows technical excellence and musicianship that is clearly not lacking in any ways and means. 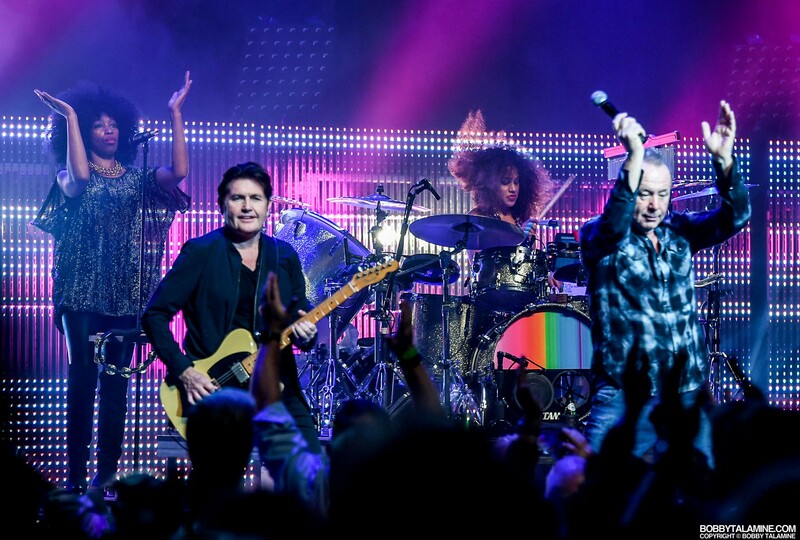 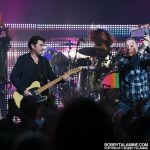 So refreshing to see a full band onstage, no sloppy backing tracks and minimal musicians and musicianship. 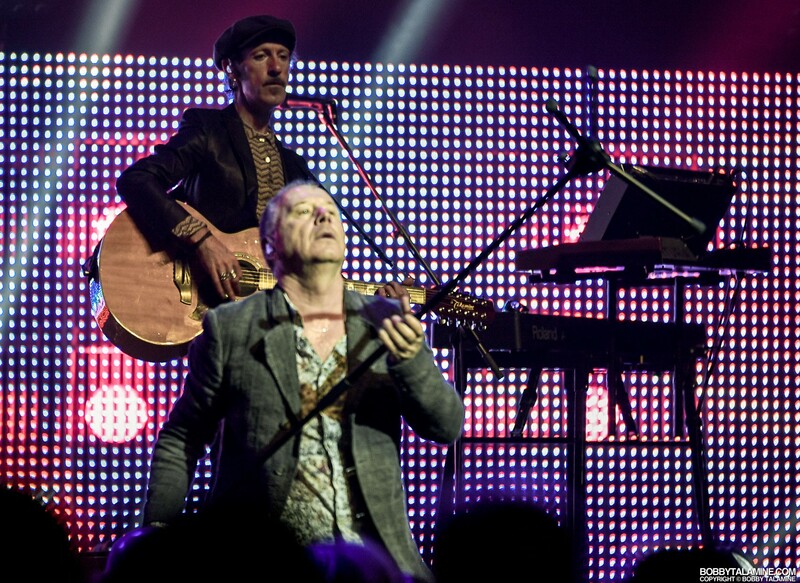 Jim and Charlie clearly don’t want things left for chance. 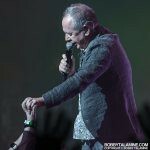 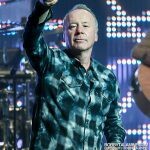 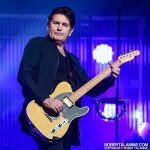 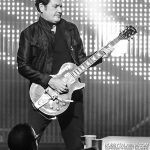 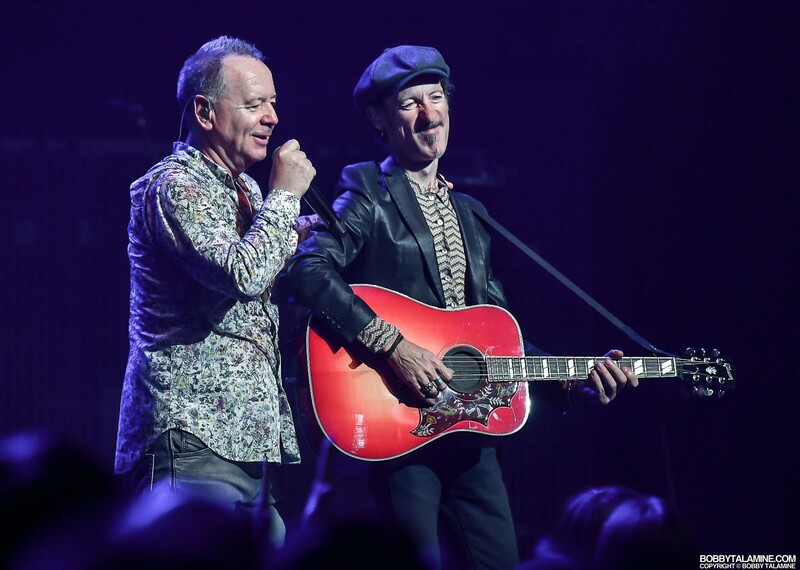 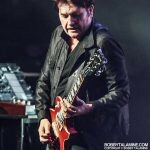 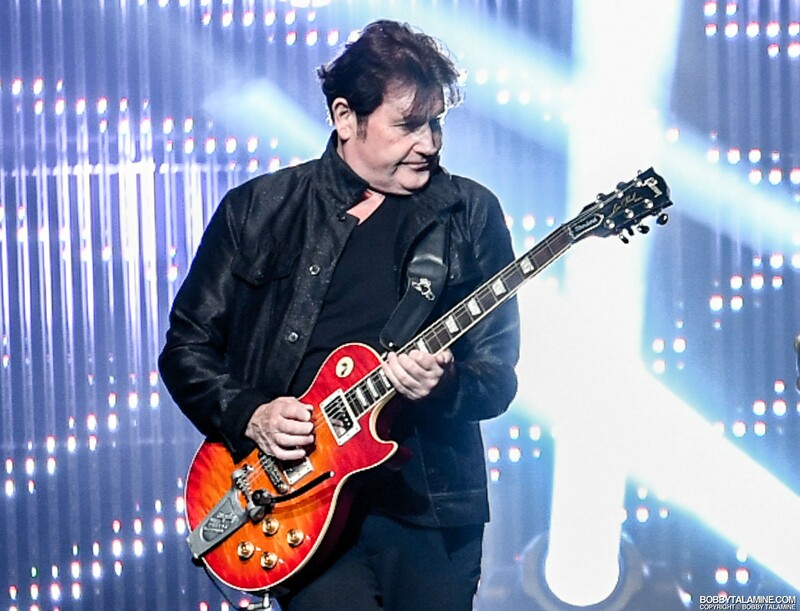 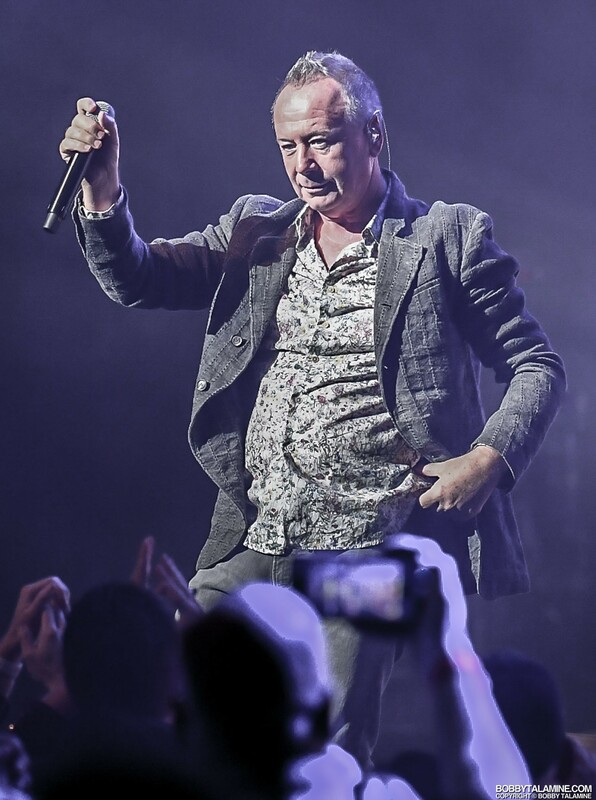 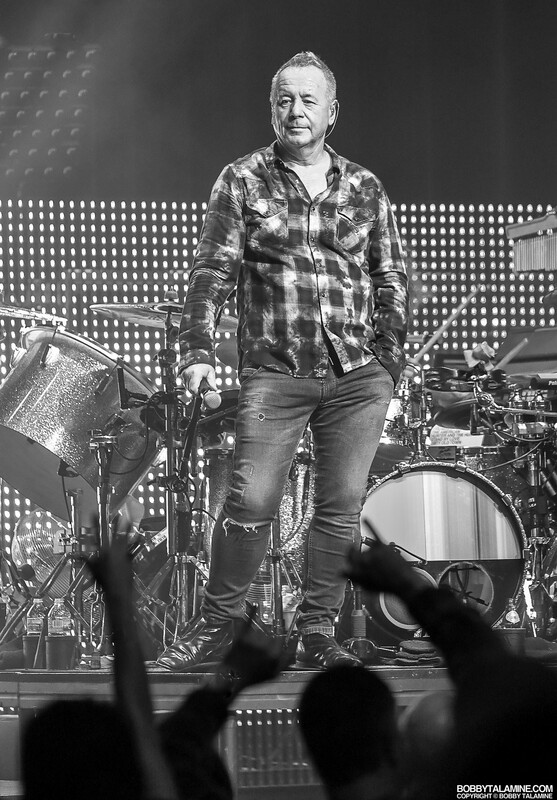 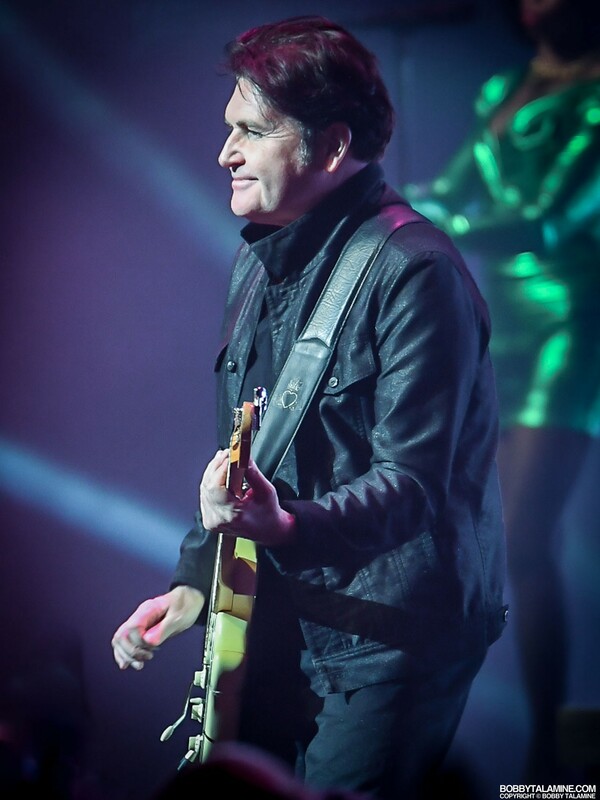 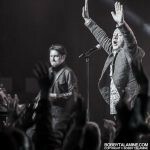 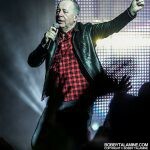 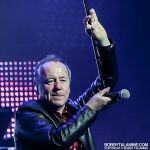 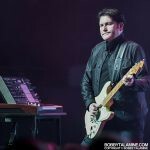 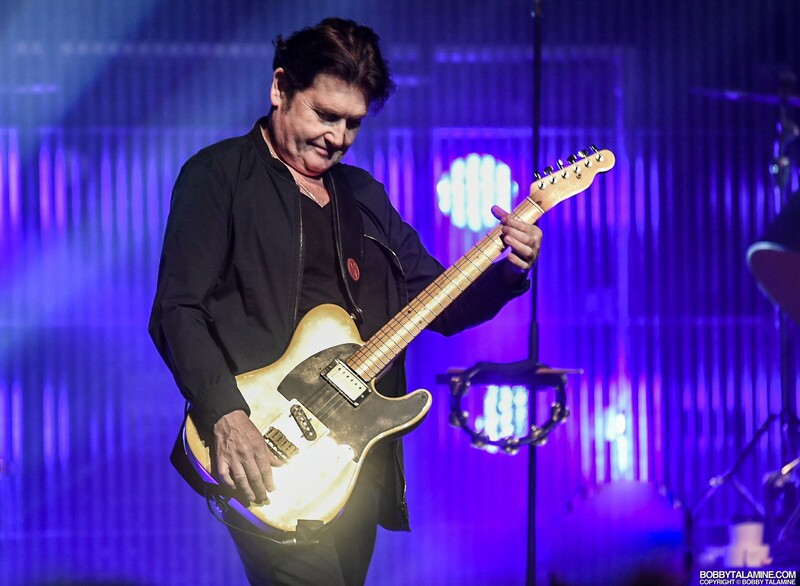 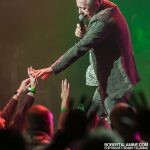 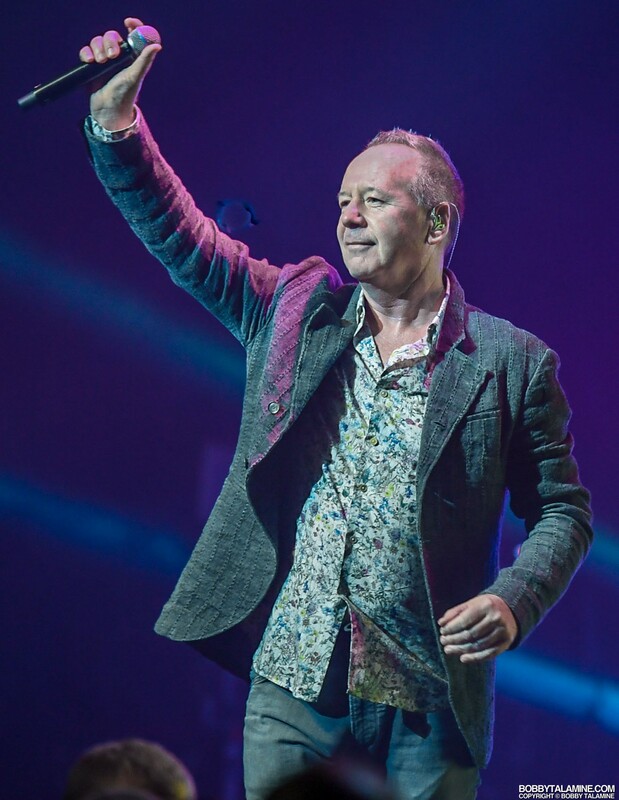 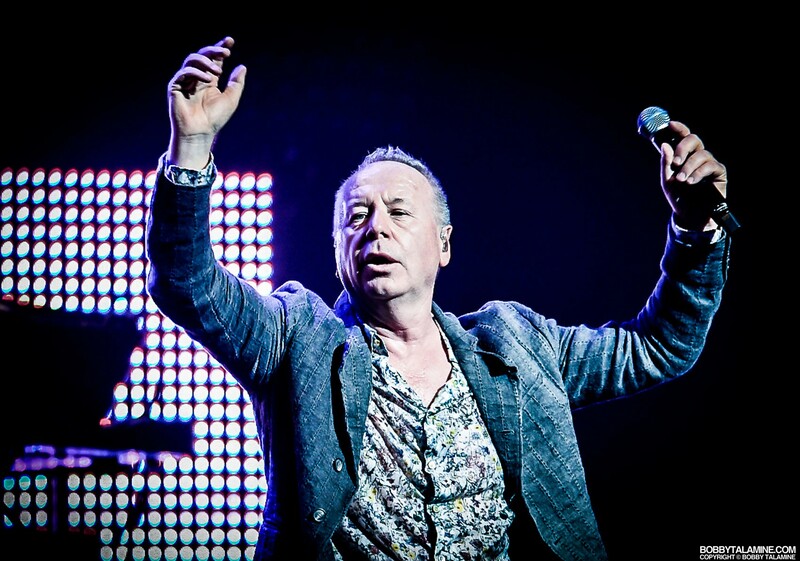 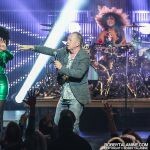 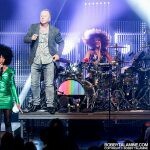 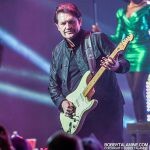 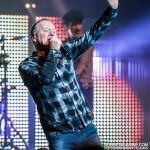 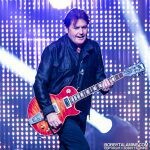 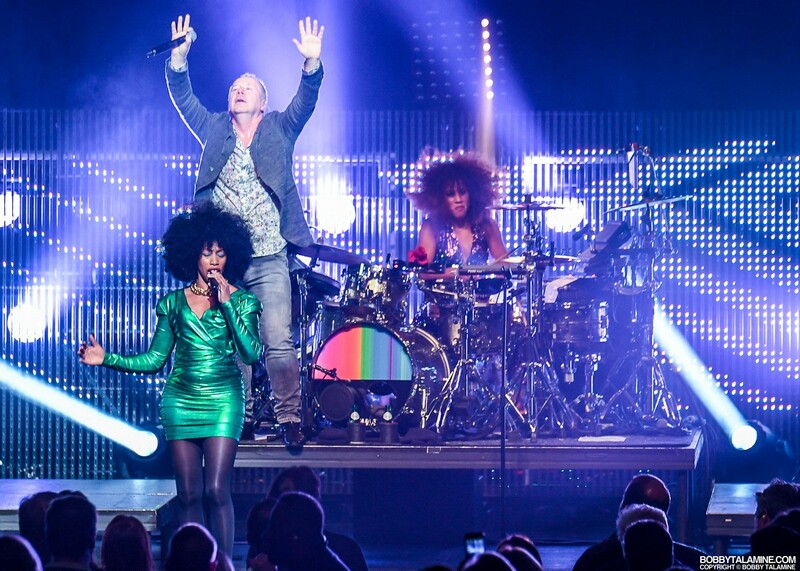 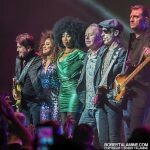 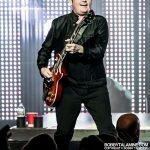 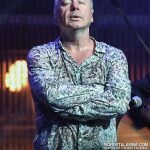 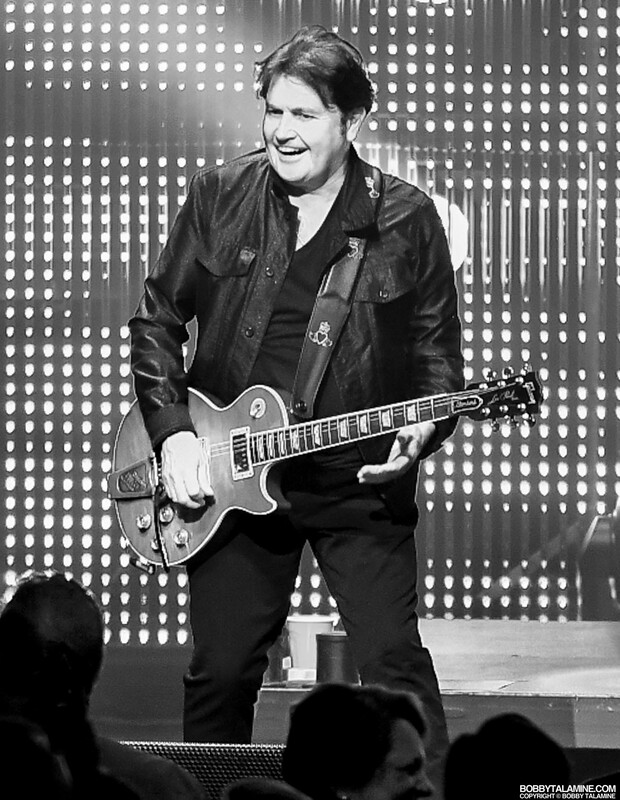 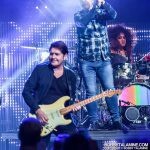 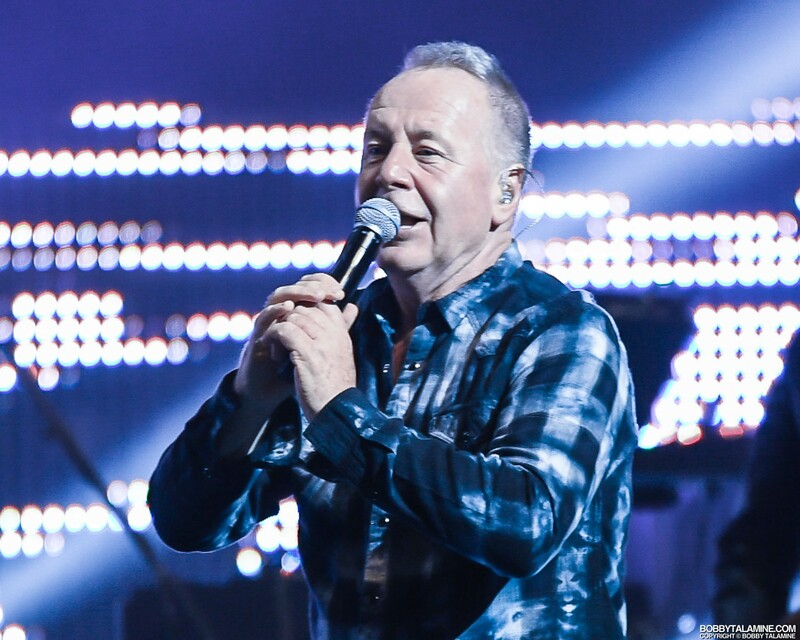 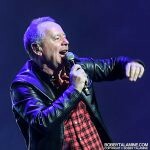 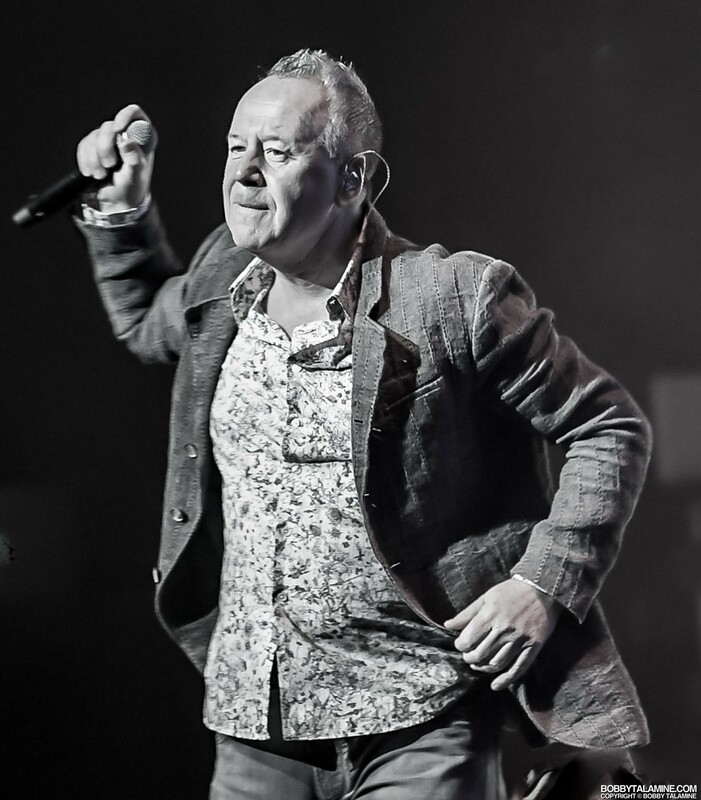 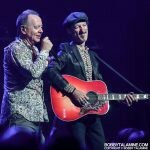 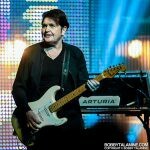 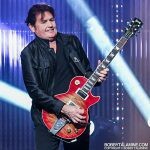 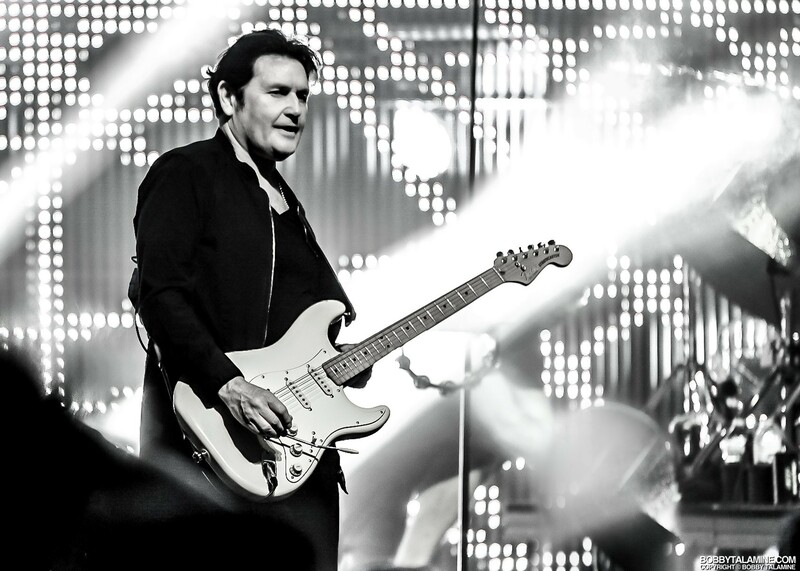 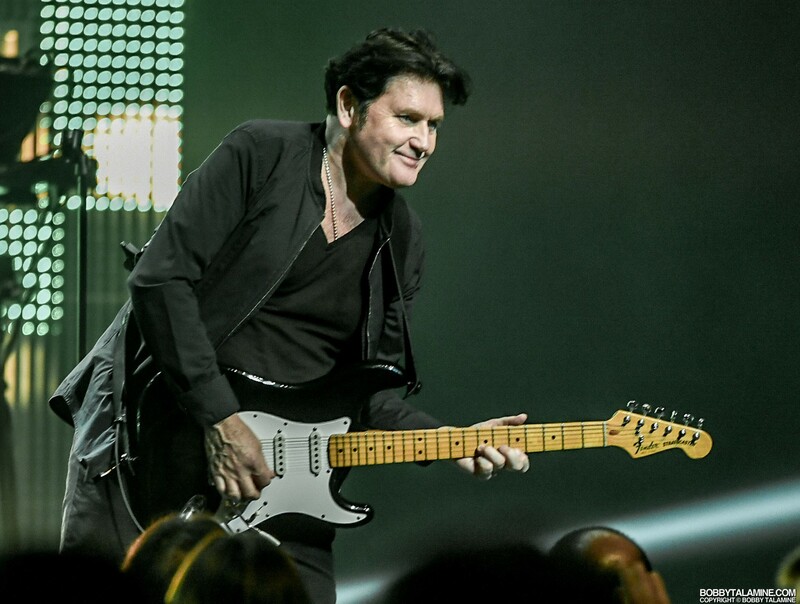 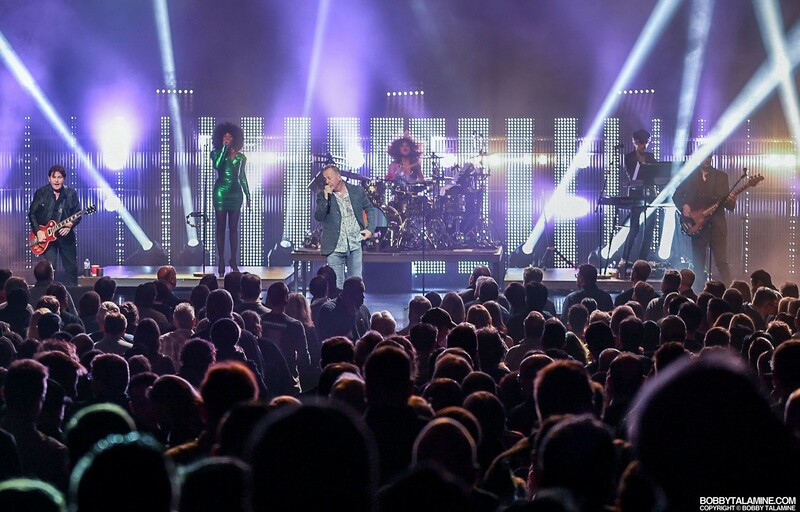 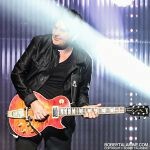 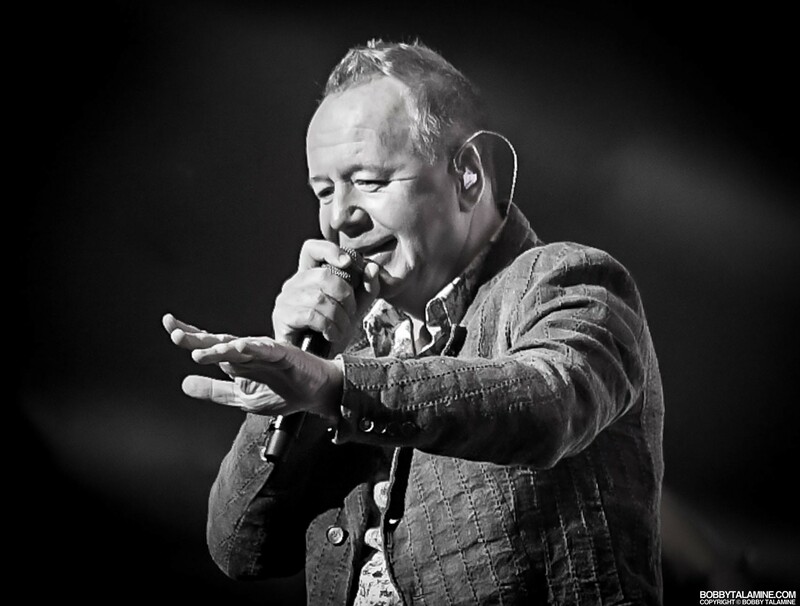 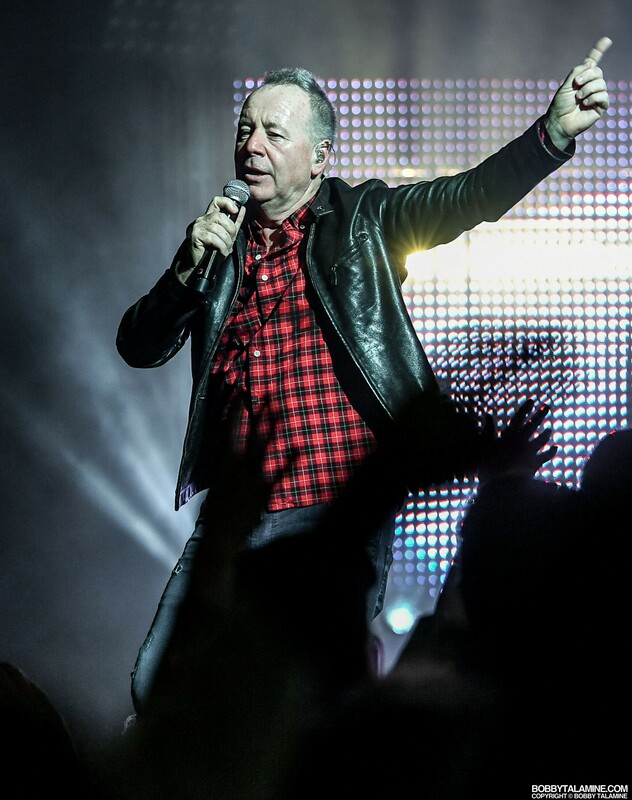 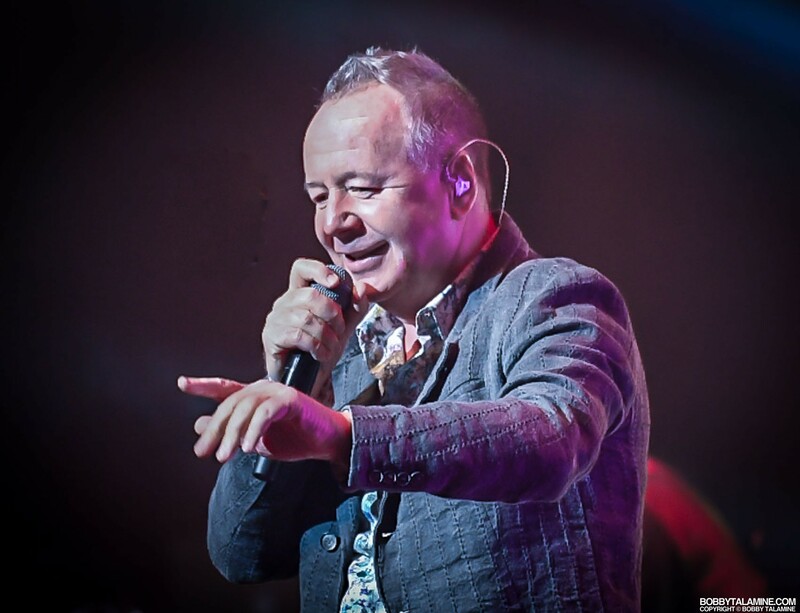 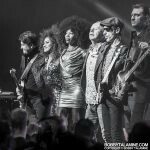 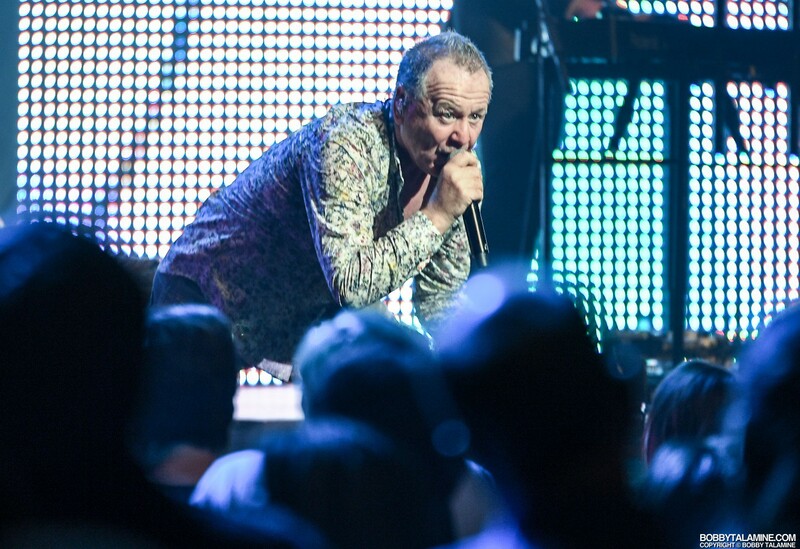 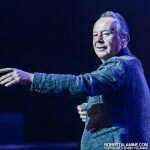 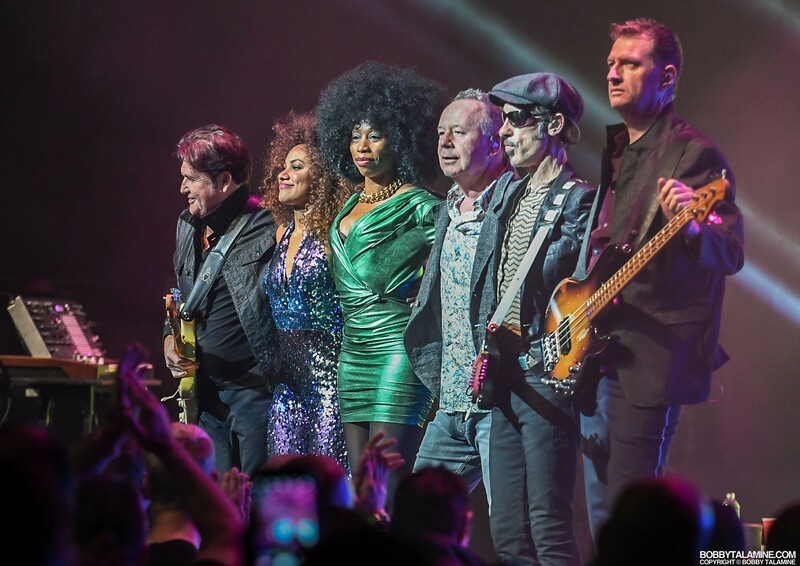 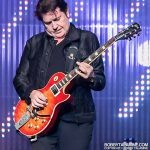 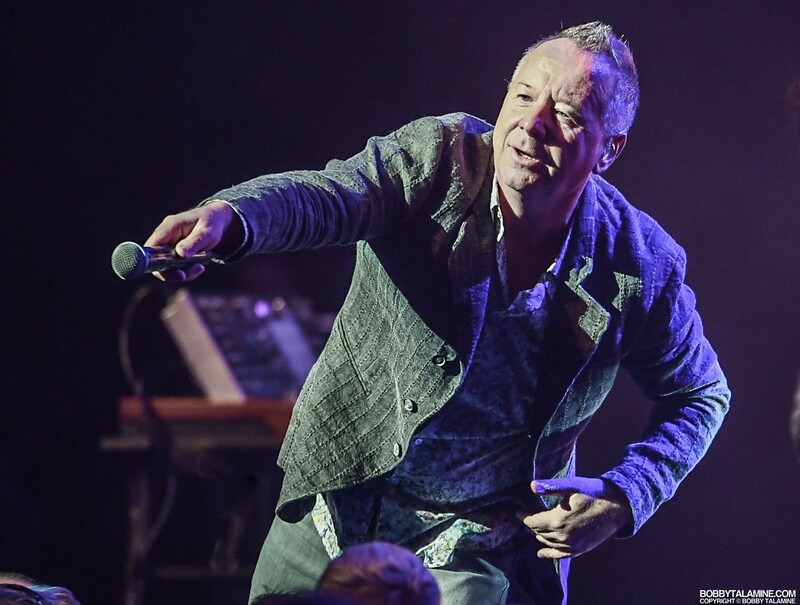 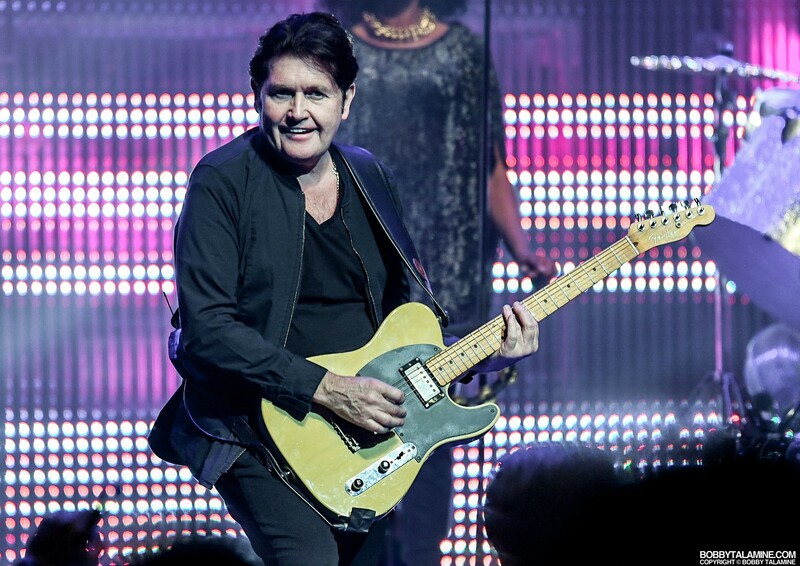 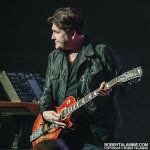 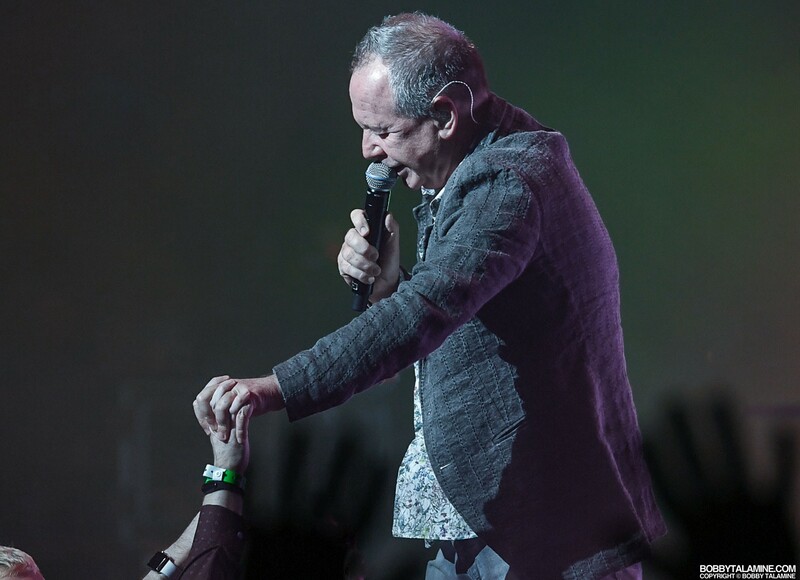 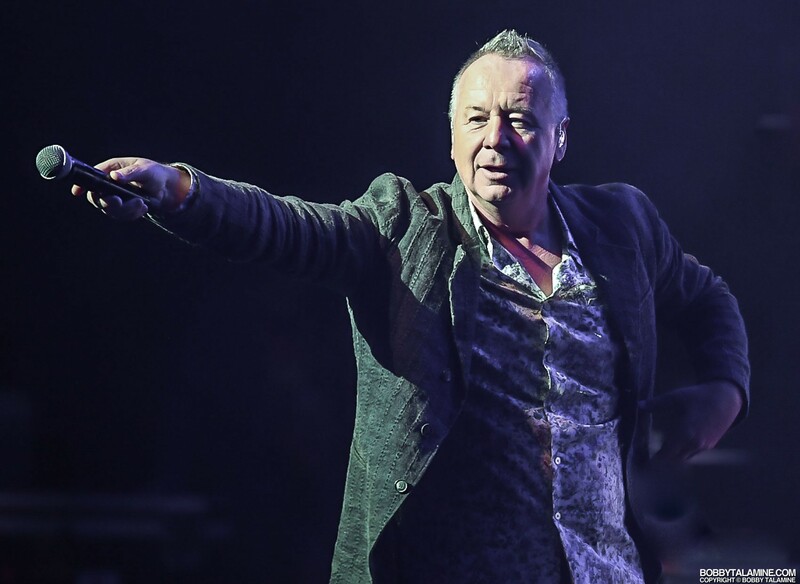 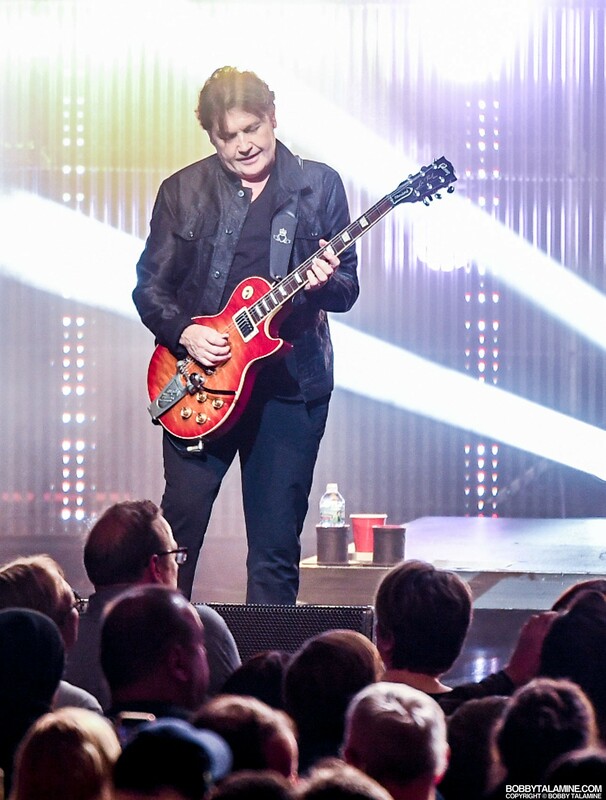 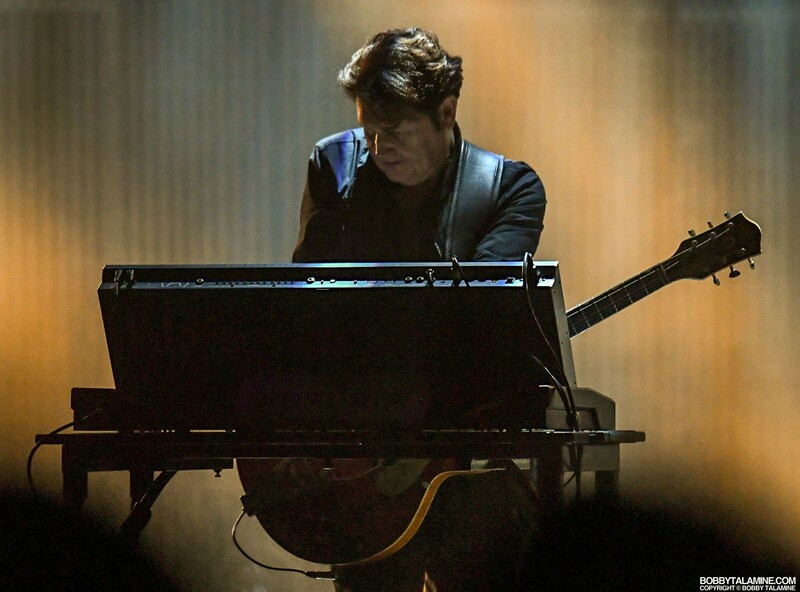 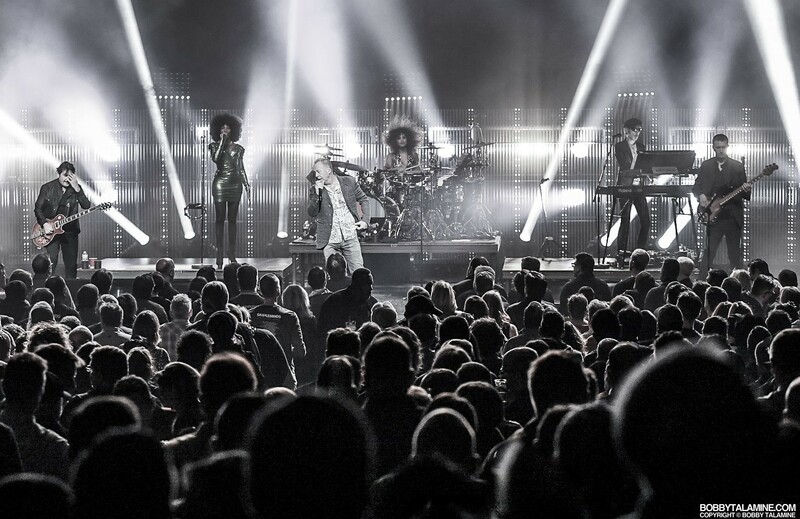 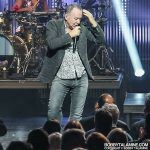 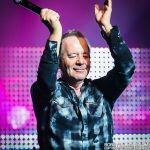 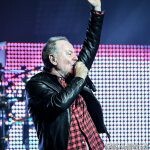 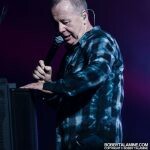 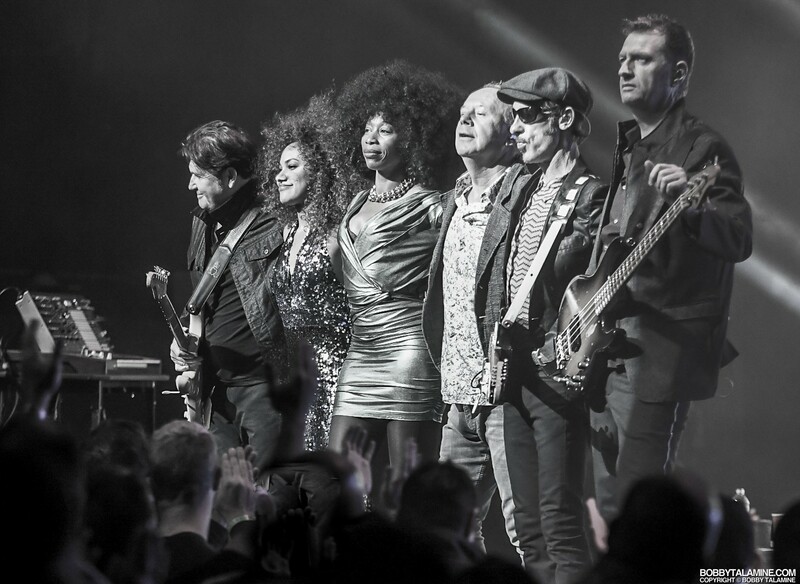 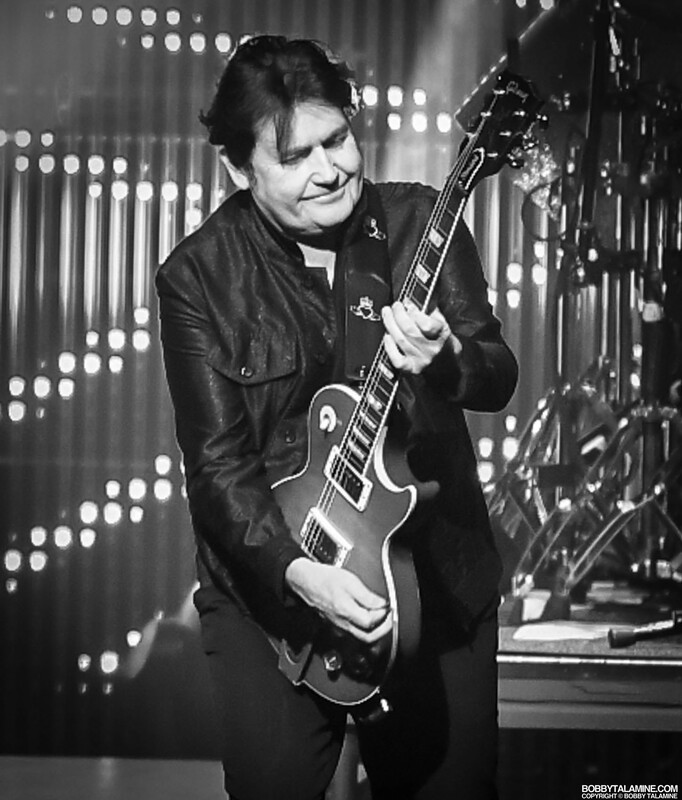 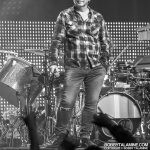 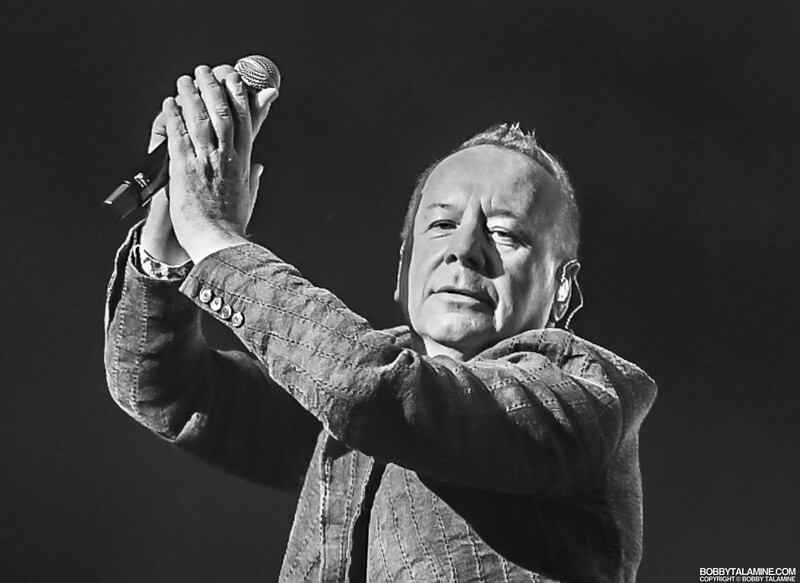 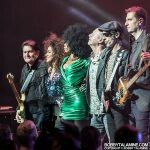 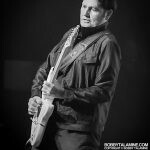 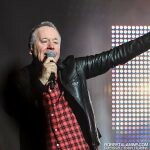 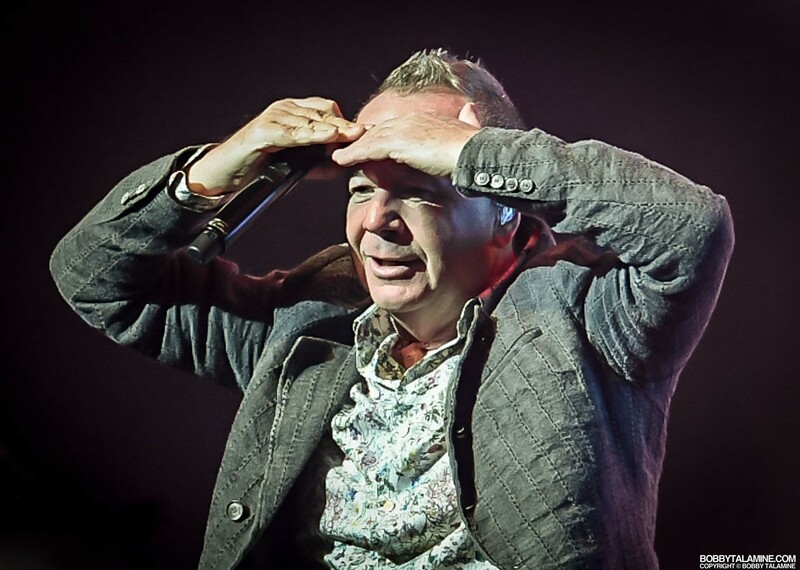 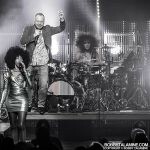 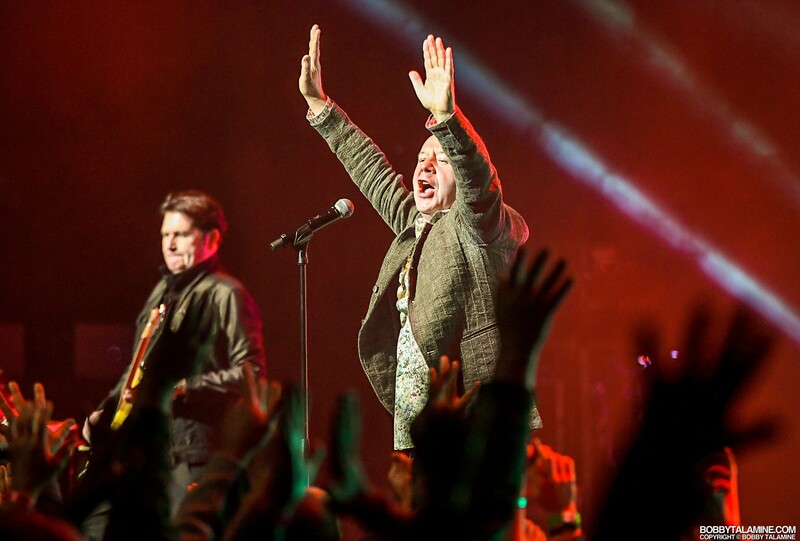 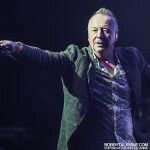 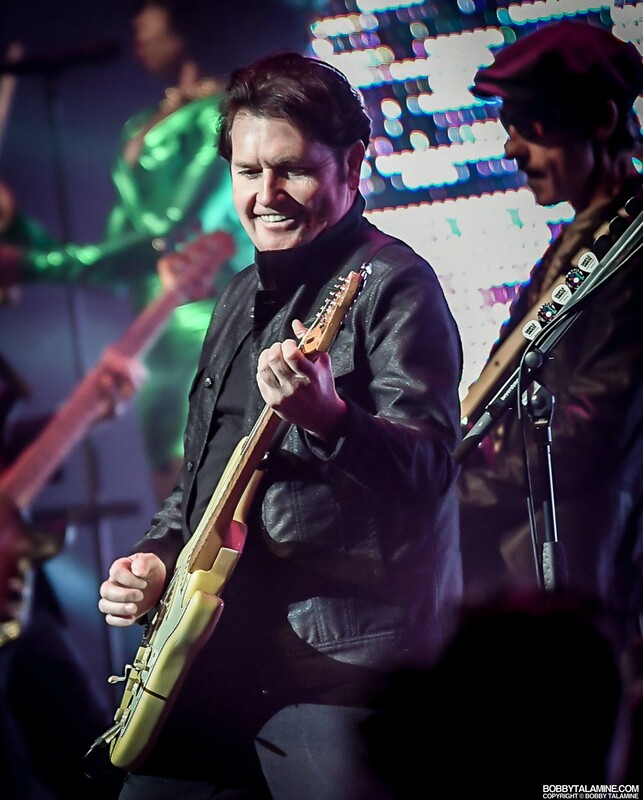 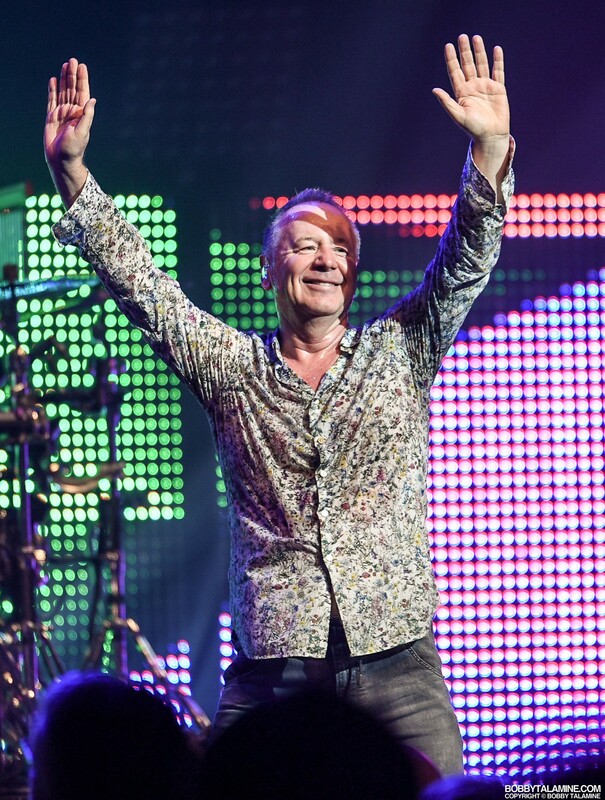 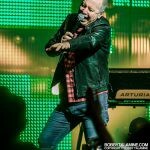 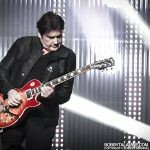 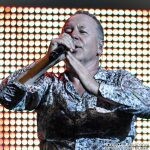 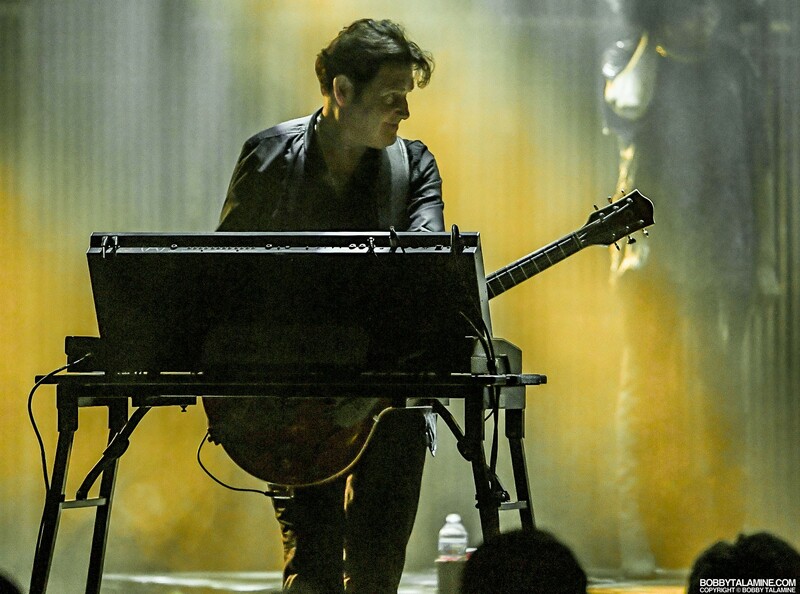 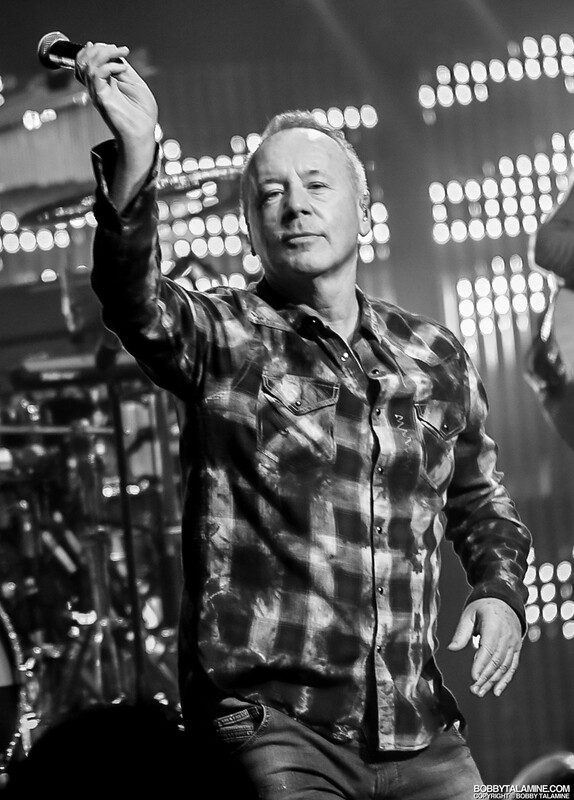 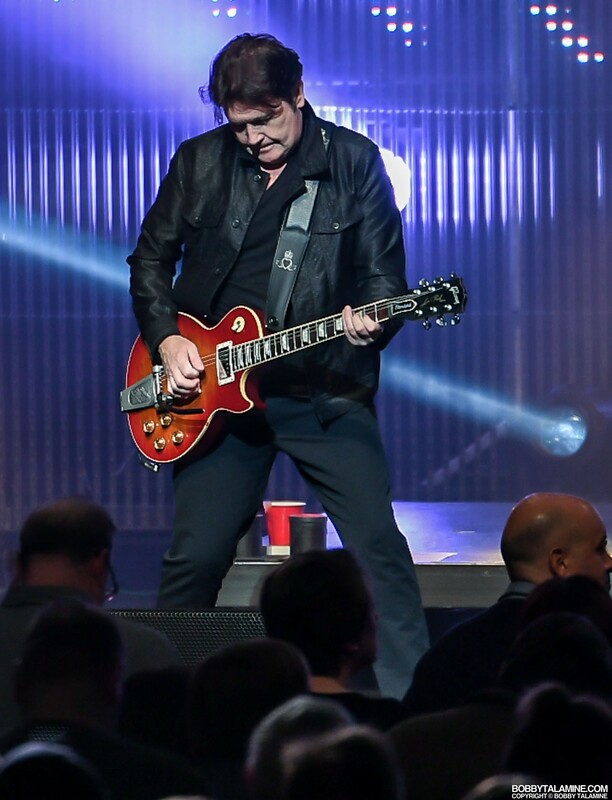 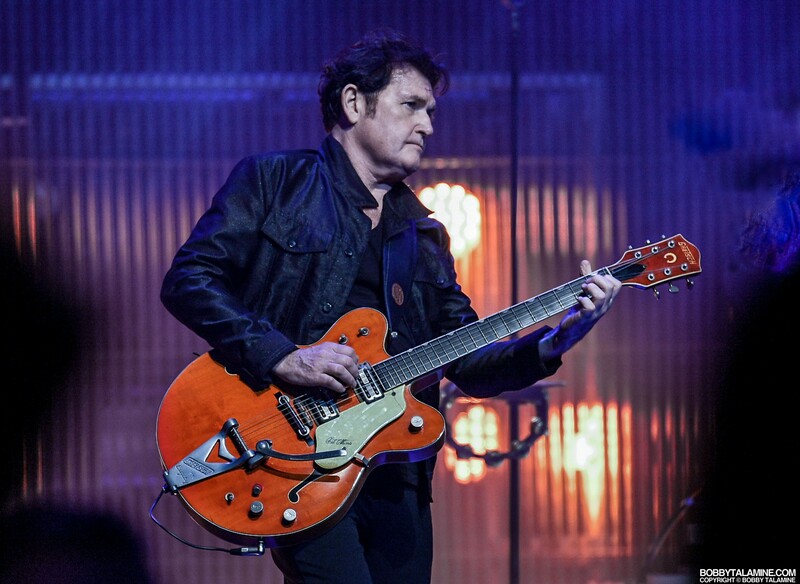 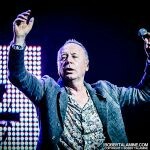 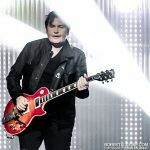 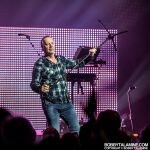 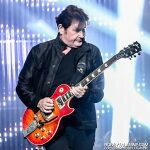 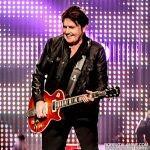 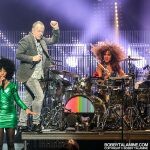 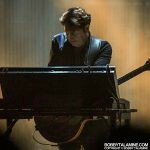 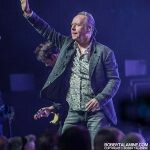 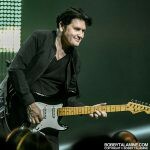 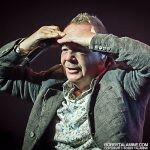 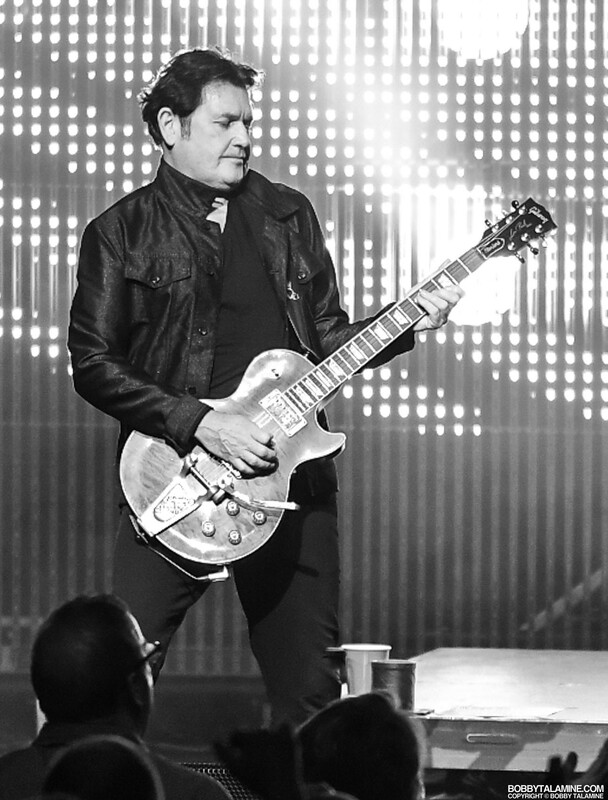 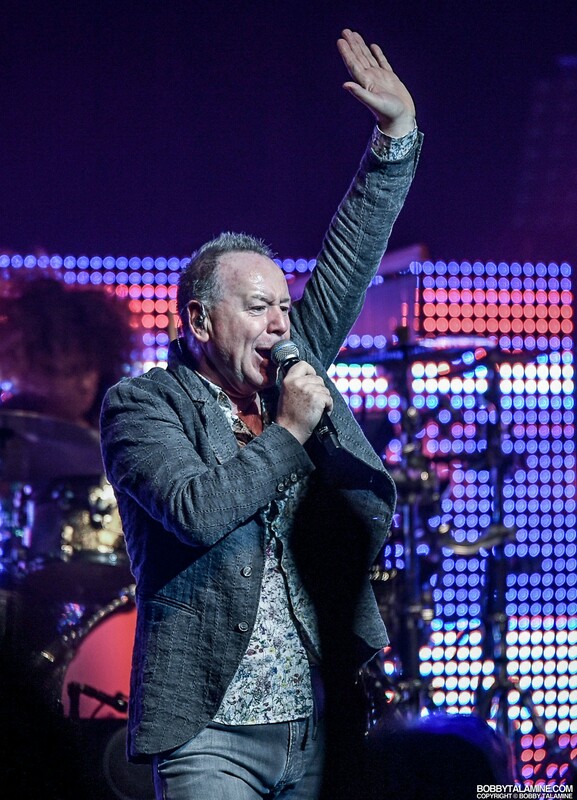 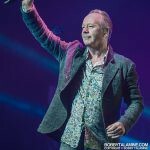 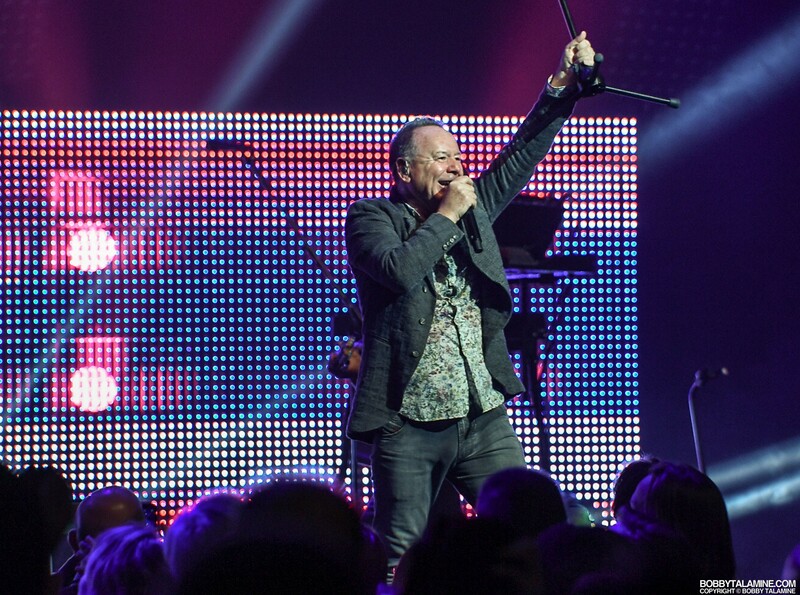 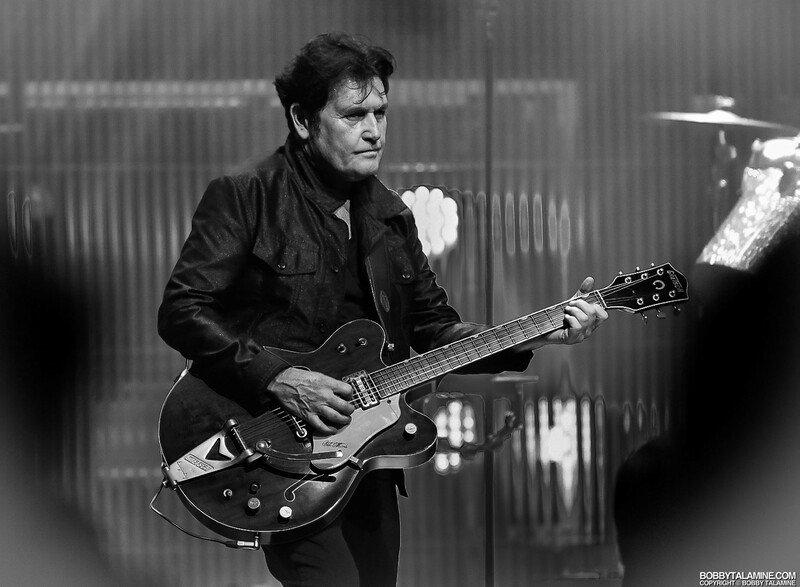 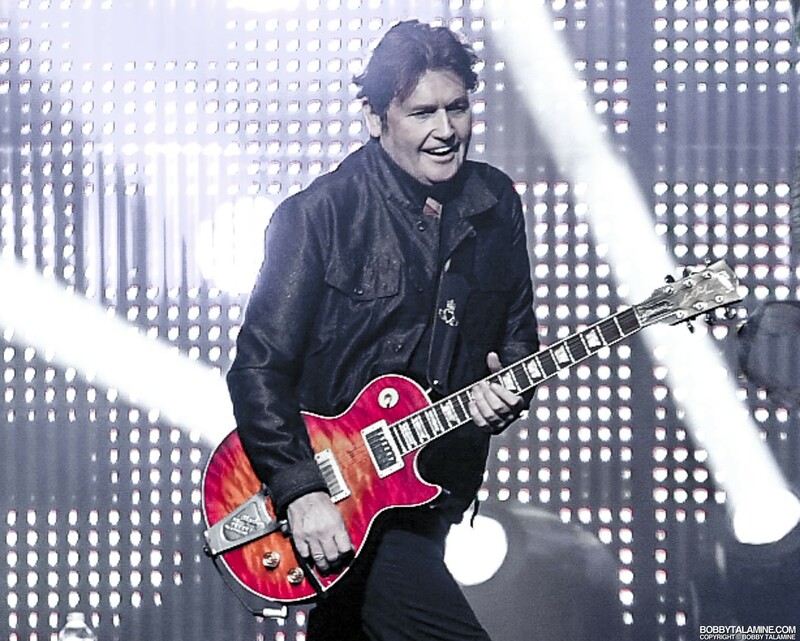 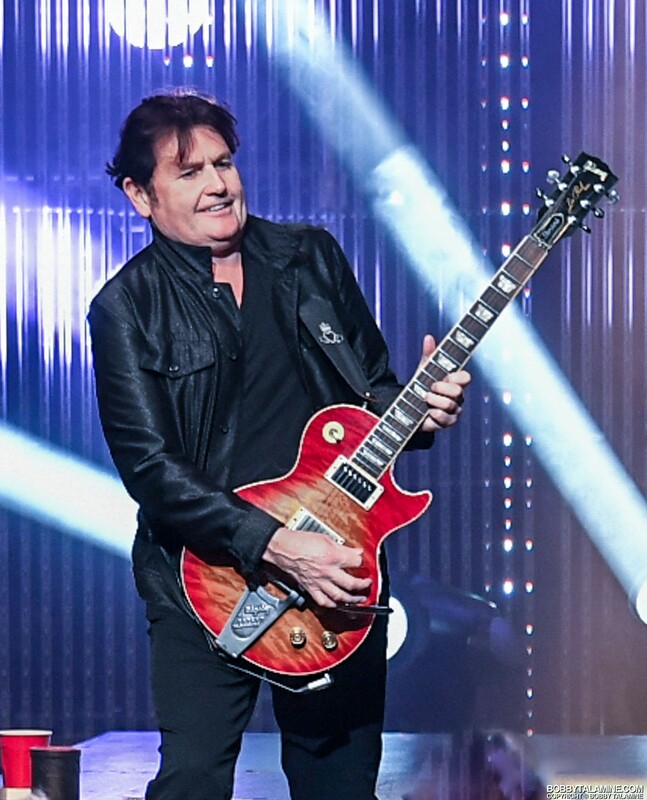 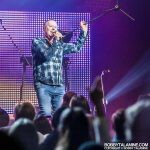 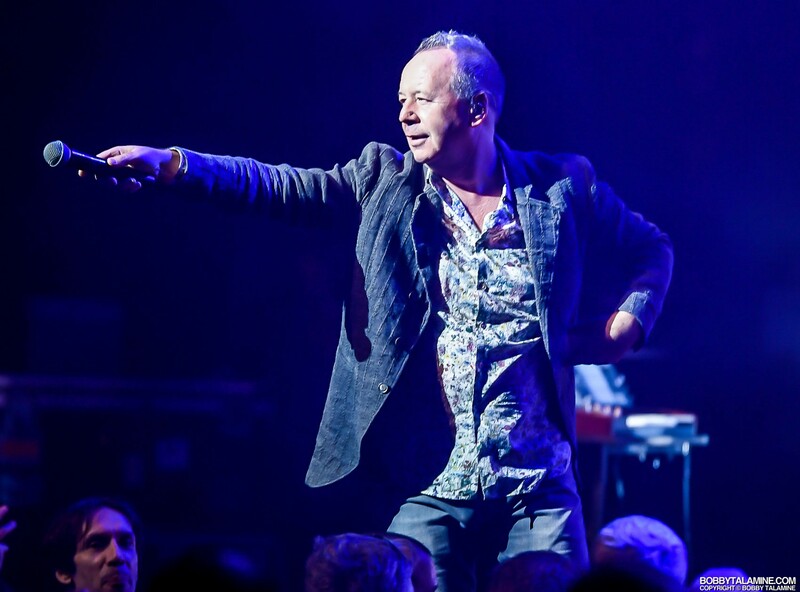 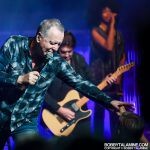 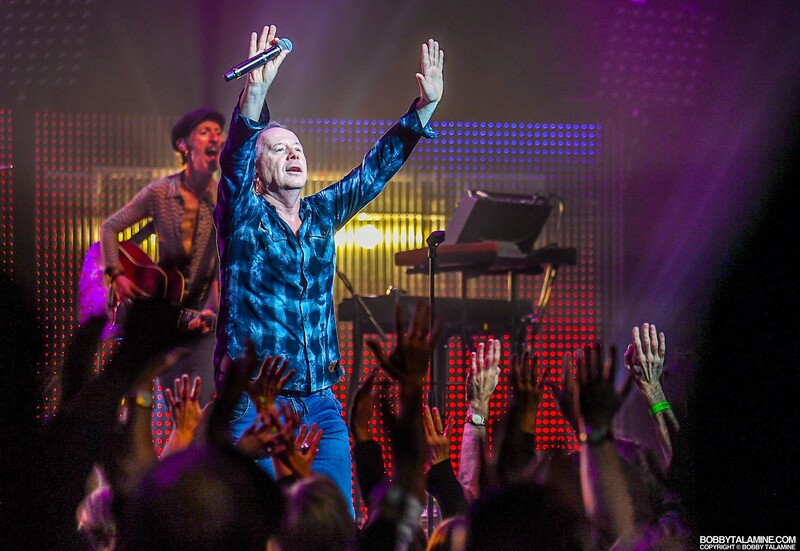 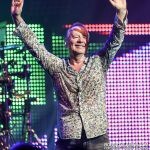 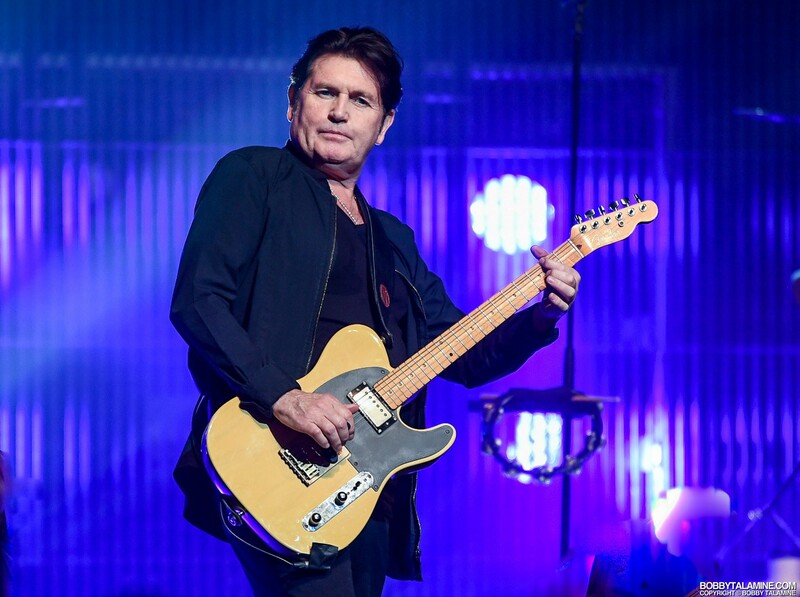 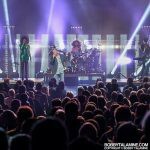 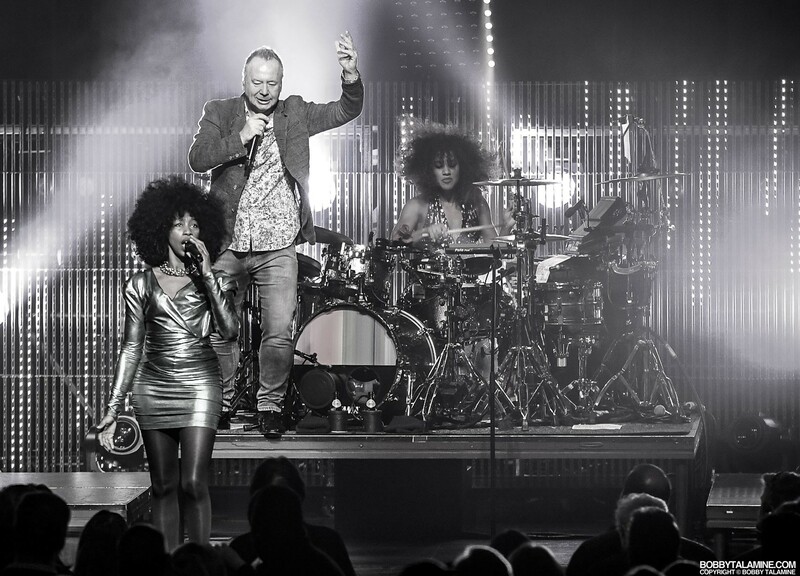 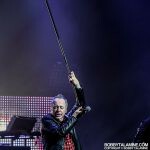 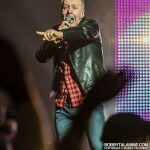 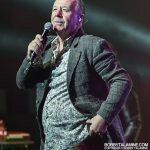 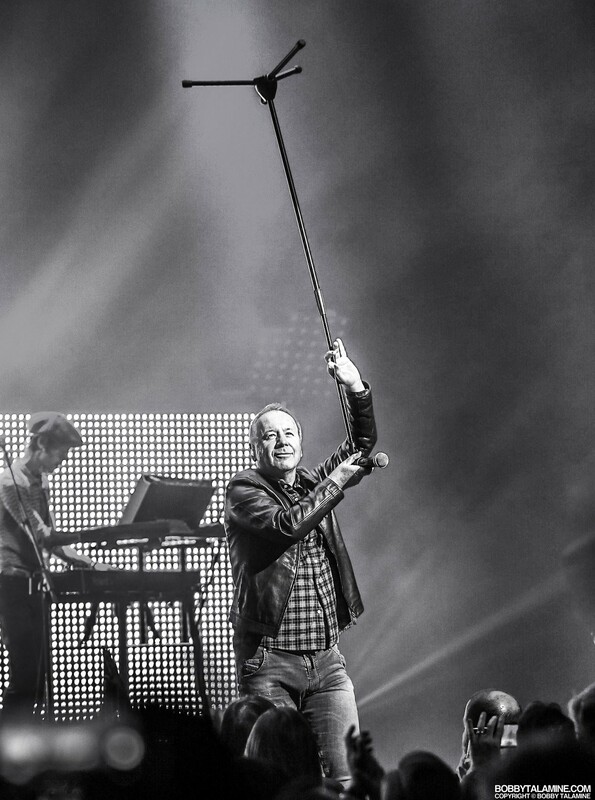 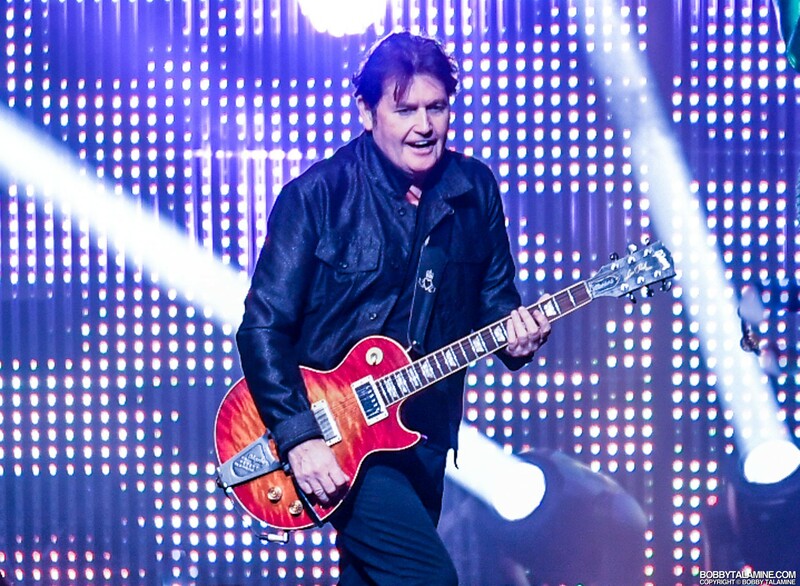 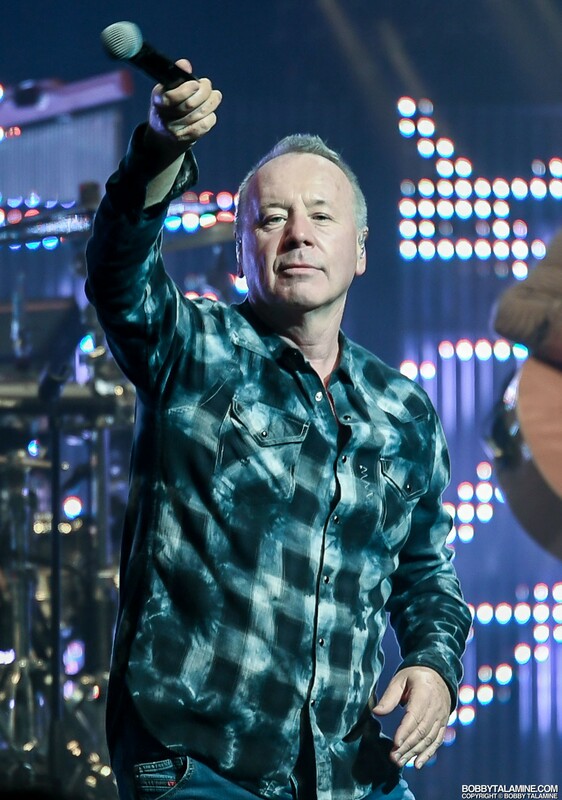 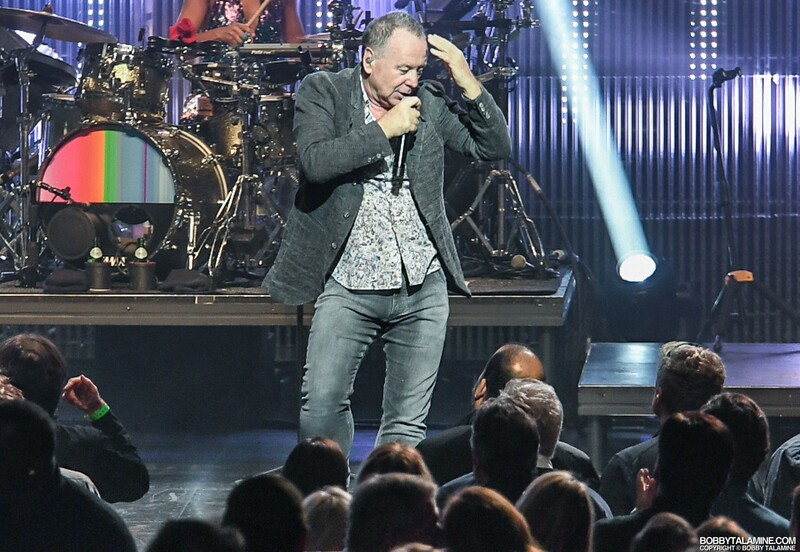 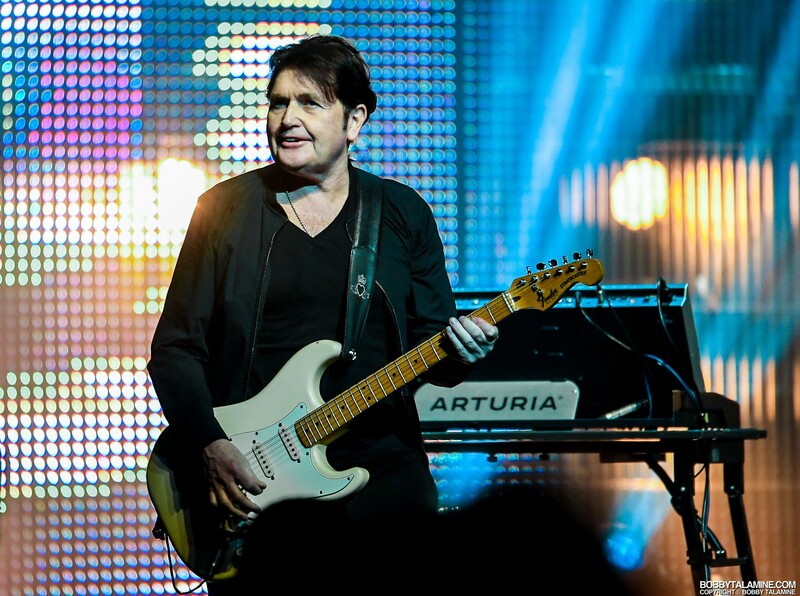 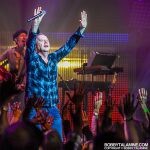 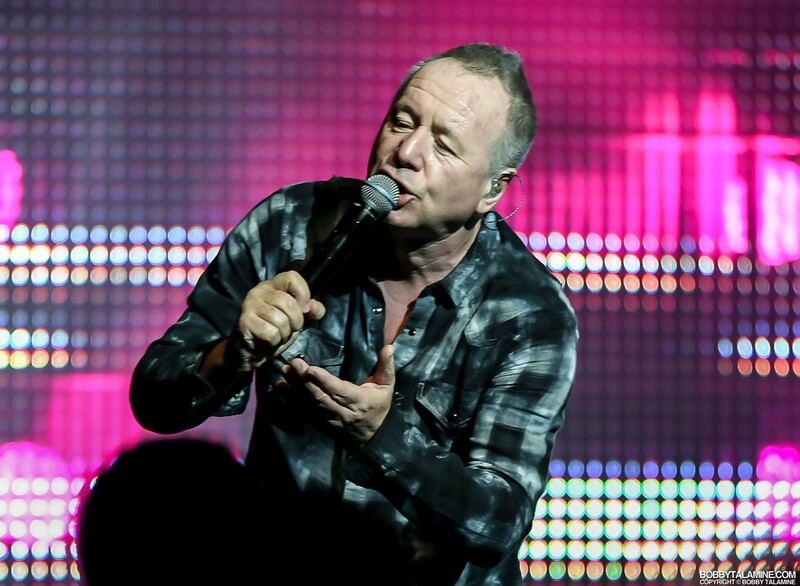 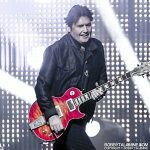 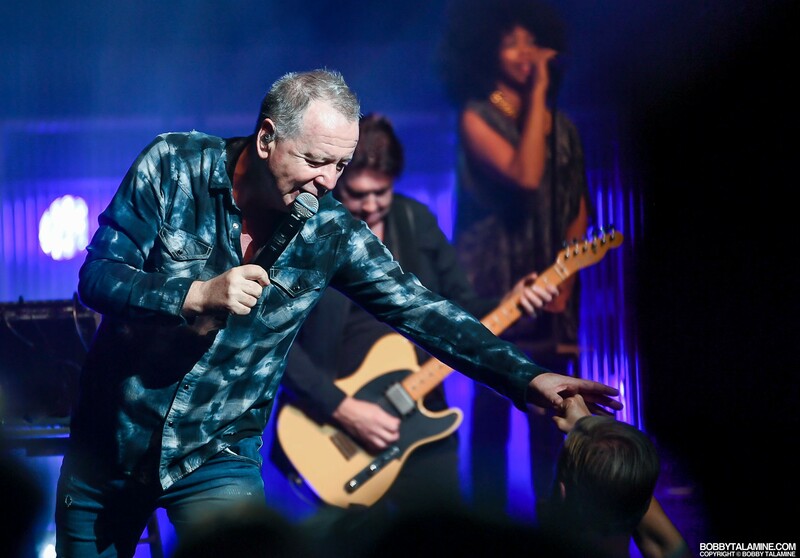 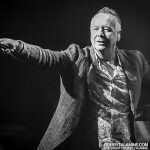 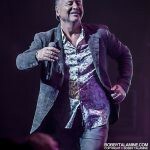 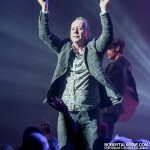 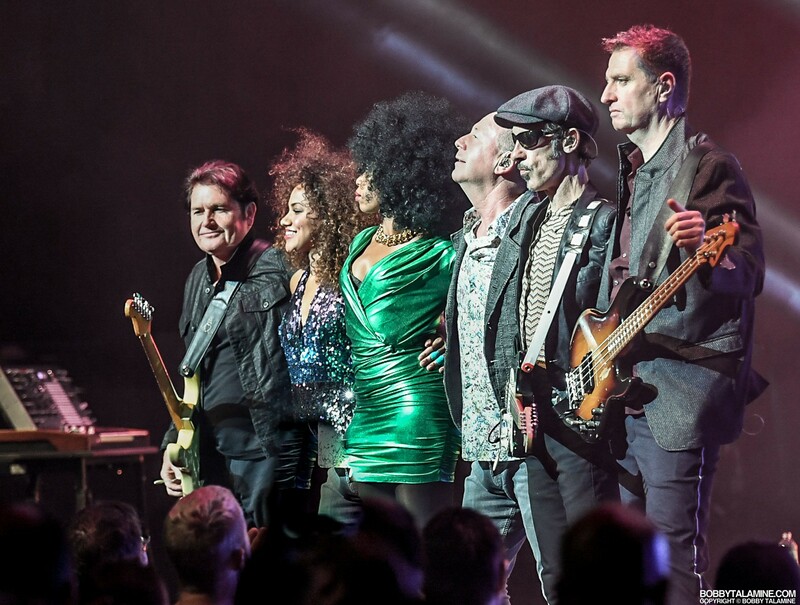 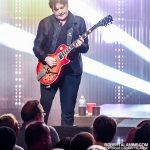 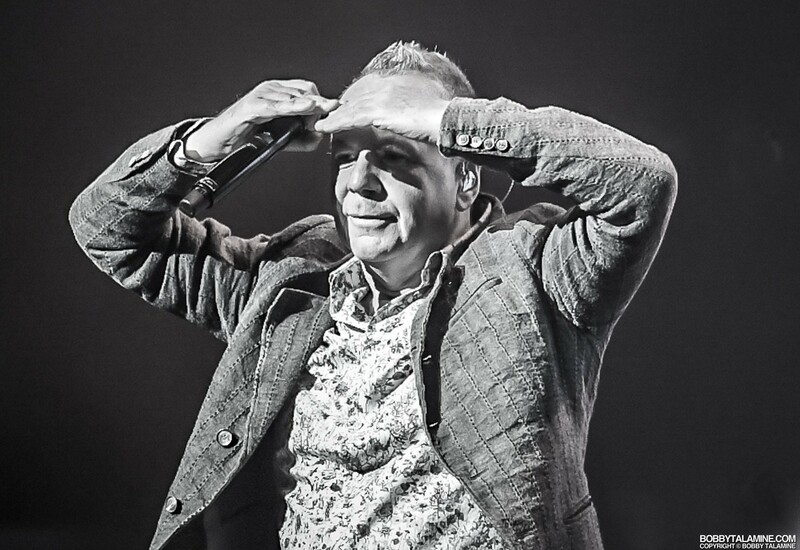 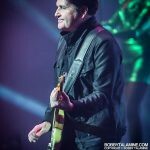 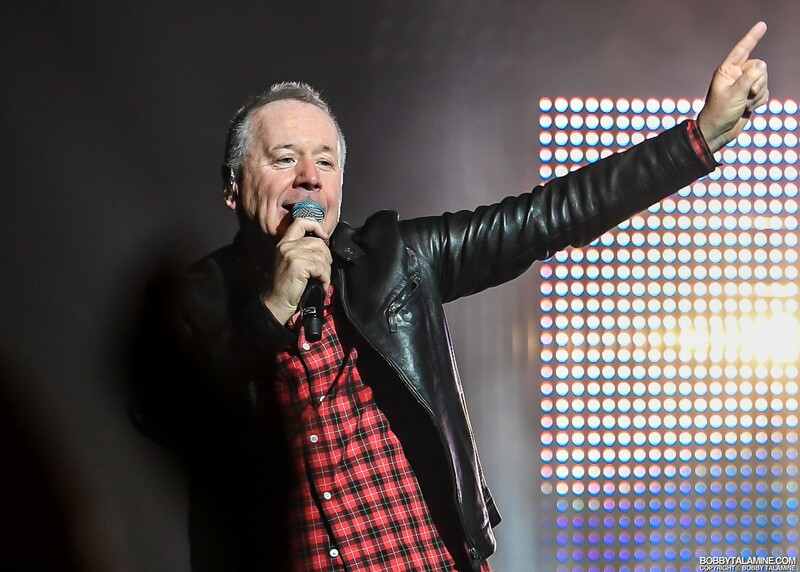 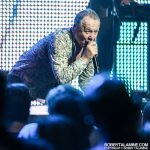 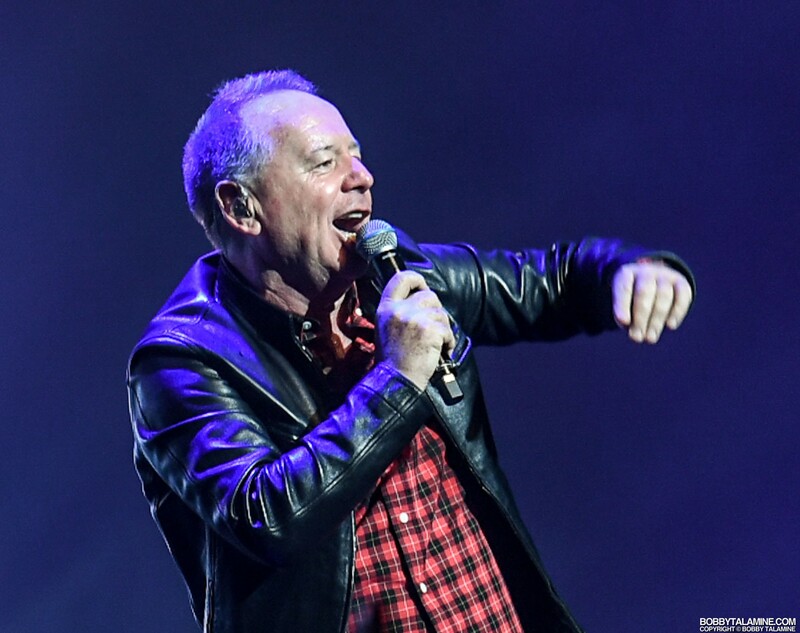 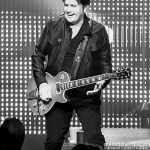 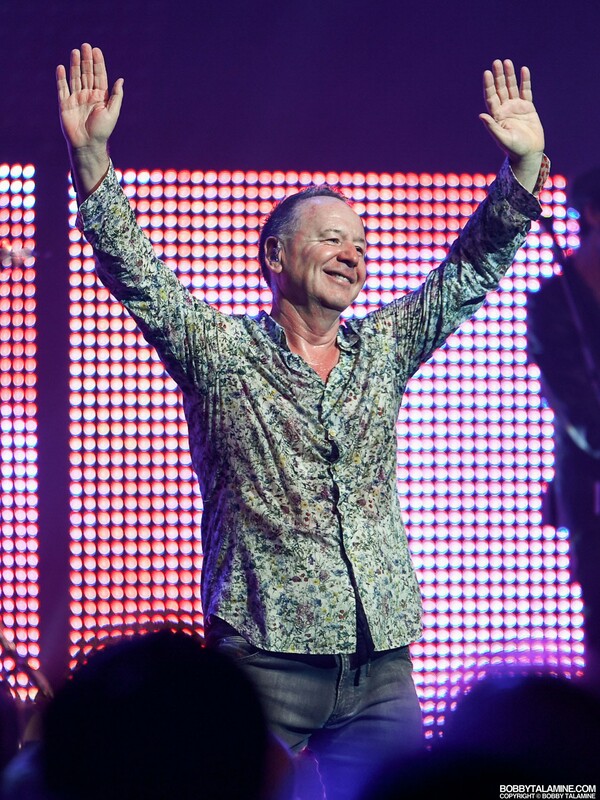 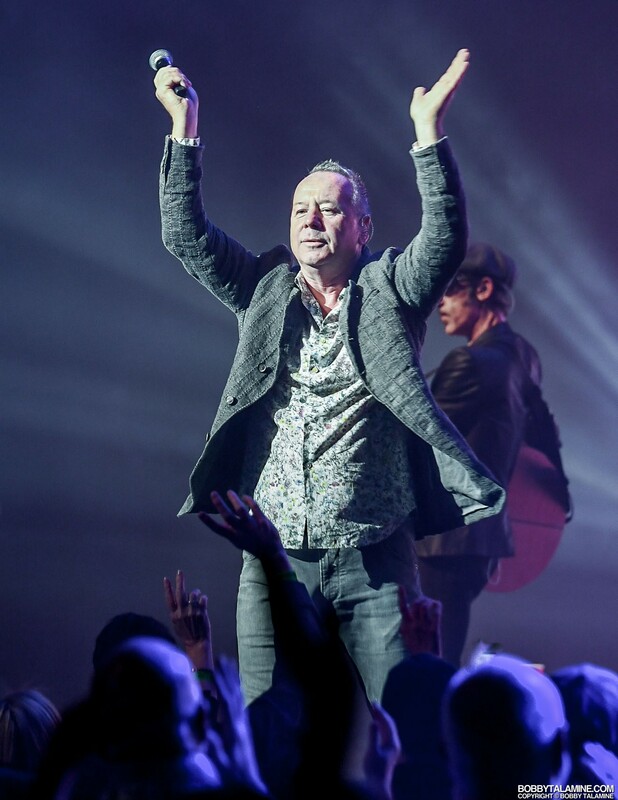 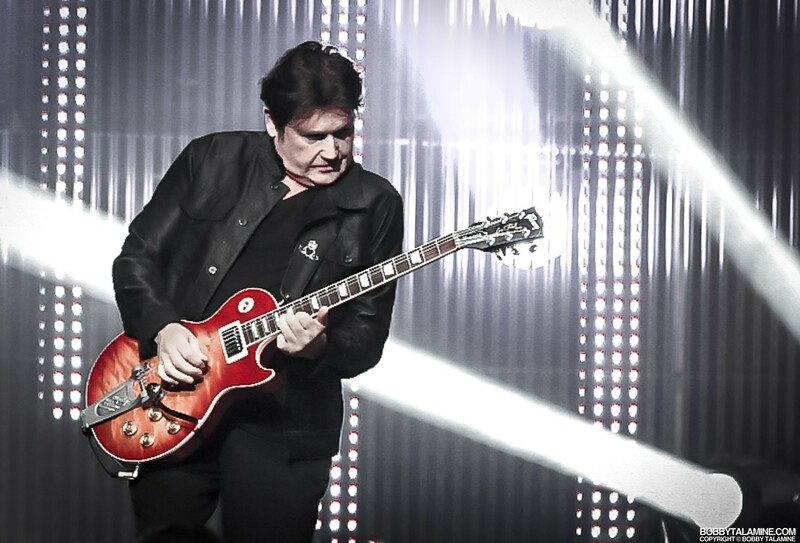 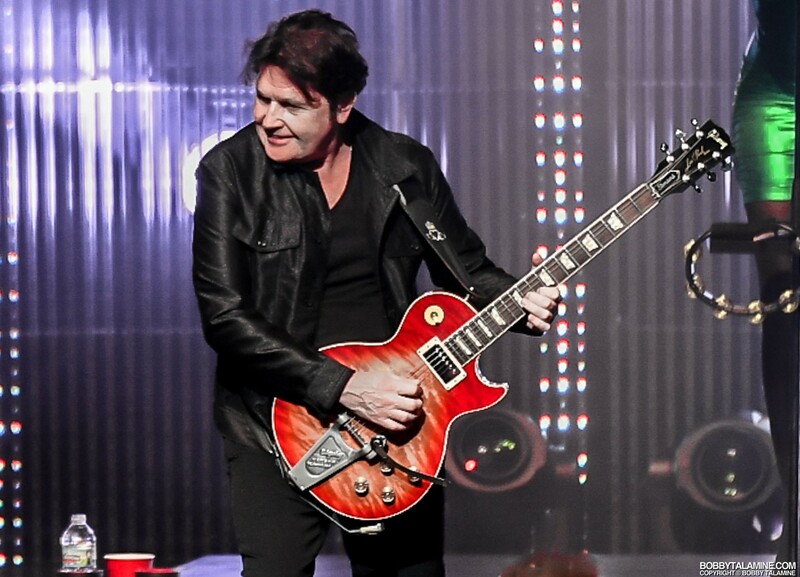 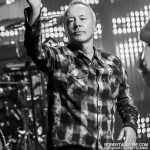 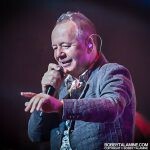 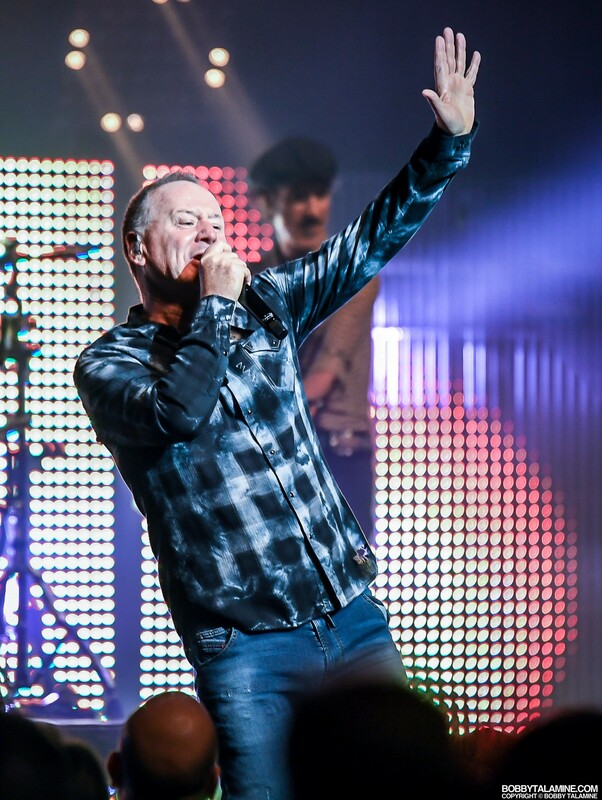 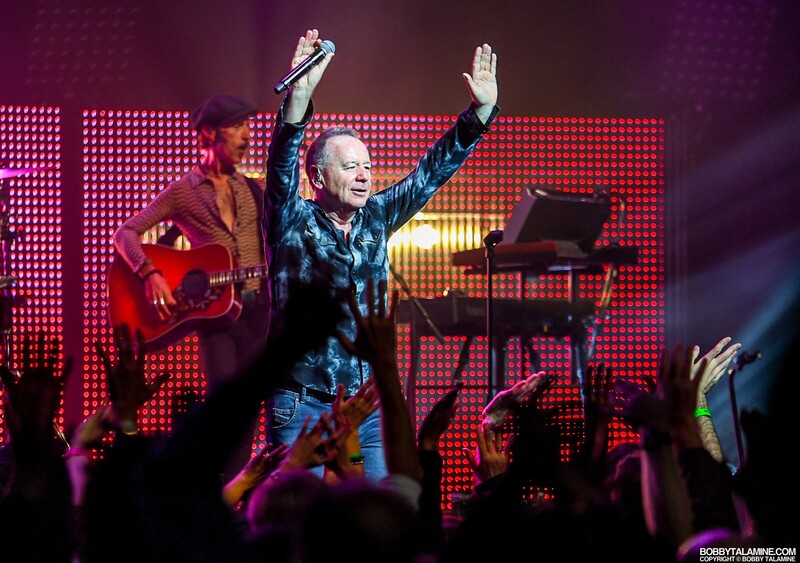 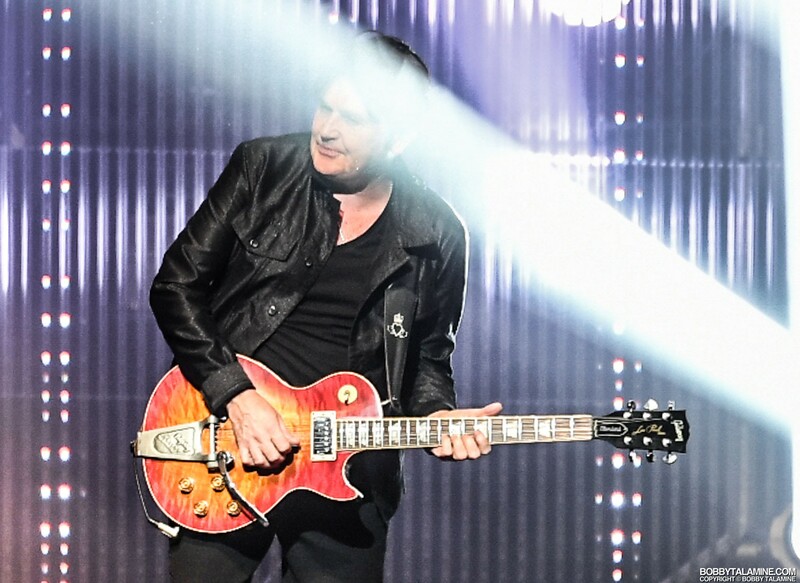 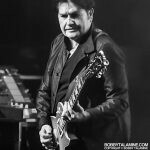 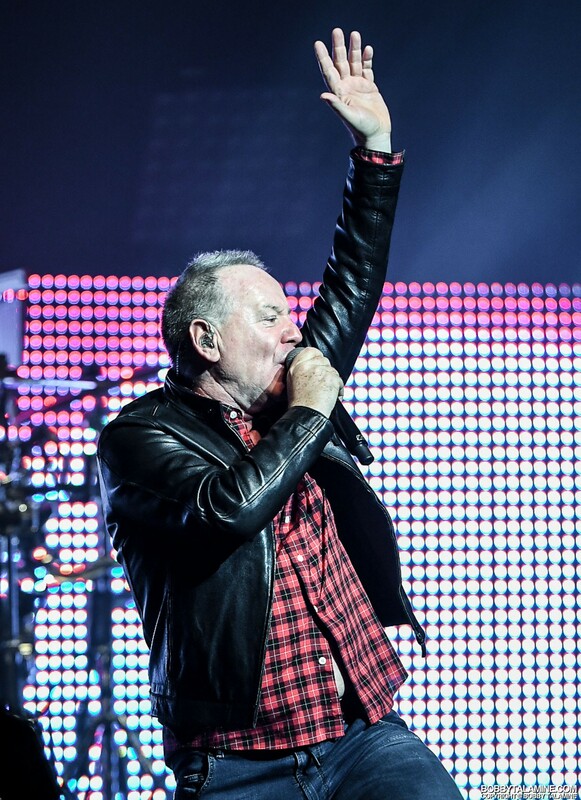 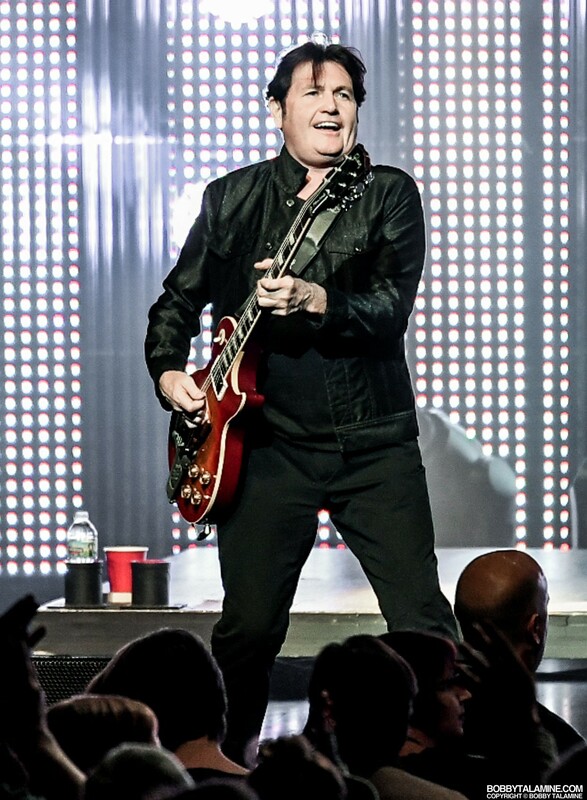 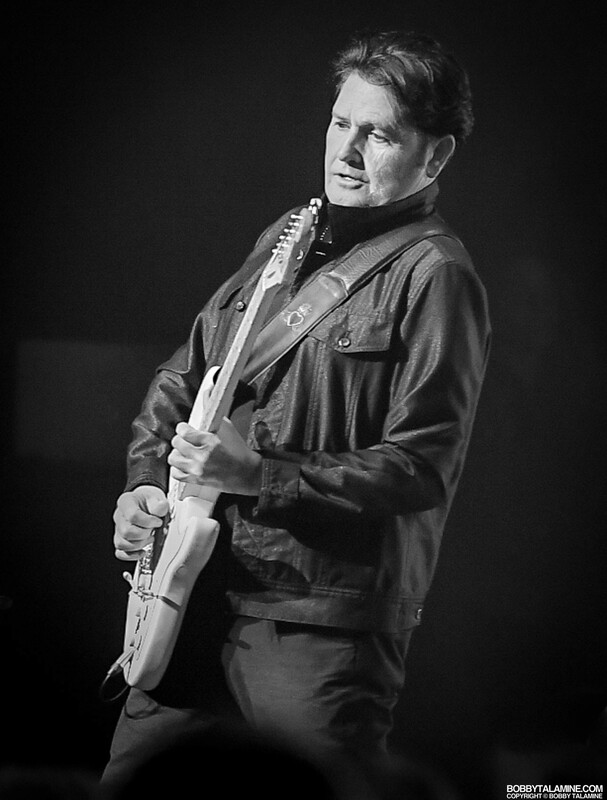 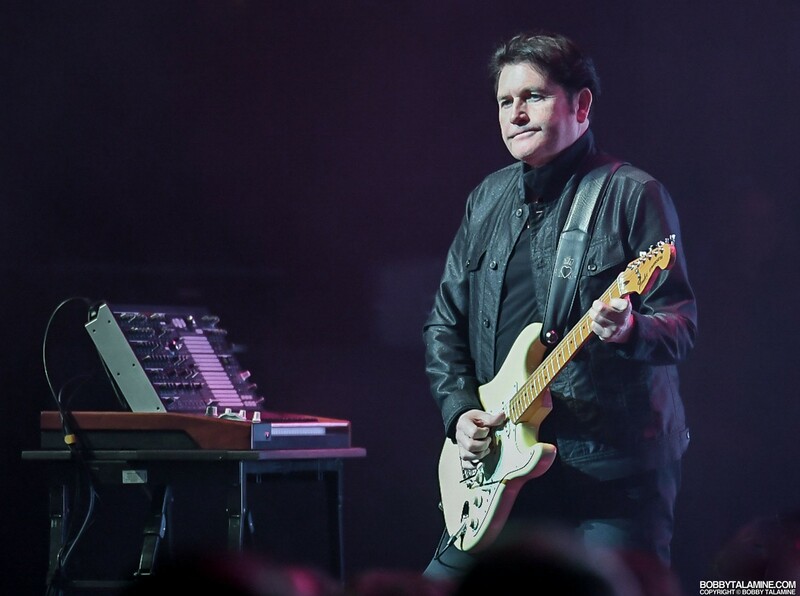 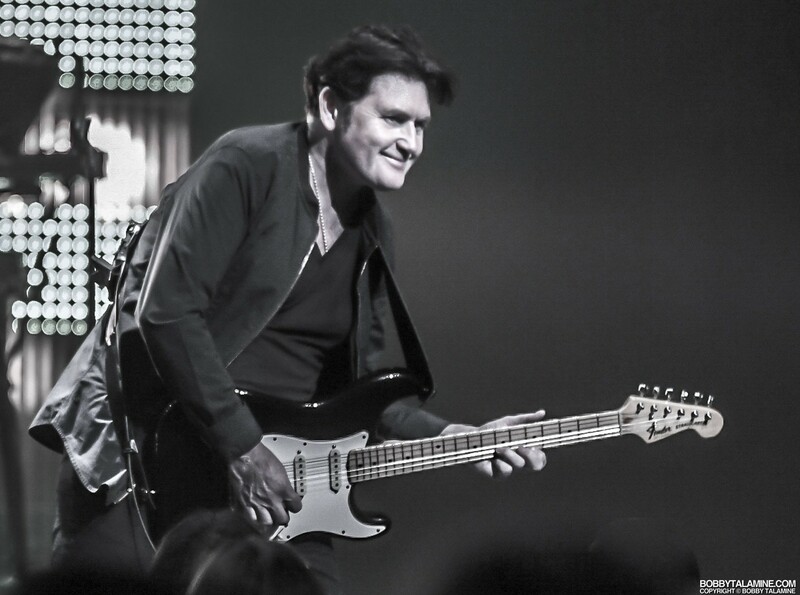 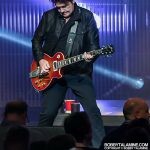 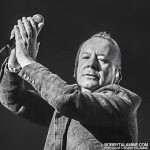 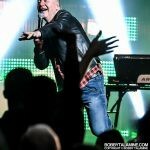 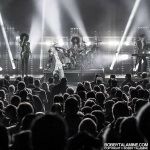 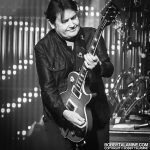 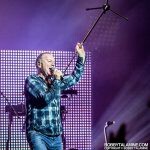 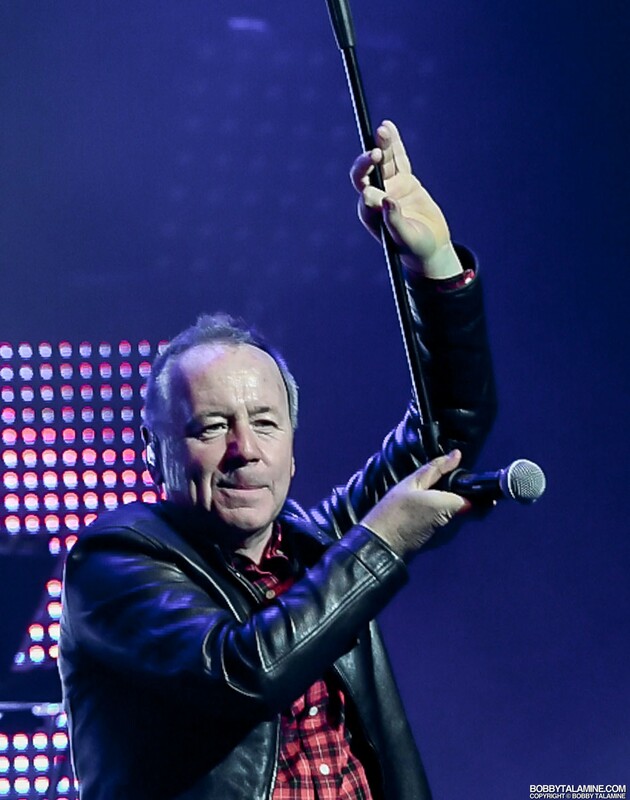 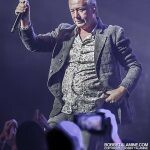 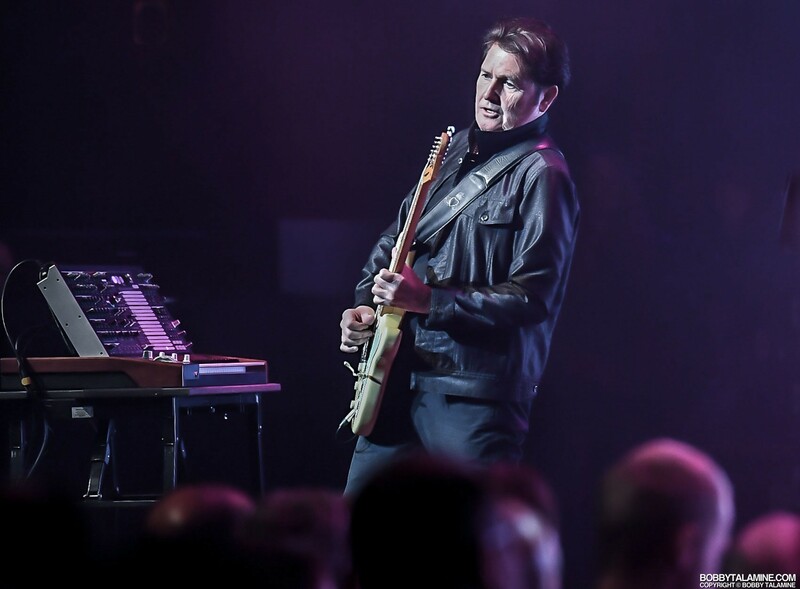 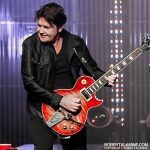 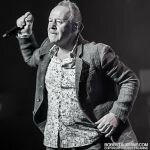 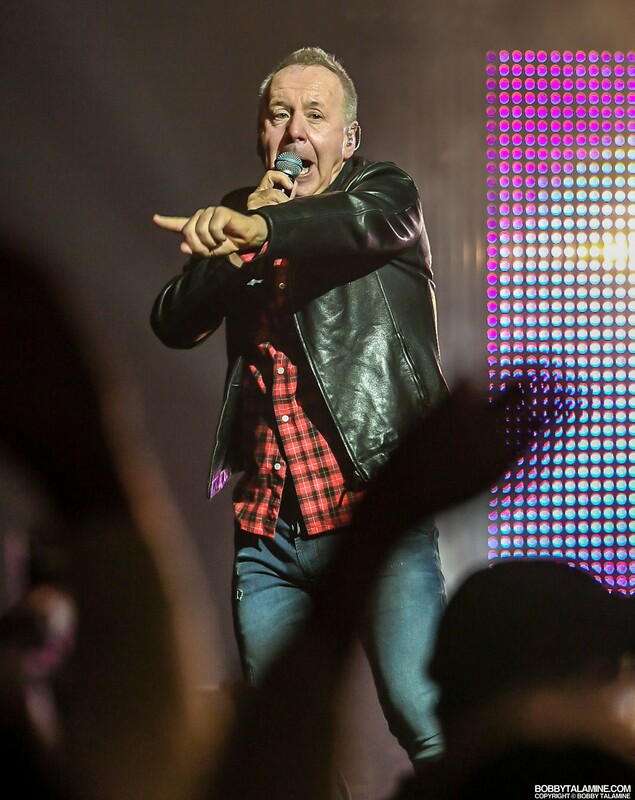 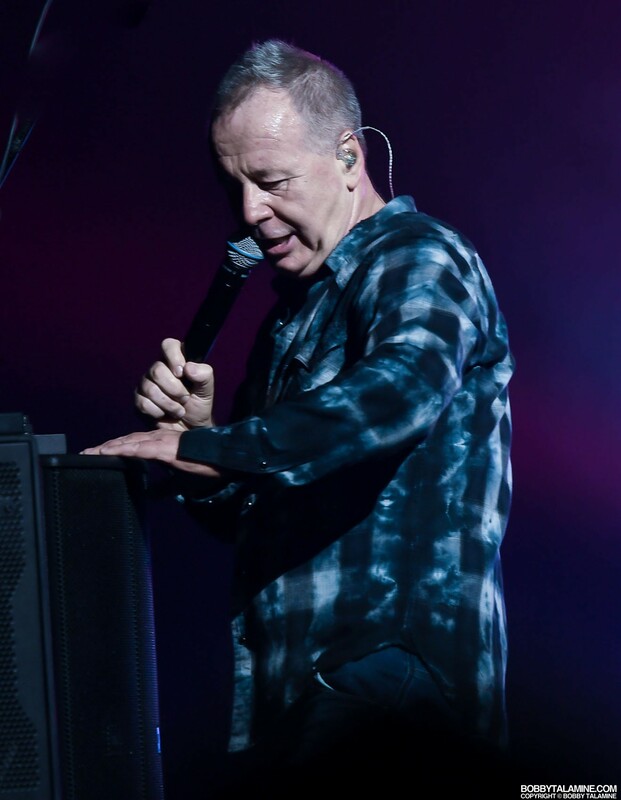 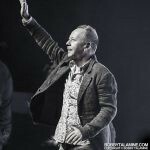 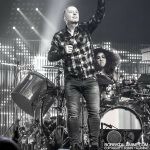 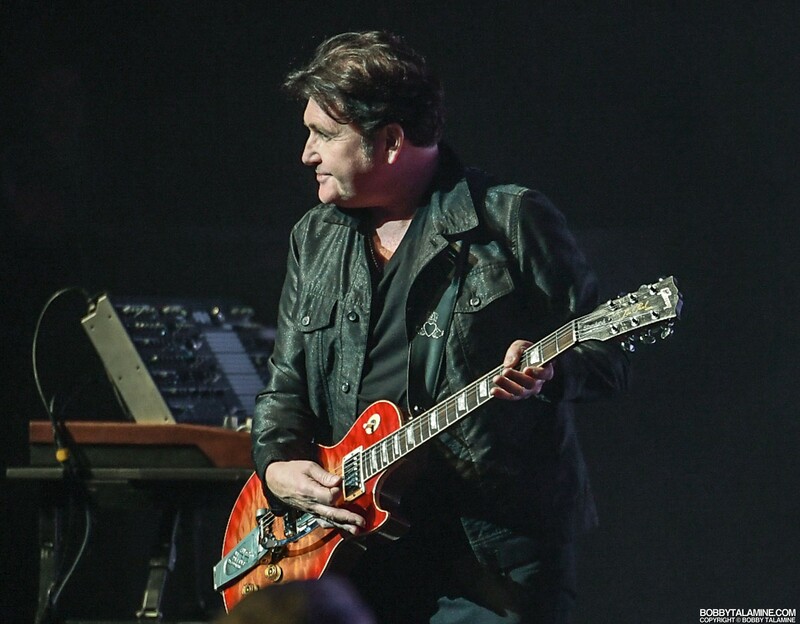 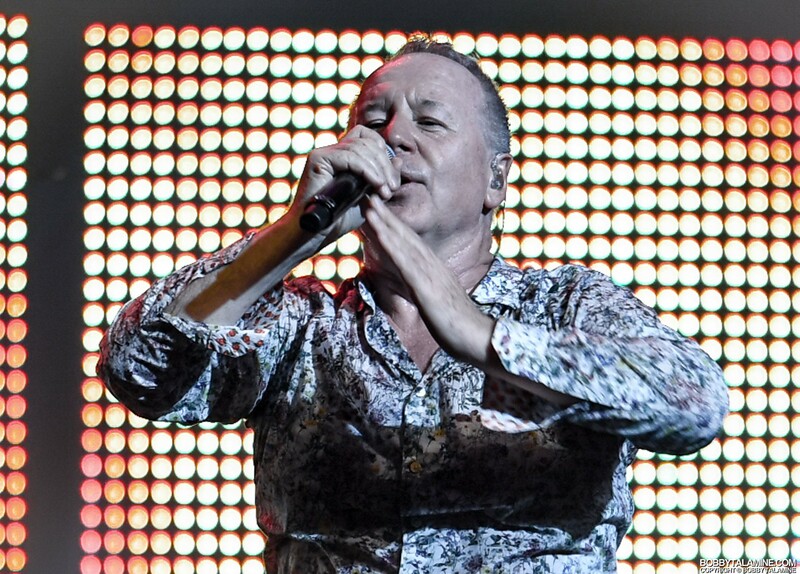 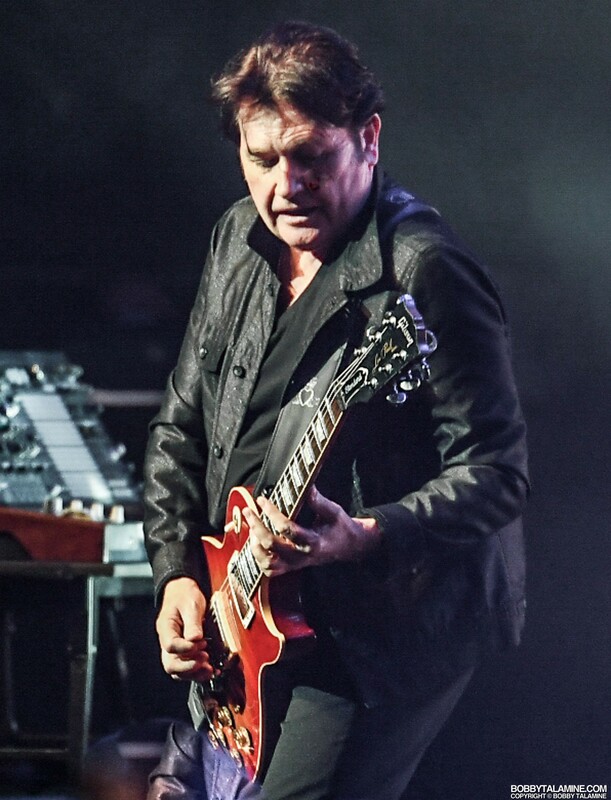 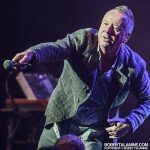 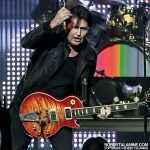 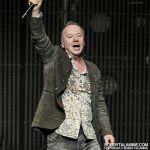 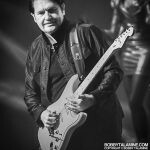 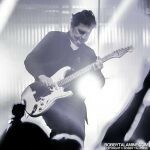 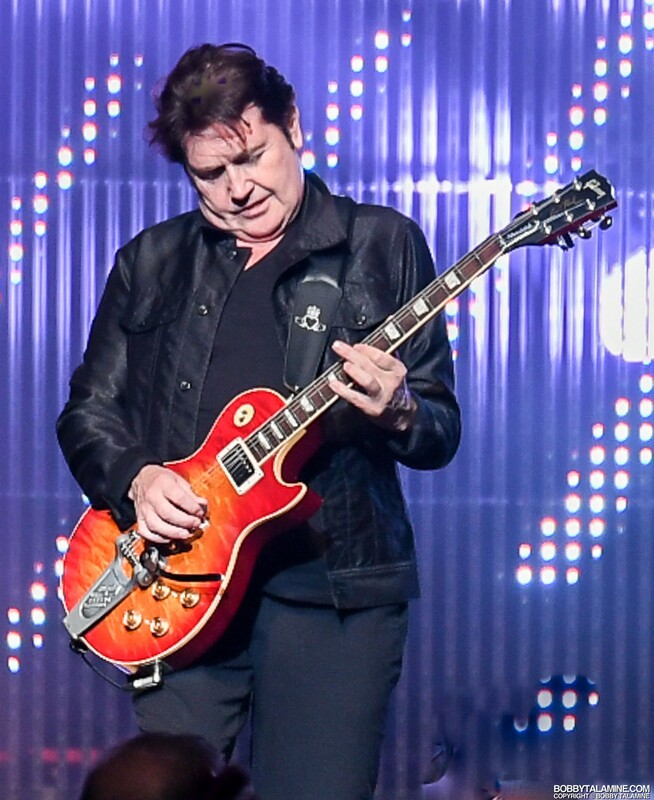 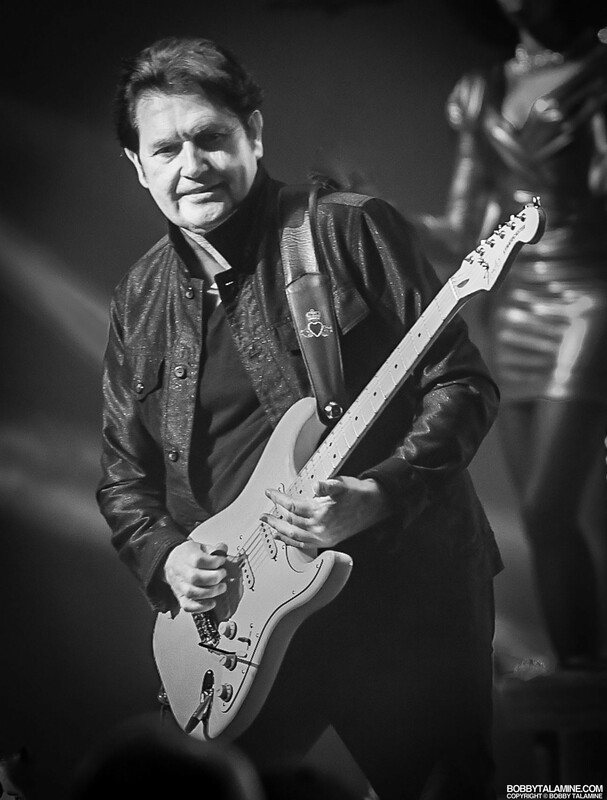 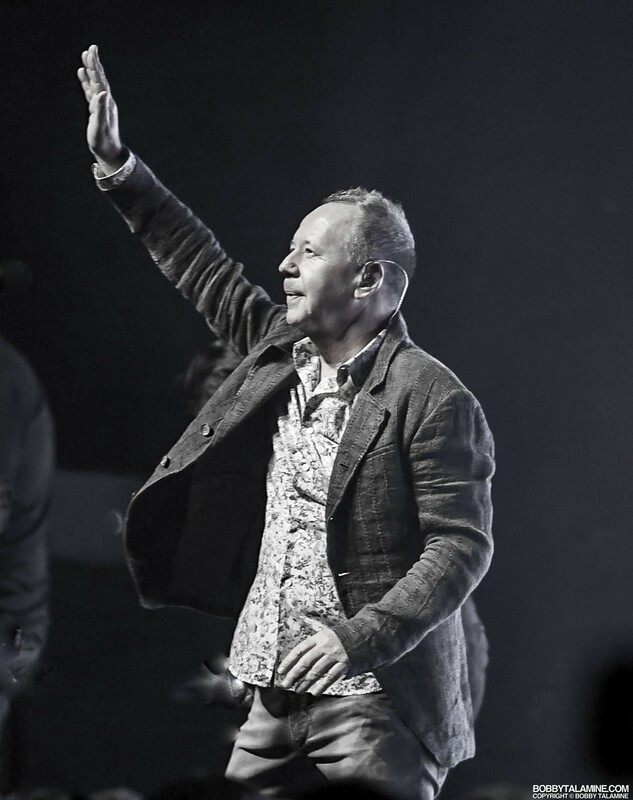 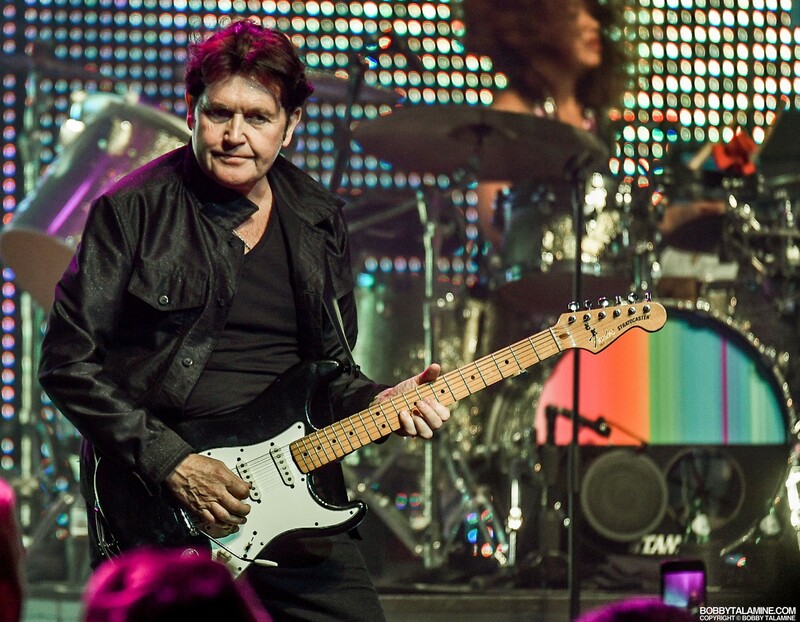 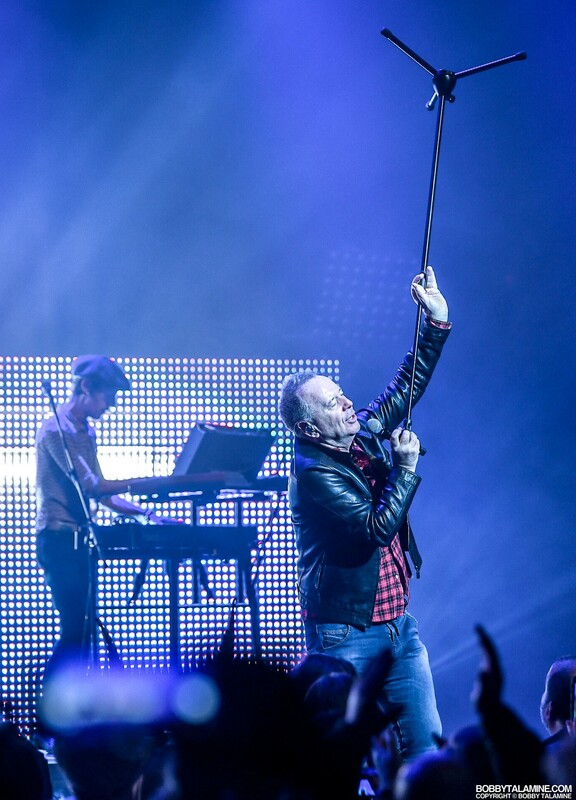 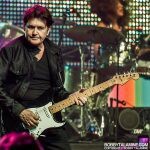 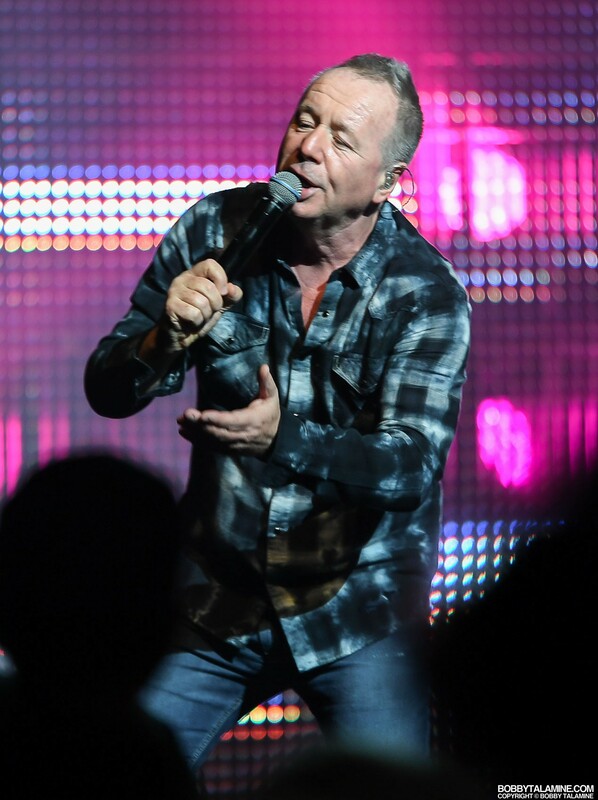 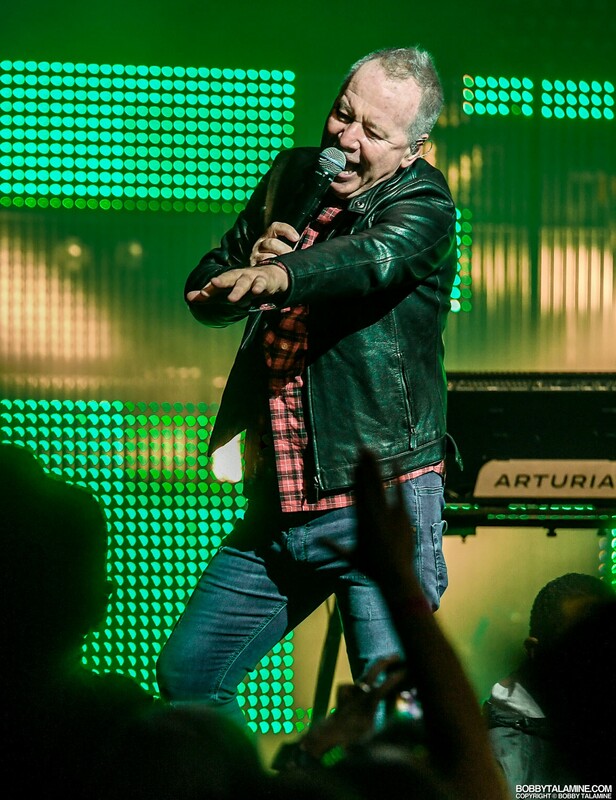 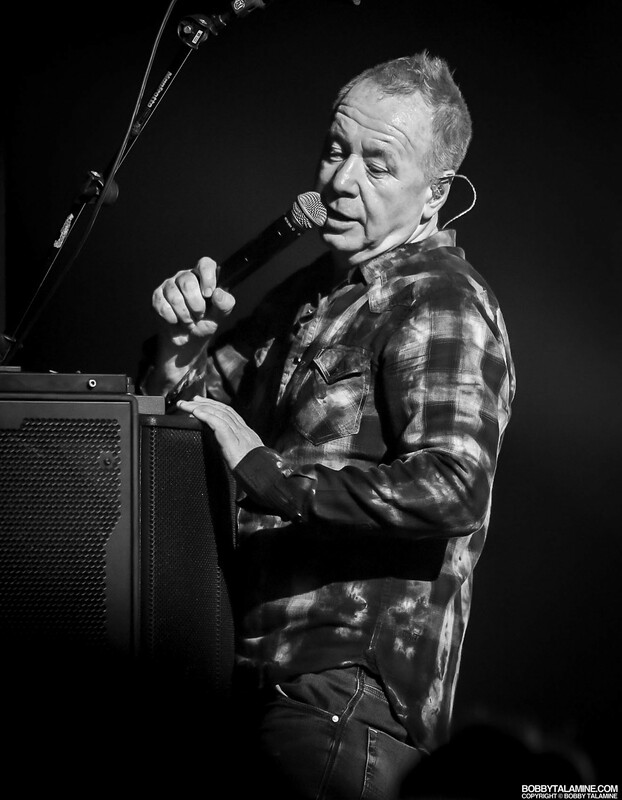 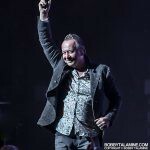 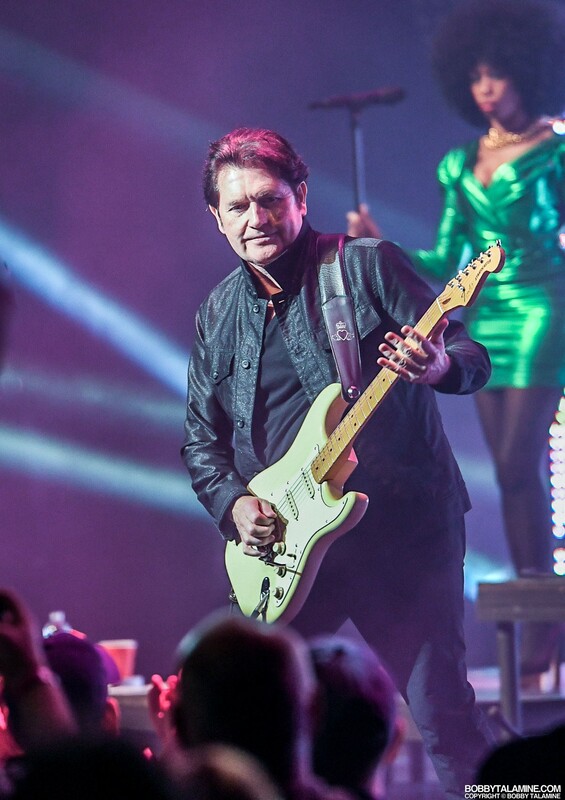 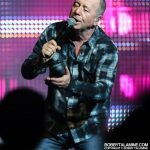 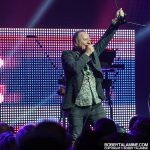 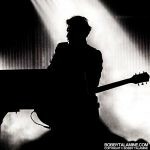 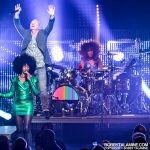 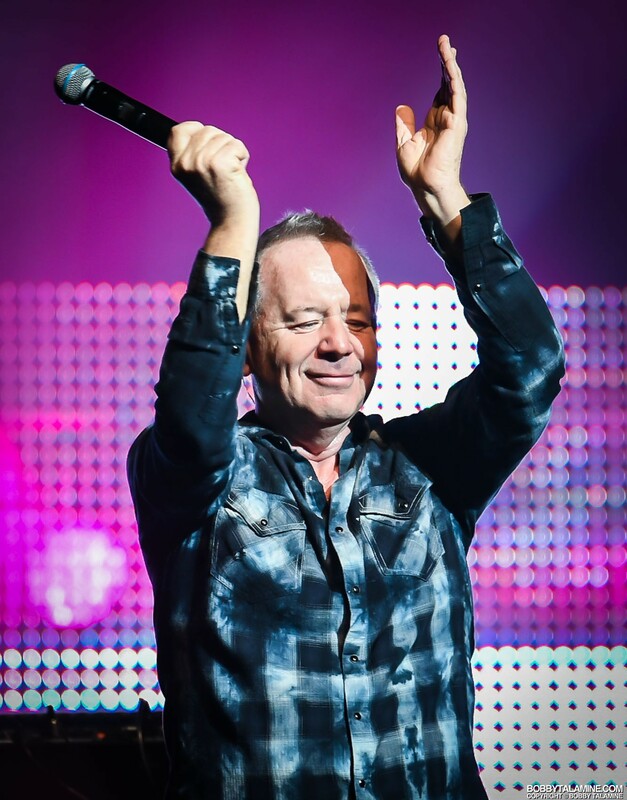 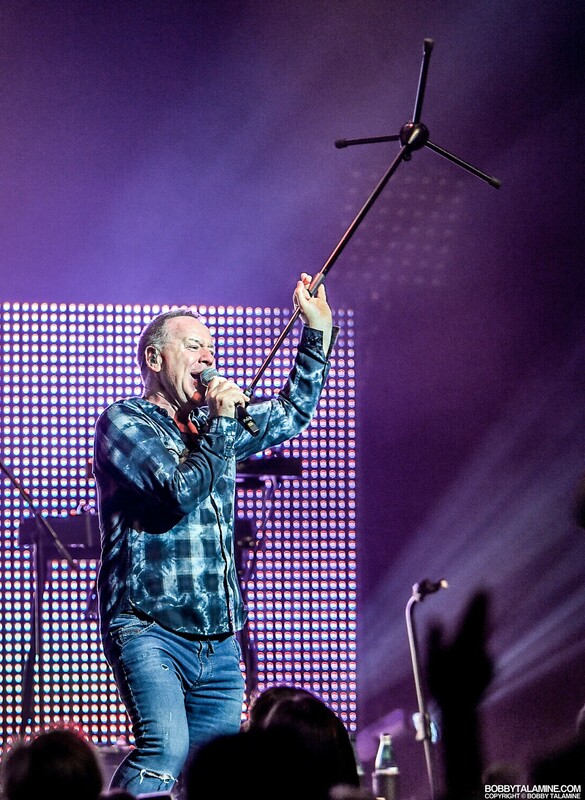 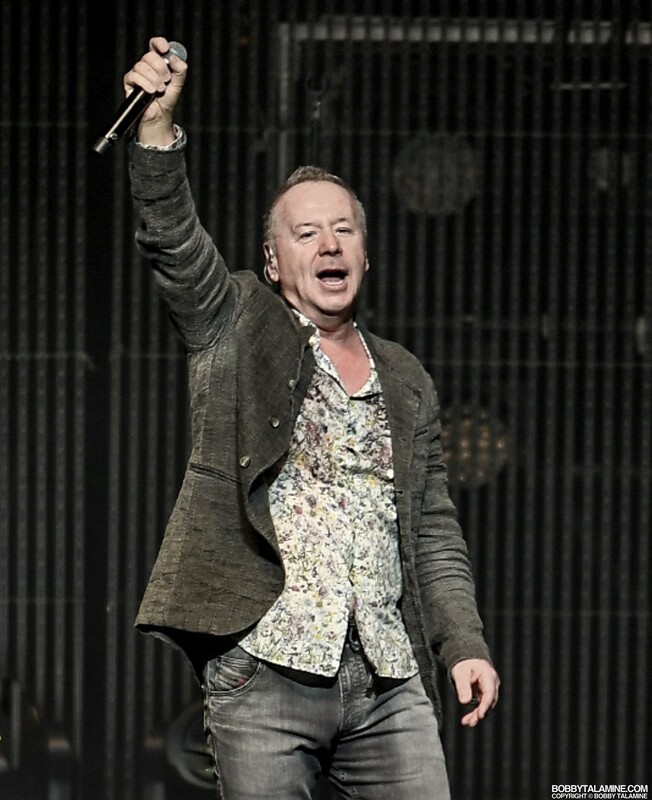 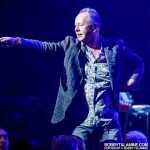 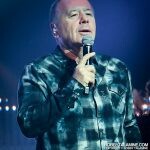 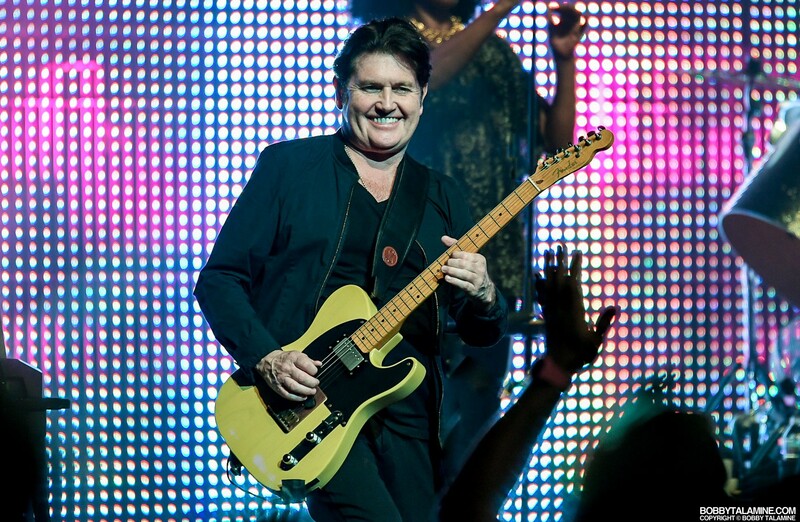 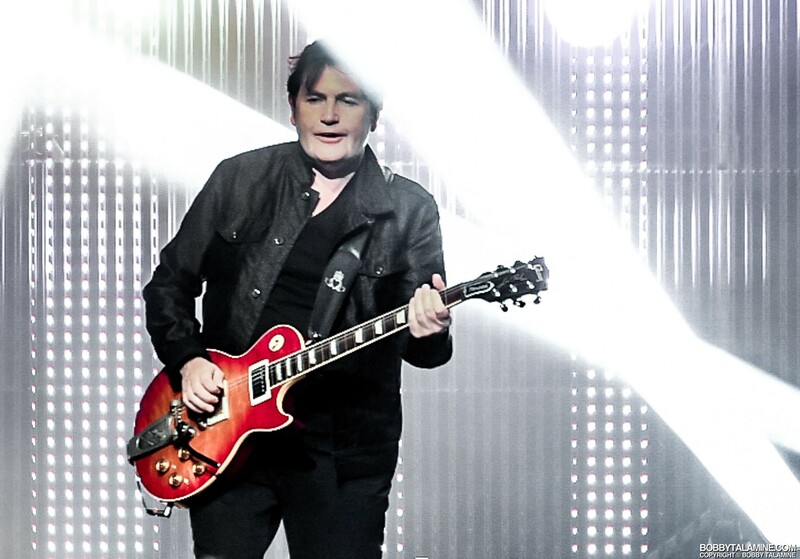 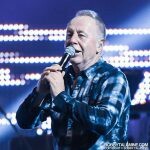 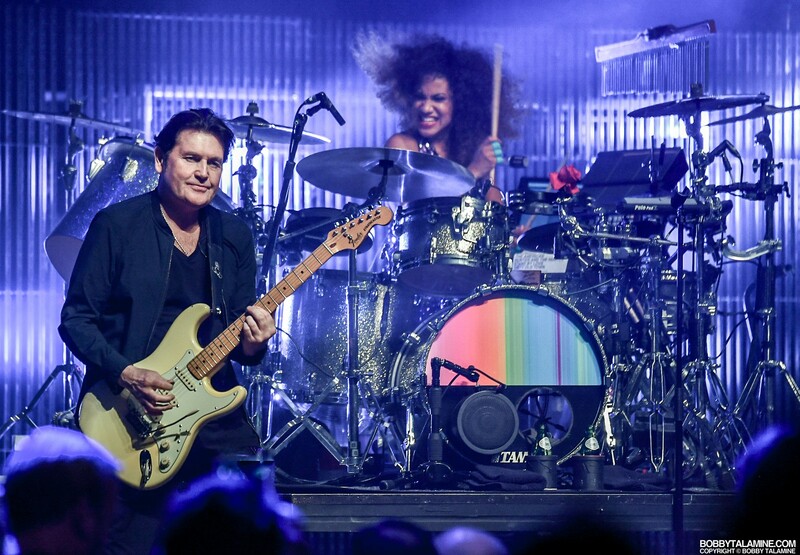 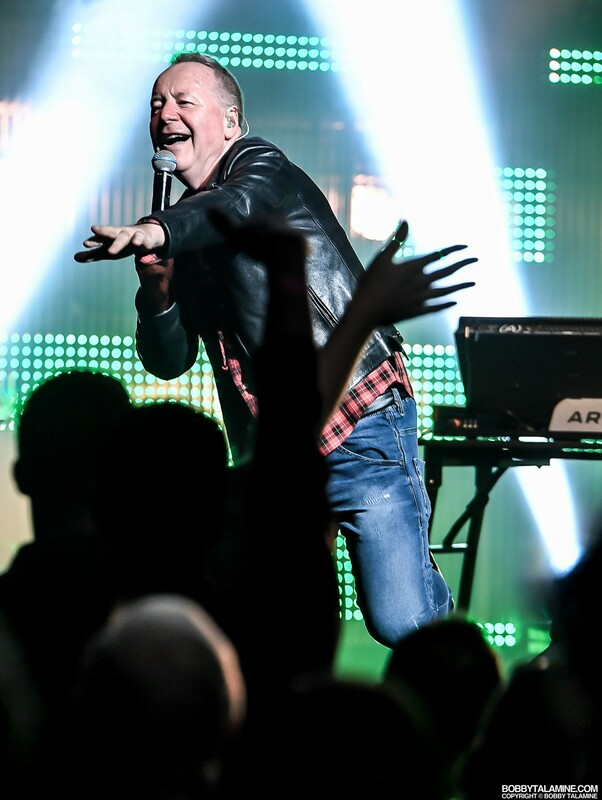 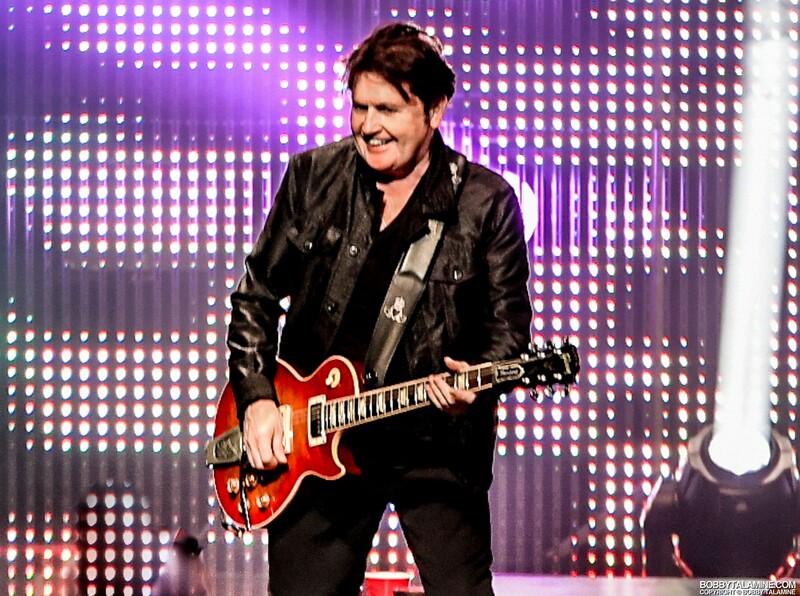 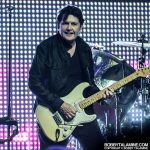 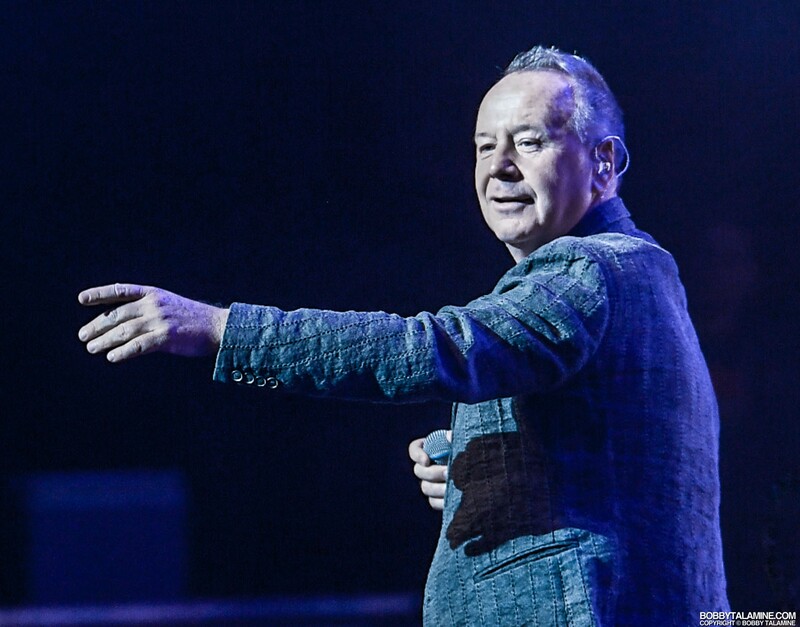 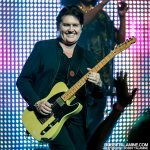 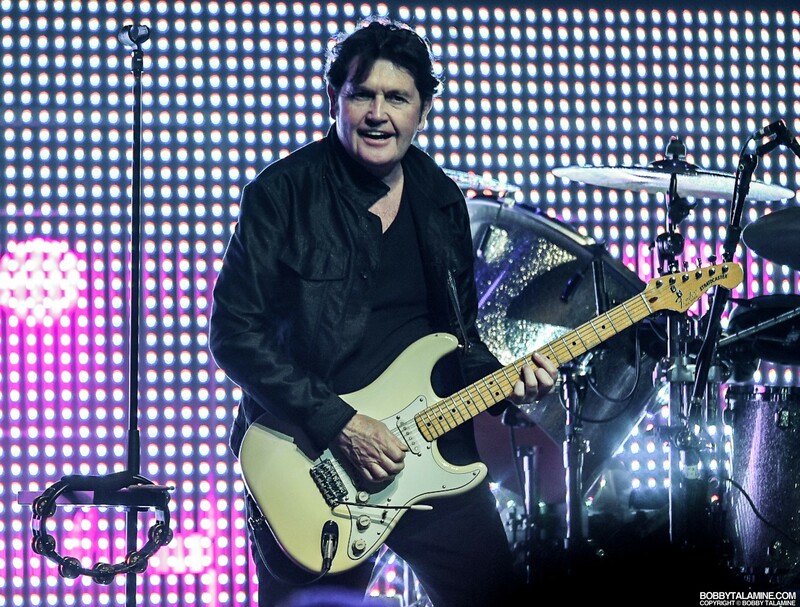 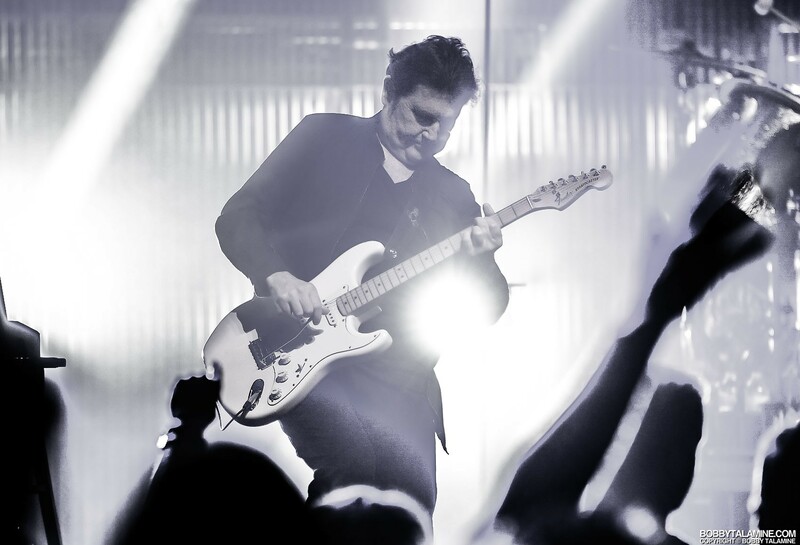 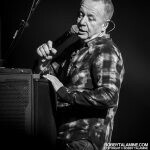 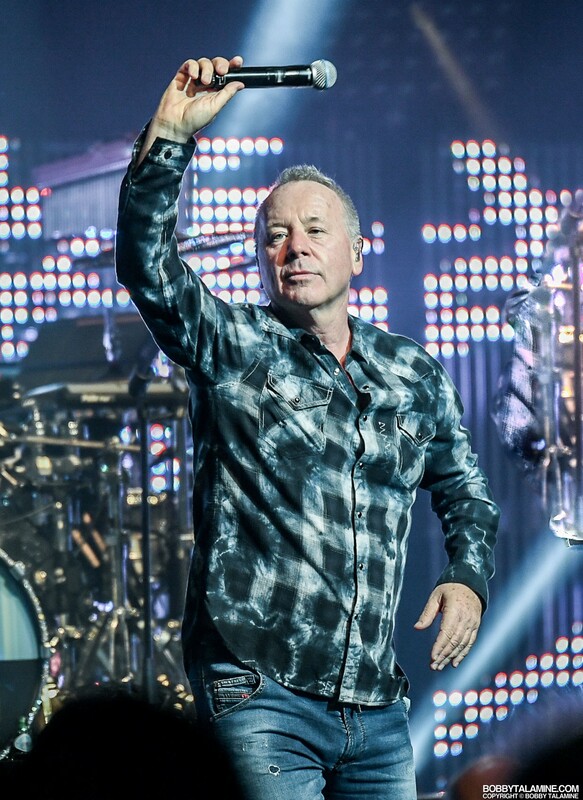 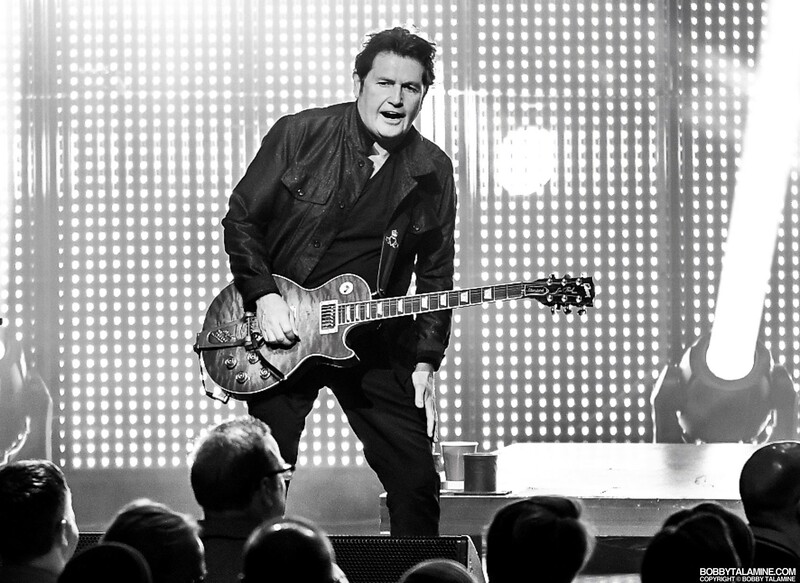 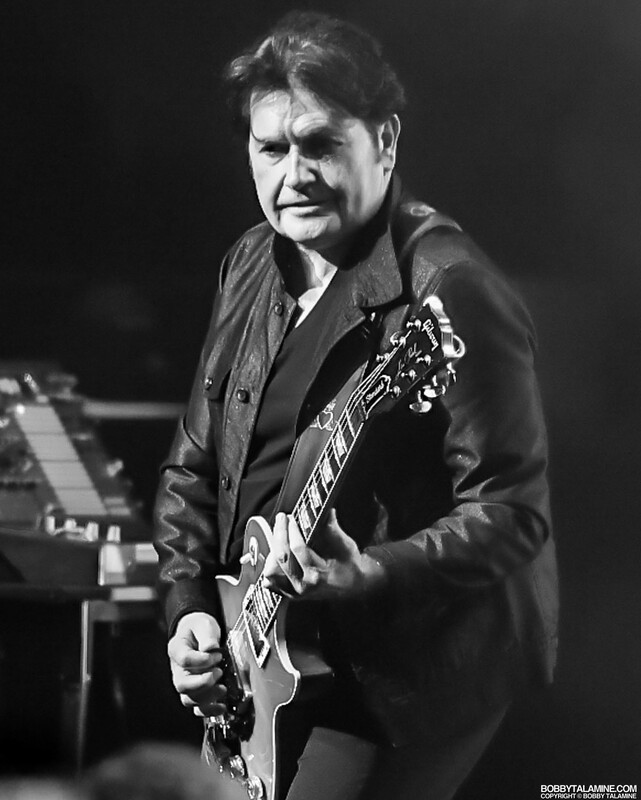 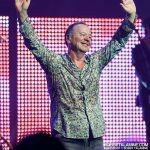 Jim was quoted as saying that the current live incarnation of Simple Minds is more inspired by the likes of Sly and the Family Stone than just a traditional rock band, evident in the powerful female accompaniment, and not one weak link in the bunch. 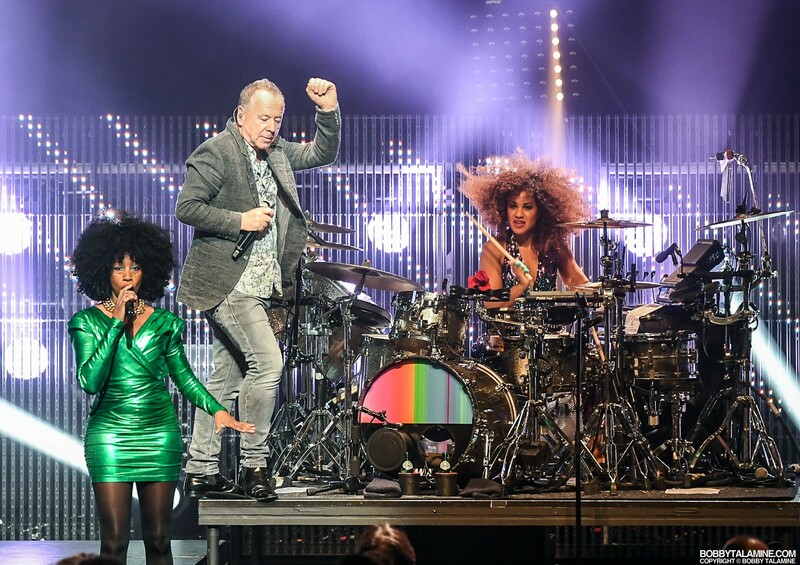 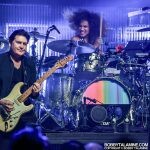 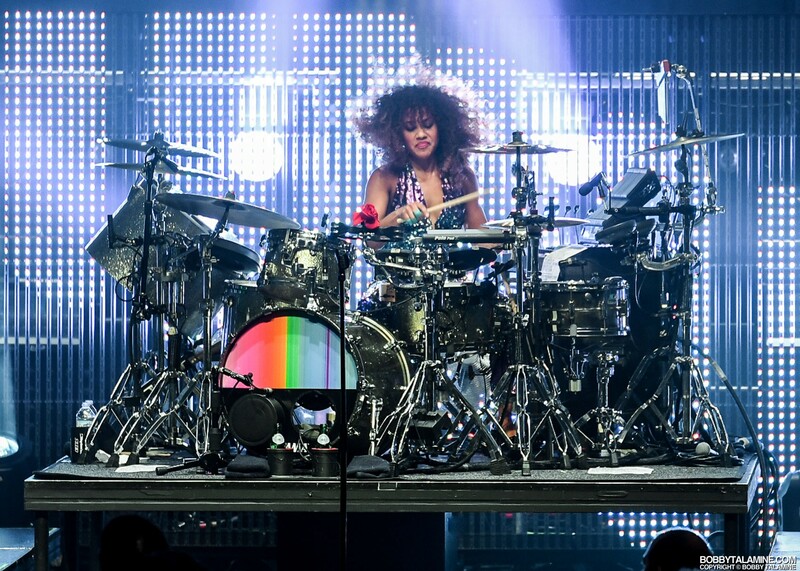 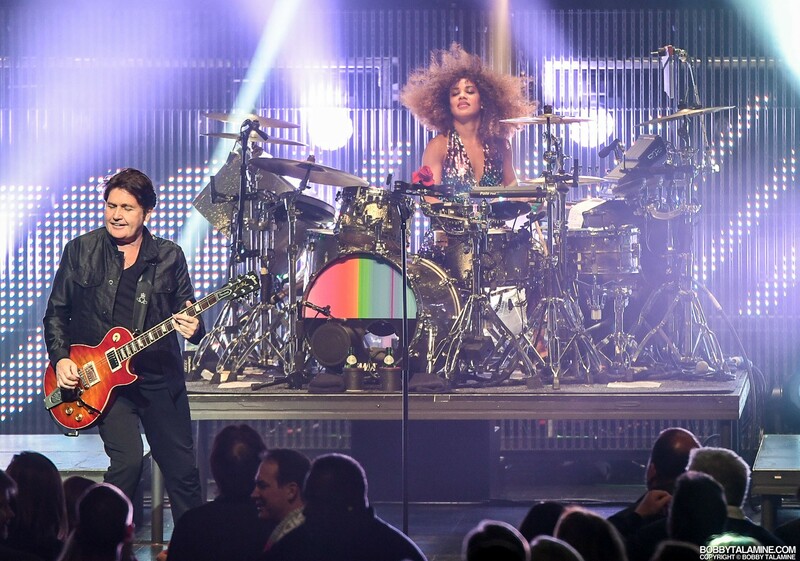 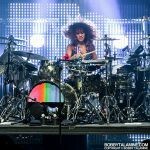 Case in point: Simple Minds drummer Cherisse Osei. 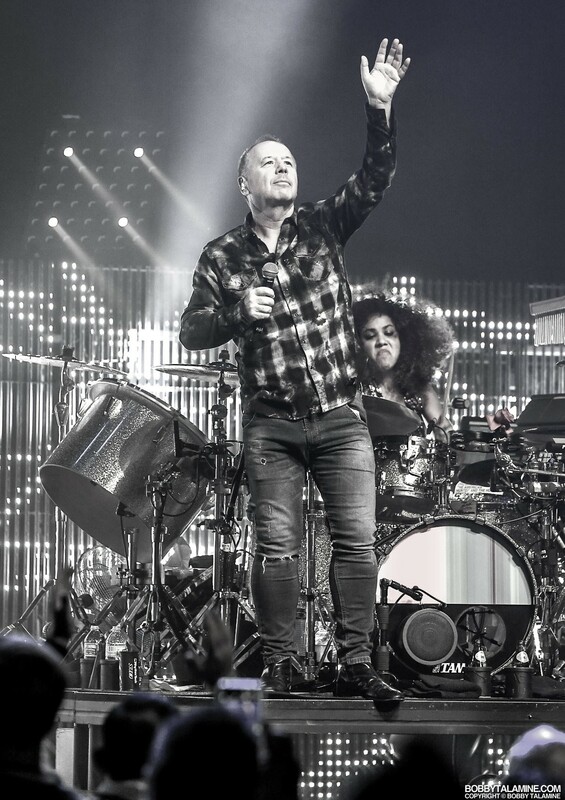 When you think Simple Minds and drumming, you think physical, with a lot of punch, courtesy of Mel Gaynor, drummer for Simple Minds through the heavy hitters “New Gold Dream” and Sparkle in the Rain”, amongst others. 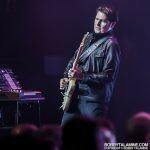 Hard to emulate that when touring. 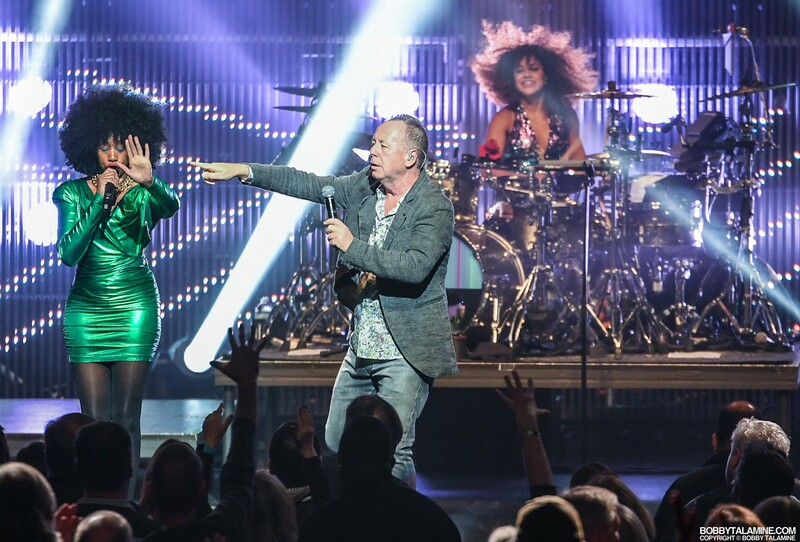 And yet Cherisse succeeds in spades, proving once again that Jim and Charlie know what they’re doing when picking players to deliver on such iconic songs when performing them live. 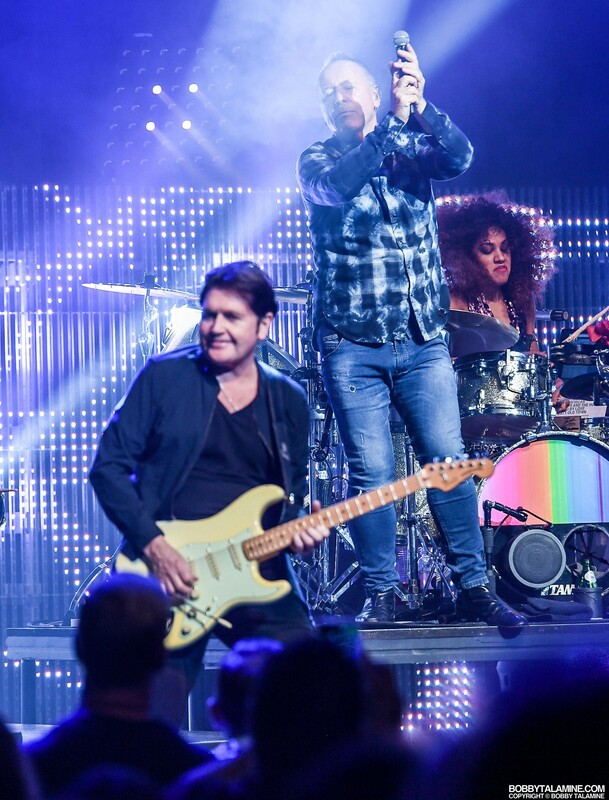 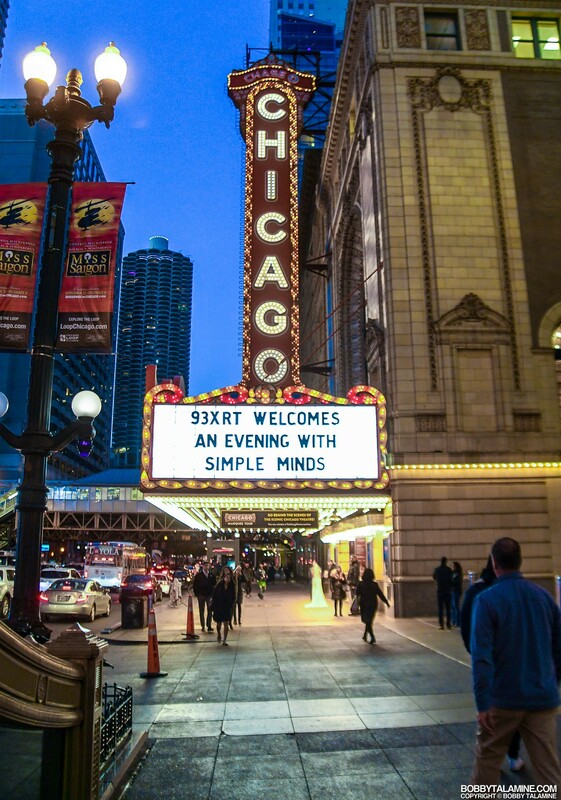 All n’ all, a wonderful and memorable performance from beginning to end, relishing to this day all things Jim Kerr and Charlie Burchill- all things Simple Minds. 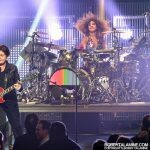 Let’s all hope that they come back to the states, sooner rather than later. 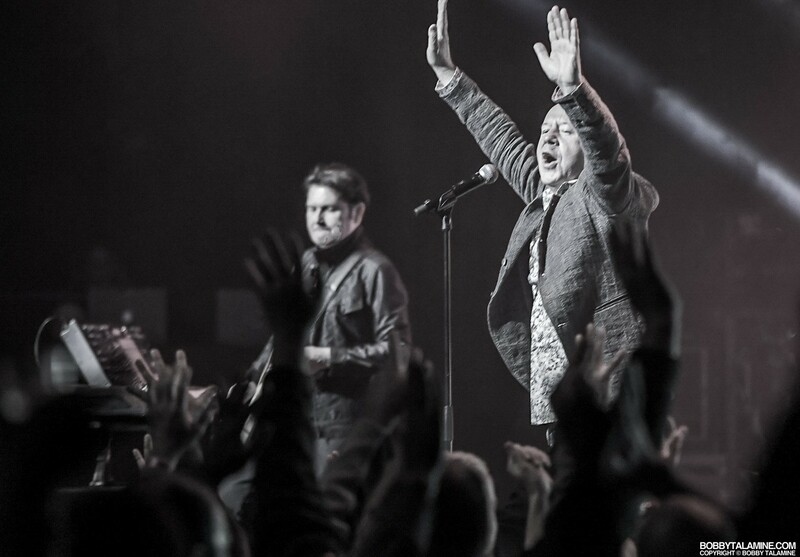 They are that engaging, that entertaining. 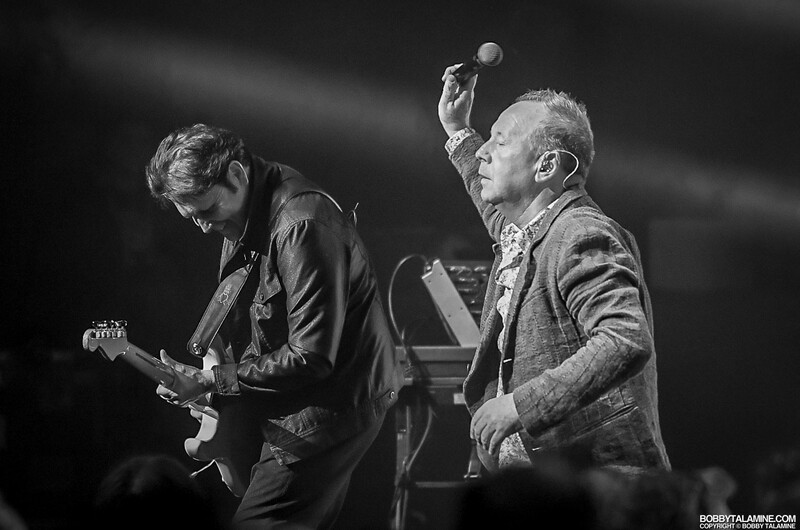 A special band. 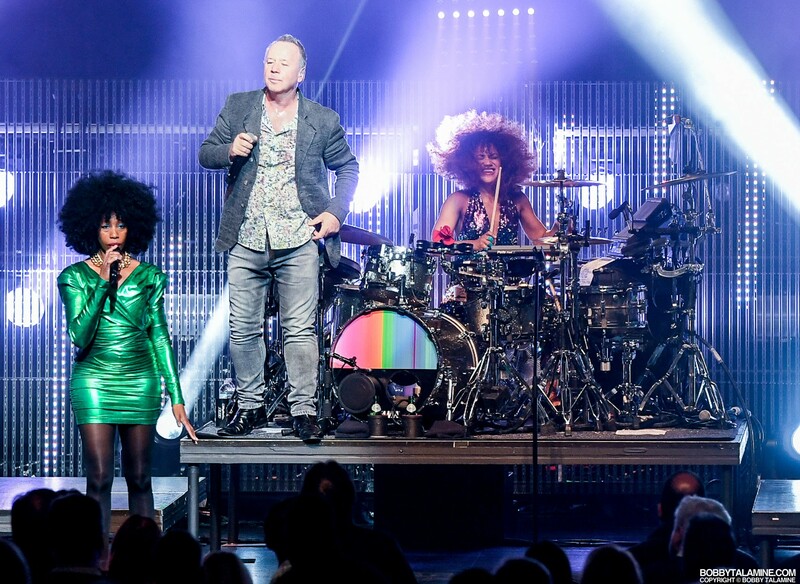 Simple Minds.